Animal Age: 16 years 11 months. 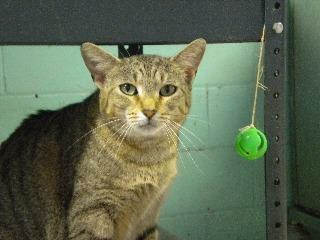 Ashton has been at the shelter for several years now, he is a very friendly cat. 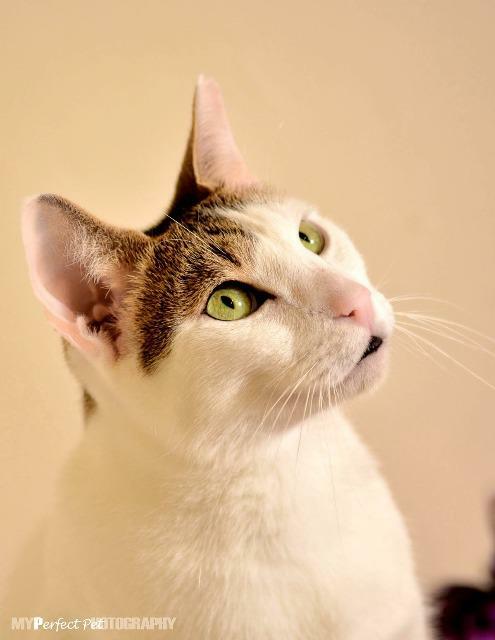 He is a beautiful all white cat with green eyes who likes to sit on a shelf near the door and welcome you in to his room. 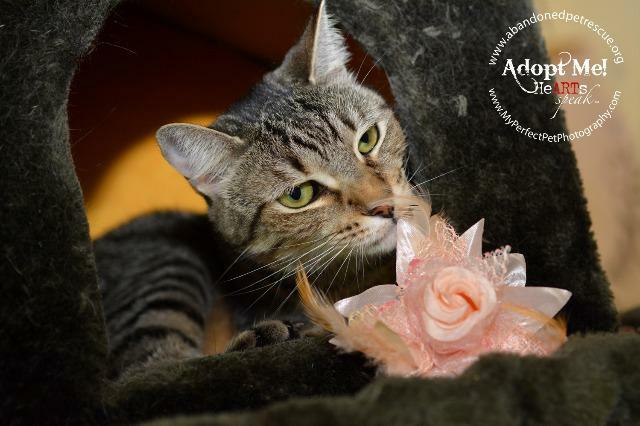 Please come see Ashton in the Cheshire Cat's Chamber room at APR any day of the week. He'll be there to greet you! Animal Age: 2 years 9 months. 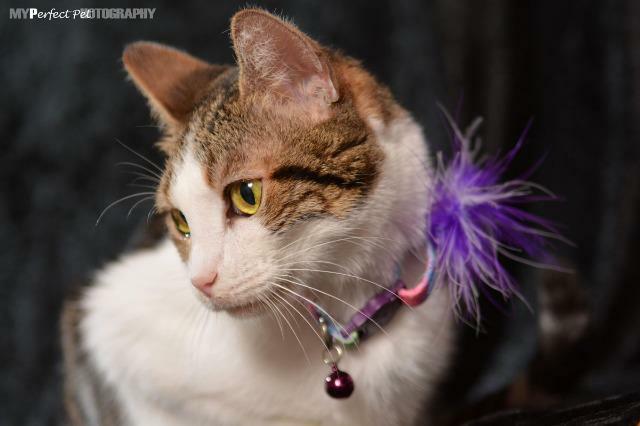 My name is Aurora, I came in as a kitten and I'm still here waiting for my forever home. Why? I'm a really sweet girl, love attention, and I also still like to play! Also I think I'm a beautiful girl! Come in and visit me! 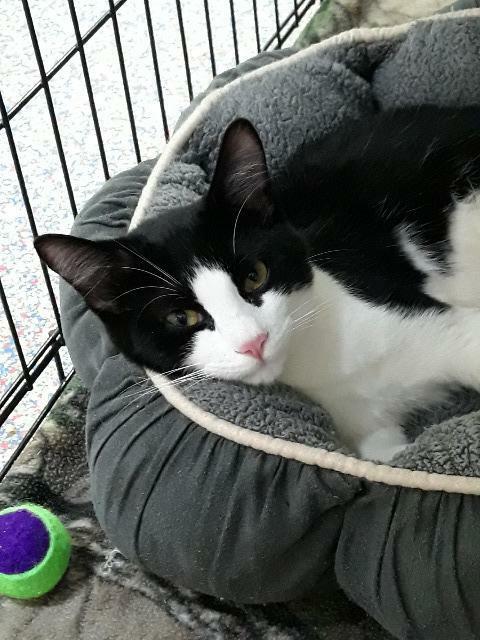 Bacardi is apart of a group of eight kittens that were all fostered together, all of the kittens have been adopted and he is the last one waiting for a home. He is a very sweet and playful little boy. Come visit him and his roommates, maybe you'll want him and one of his friends too! Animal Age: 2 years 6 months. Bates was abandoned at our front door in a carrier with his sibling. He was chipped to West Palm Beach Animal Control and never registered. 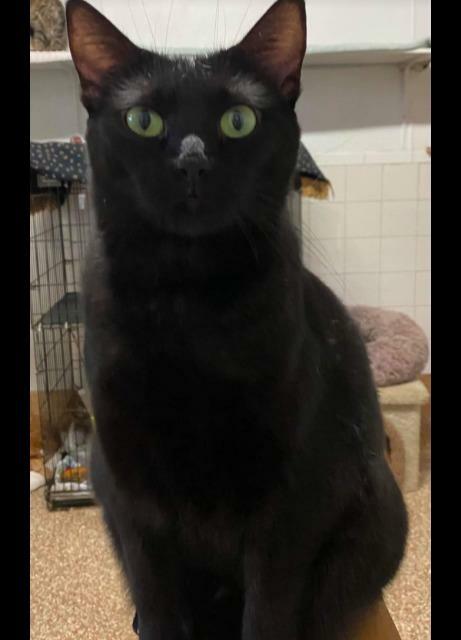 Hes a very sweet boy, always seeking out attention, his brother has been adopted and hes wondering why he is still here waiting. 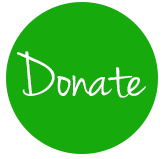 Please make Bates next home his true forever home. Animal Age: 4 years 3 months. 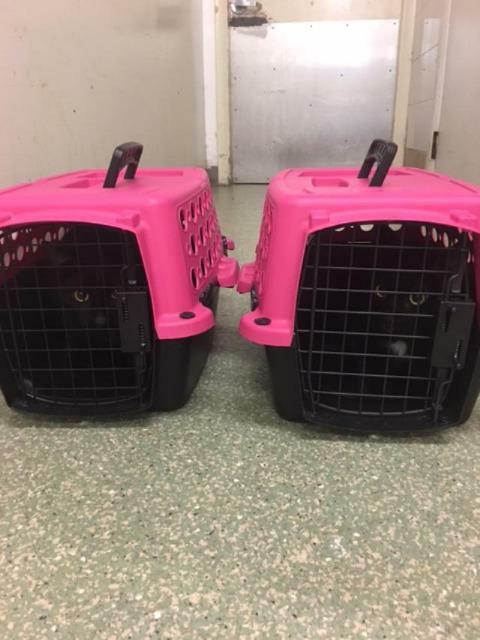 Mickey and Bayley are two siblings that were left abandoned, both are very sweet but very nervous and scared and will need time to adjust to the shelter. Come by and visit them Weds-Mon 12-5pm. Animal Age: 4 years 0 months. Belle was brought in with her brother Stalker, at first we thought they were feral and we were planning to re-release them back outside but we decided to keep her and her brother when we realized how friendly they were. 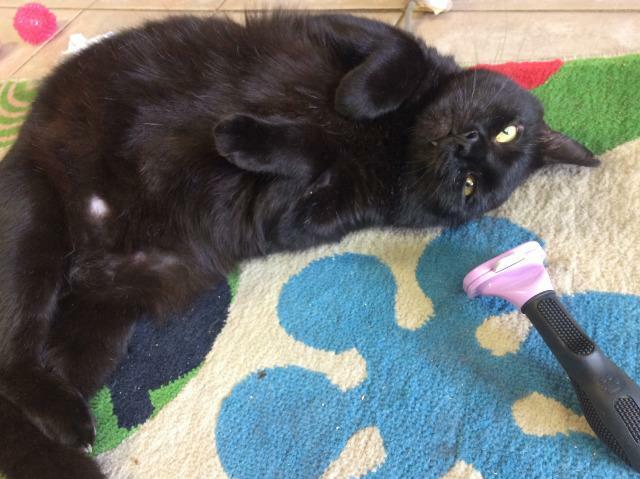 Belle mostly keeps to herself, but she has one volunteer who she really loves and comes out to be brushed and petted. 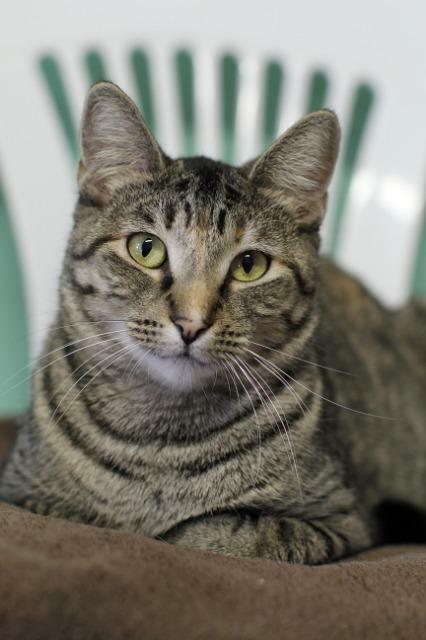 Come in and visit Belle, maybe she will be your best friend. Animal Age: 1 year 6 months. 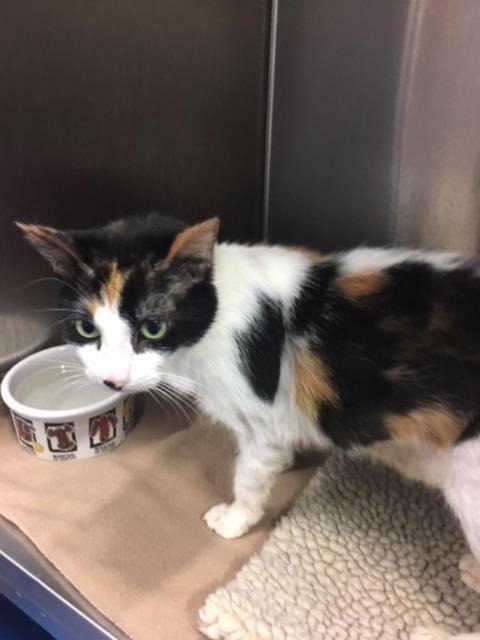 Bernette was found by a good Samaritan with some sort of chemical burn on her back. 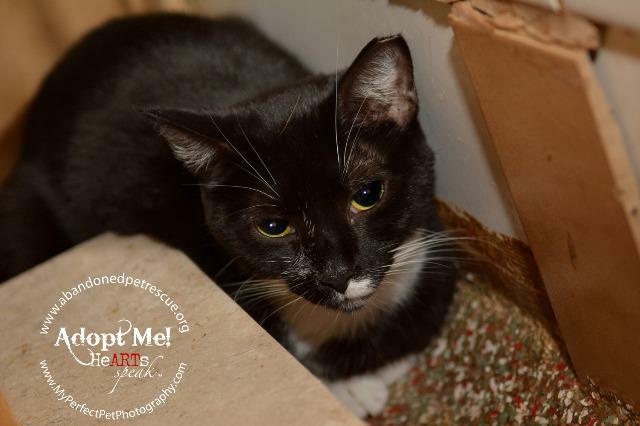 Her injury is fully healed and she is now looking for her forever home. 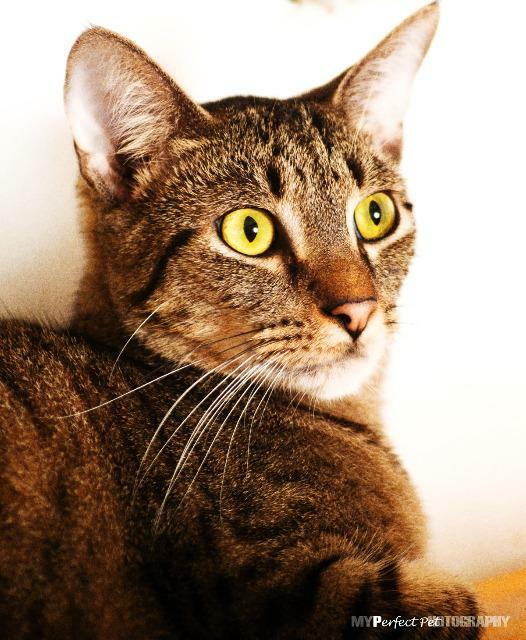 She is the sweetest most affectionate cat and loves to give love bites and play. 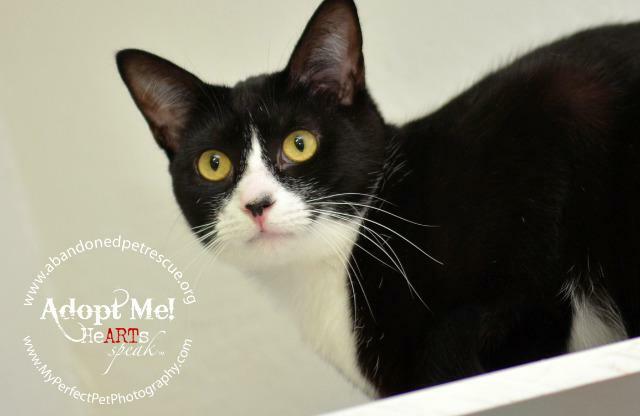 Come by and meet Bernette Weds-Mon 12-5pm. Animal Age: 1 year 5 months. Birdie was just a kitten when she came to us with her mother Dove and her four other siblings. 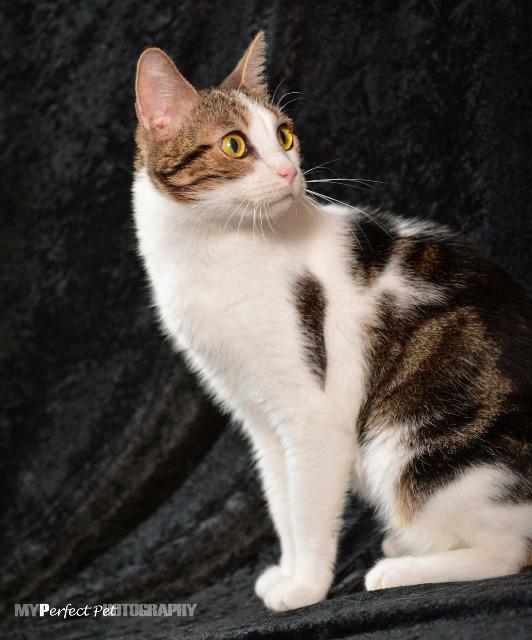 She is the most laid-back of her siblings and can often be found lounging and showing off her beautiful and unique markings. She also loves to get attention. 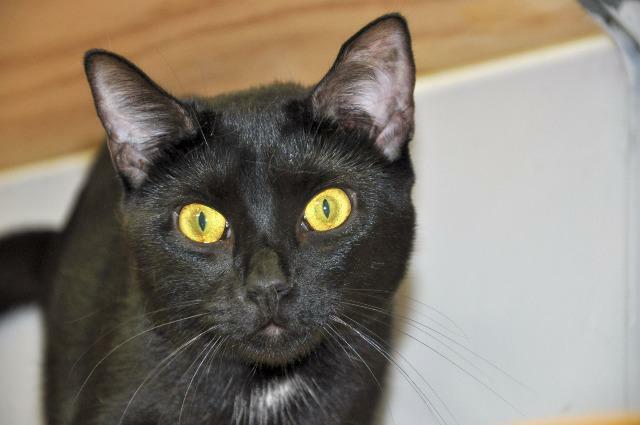 Come in and meet Birdie and her brother Sparrow Weds-Mon 12-5pm. Animal Age: 6 years 0 months. 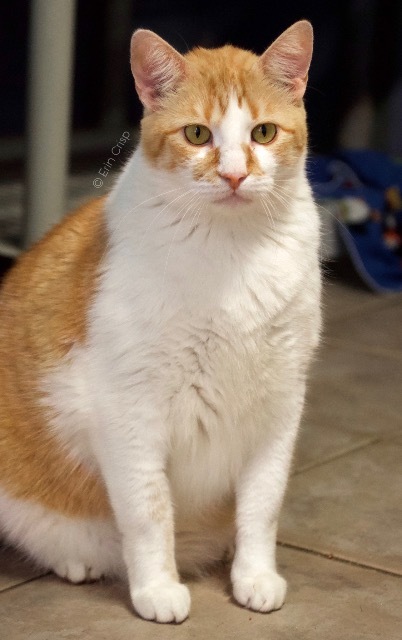 I was rescued with my three siblings when I was just a kitten, my two sisters were adopted as kittens and I'm still here waiting with my brother George. 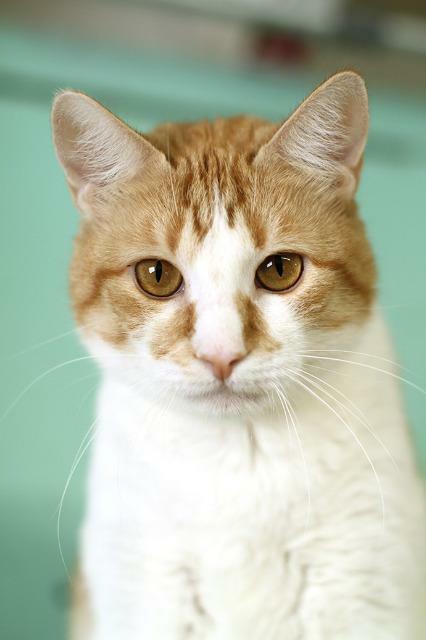 I'm a very handsome orange and white tabby and although I'm calm and quiet I do love getting some attention and love. Please come in and visit my brother and I, you'll love us! 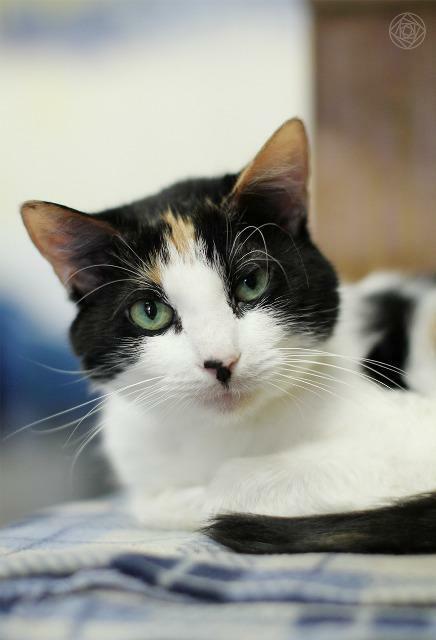 Breezy has been at APR since she was a kitten. She used to be shy and nervous around strangers which is why she was overlooked. 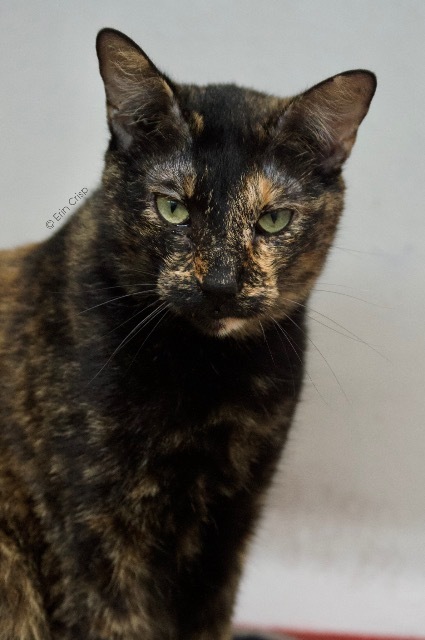 She is still alittle unsure around strangers but once she gets to know you she becomes extremely affectionate, loves to be petted, and is a bit of a clown. 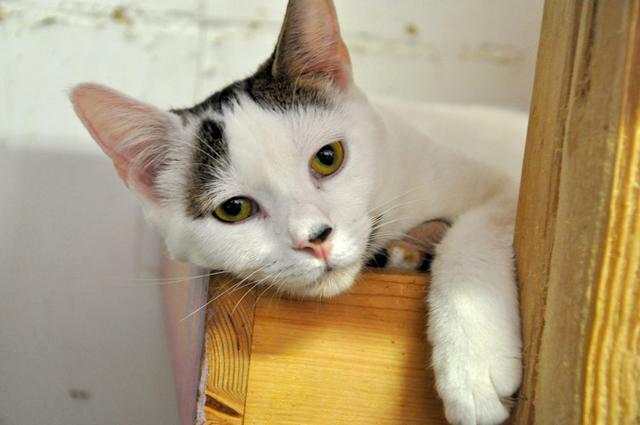 Breezy will make a gorgeous and easygoing companion. 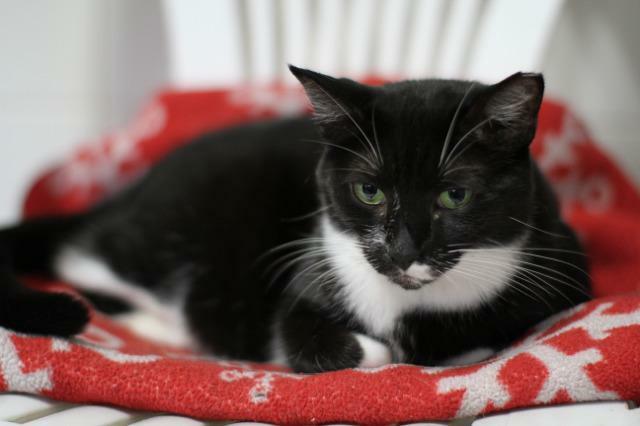 Come by and meet Breezy Weds-Mon 12-5pm. *Breezy does have medical issues, we are currently running diagnostics to find out what is wrong with her, shes wheezing so she suspect she has asthma but are not 100% sure, it could possibly be heart issues. Animal Age: 10 years 0 months. 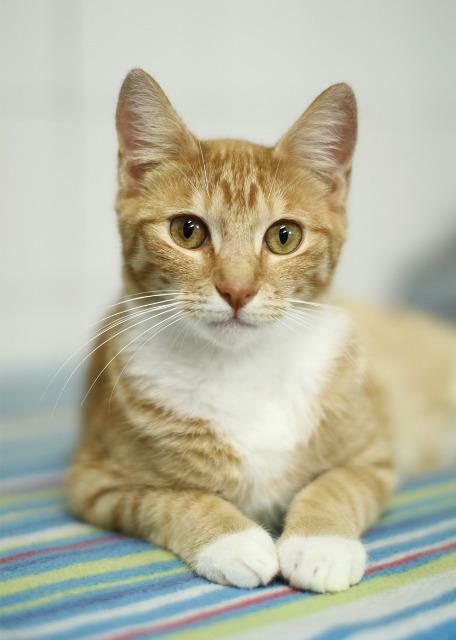 Bubba and his brother Forrest are two sweet playful kittens looking for their forever home. Please come in and visit Weds-Mon 12-5pm. Animal Age: 7 years 9 months. 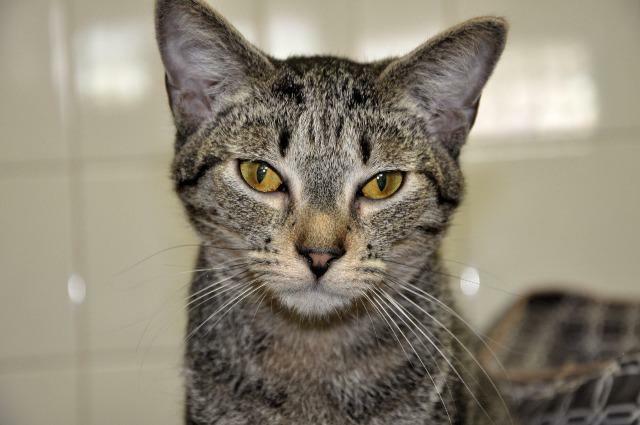 Burrita and her sisters were trapped as kittens from a feral colony in western Broward County. The girls were so young there was no way we could put them back so they are now looking for forever homes. 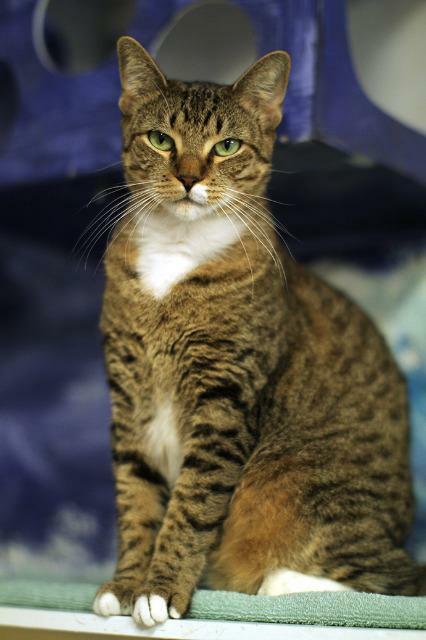 Her 2 sisters have been adopted,but Burrita is still waiting. 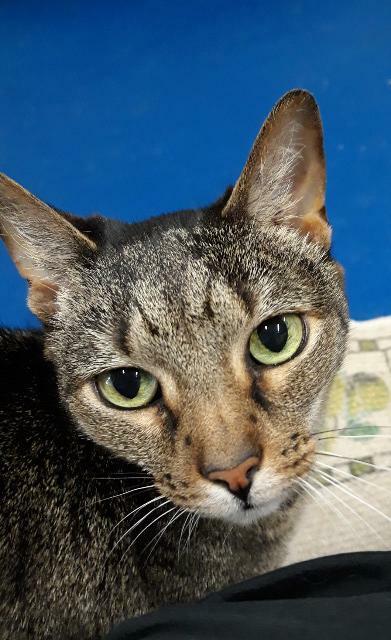 She is a sweet girl who is a little shy at first but loves attention. Come by and meet her Weds-Mon 12-5pm. Animal Age: 9 years 1 month. Canoli is one of five kittens found as strays with their mother. Mom is a bobtail or manx and some of her kittens inherited the bobtail. They are all extremely cute and are ready to find their forever home. Come visit them Weds-Mon 12-5pm. Animal Age: 11 years 11 months. Chai is a female cat left outside after her house burned down. 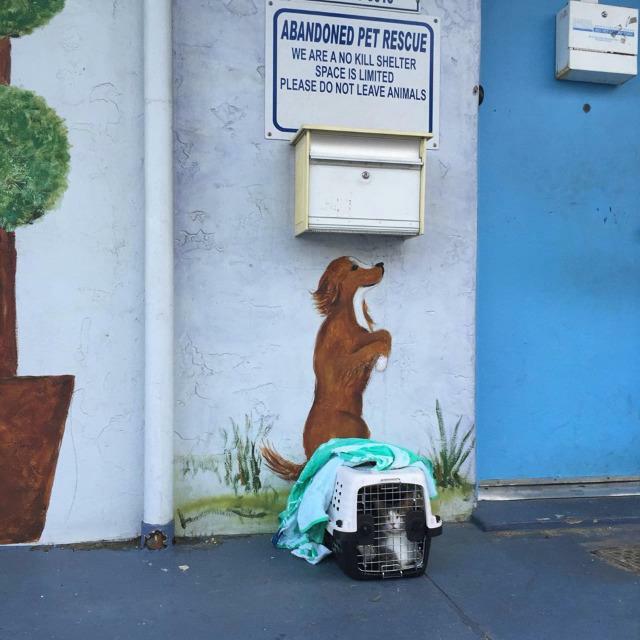 Even though someone was taking care of her, they left her on the shelters doorstep. 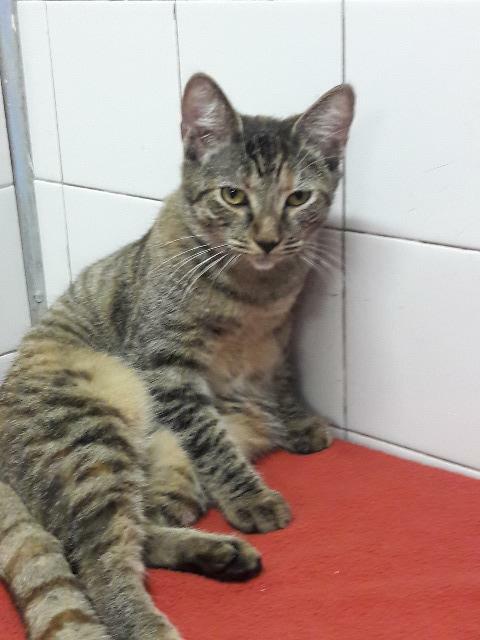 That was years ago, Chai is still here waiting, we have her in a small quiet room with two other cats because she does not like other cats. Even though she shares a room with two cats she has her own space where she hangs out and can hold her own when the others start teasing her. 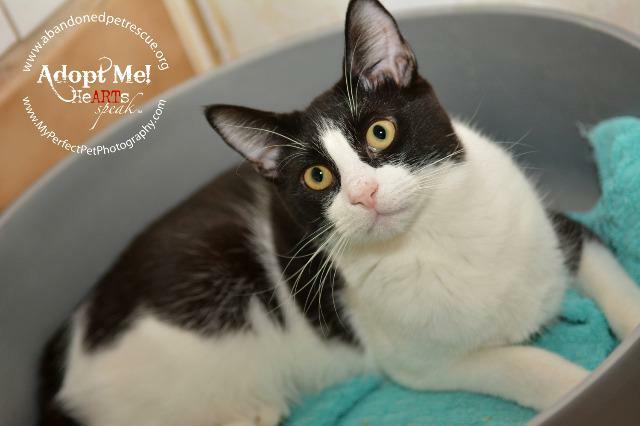 She is very sweet and quiet and loves affection but only when shes in the mood for it. She would do better in a home with no other cats or maybe just one or two who would leave her alone, no dogs, and no children. She just wants a nice quiet place to call her own. 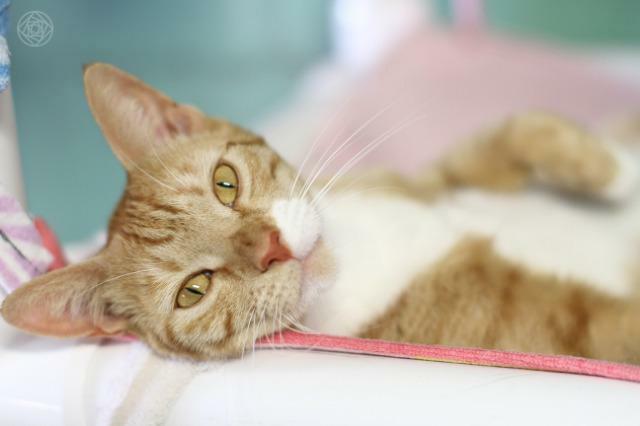 Come by and meet Chai Weds-Mon 12-5pm. 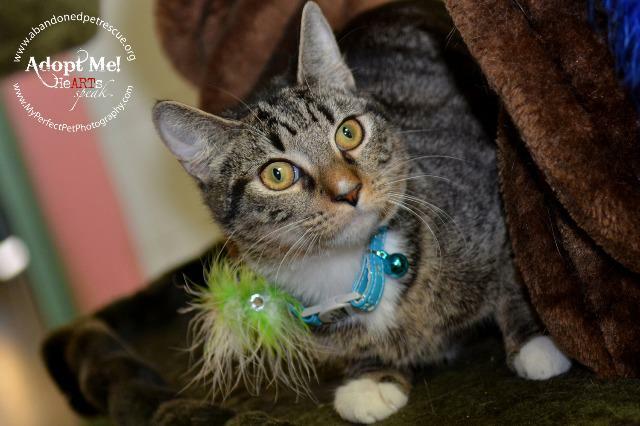 Chicklet was found as a stray and is as cute as can be! She is still too young to be adopted but is currently accepting applications. Come visit Chicklet Weds-Mon 12-5pm. Animal Age: 5 years 11 months. 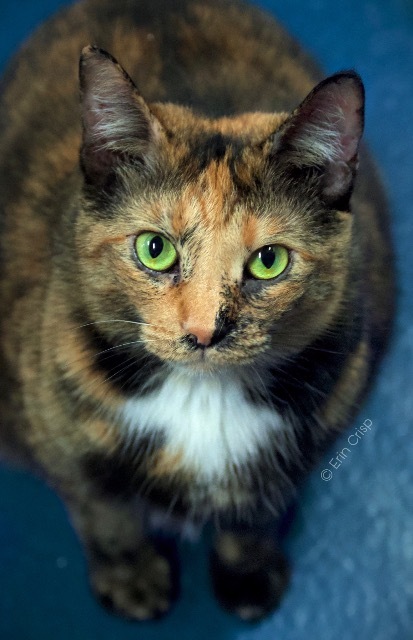 Christy was left at our shelter when she was a kitten, she was adopted out and then returned two times in her two years of life. First time was because the other cat in home didn't like her, second time was because she was urinating on furniture which she still does her. We think it may be due to stress, and feel maybe with an an-anxiety medication she would do better. She is a very sweet girl but likes to keep to herself. Come by and meet Christy Weds-Mon 12-5pm. 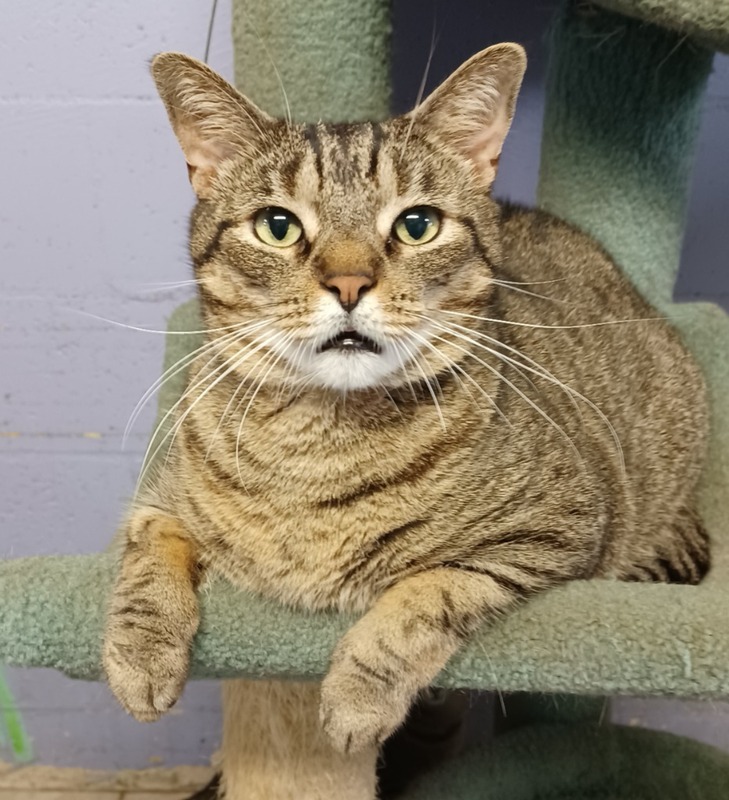 Cody's story is a sad one, he was dumped at our door one morning with a note saying he had a urinary blockage and the owner could not afford to care for him. Thankfully our doctor was due to come in that day and she was able to get him unblocked. 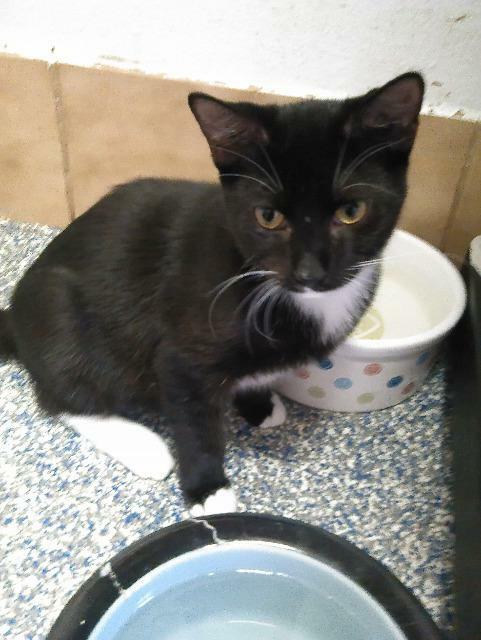 He will have to be on special urinary food for the rest of his life, currently we have him in a room that is on a Purina Urinary dry diet with wet food that has no fish in the ingredients and we are hoping this diet will work for him like it has for one of our cats at the shelter with the same issue. 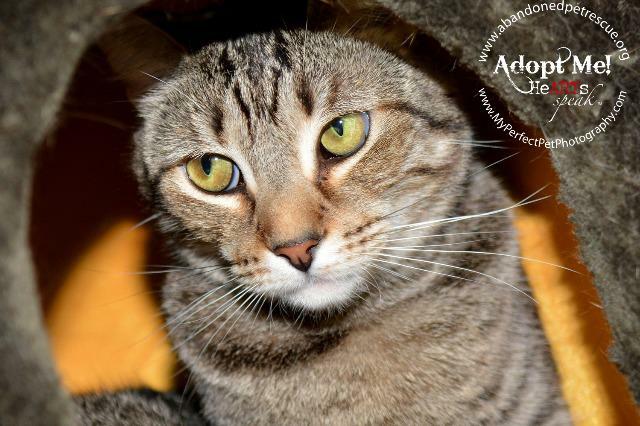 Cody is extremely sweet and loving, he just craves attention. 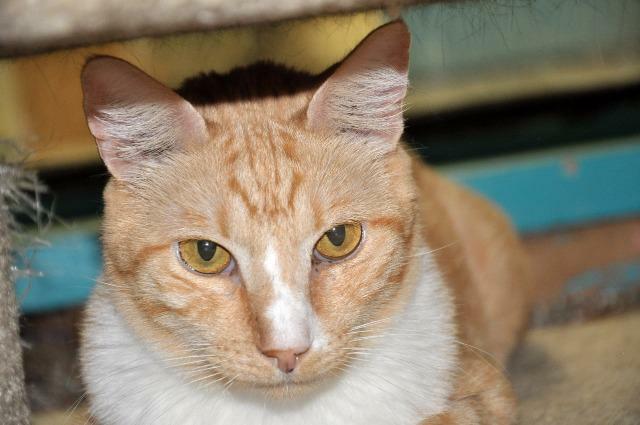 If you would like to visit this sweet boy come by our shelter Weds-Mon we are open 12pm-5pm. 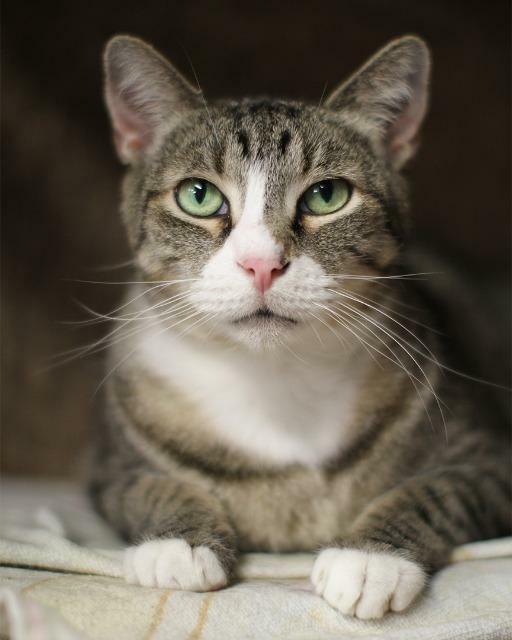 Connie was adopted from us years ago as a kitten and returned recently for urinating outside of the litter box. 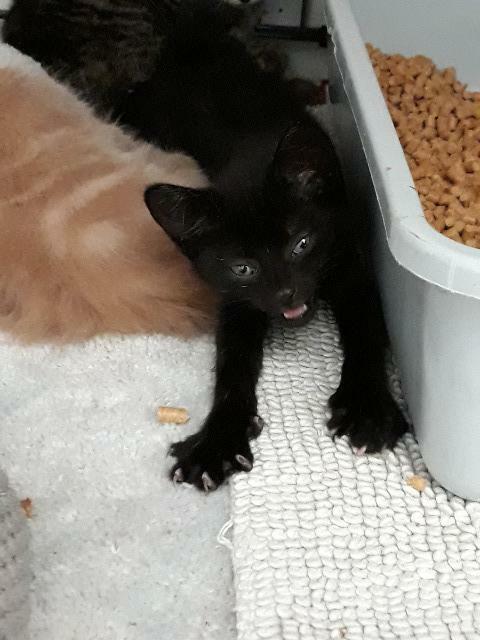 We are not sure what has caused this but she seems to be going in the litter box here at our shelter. 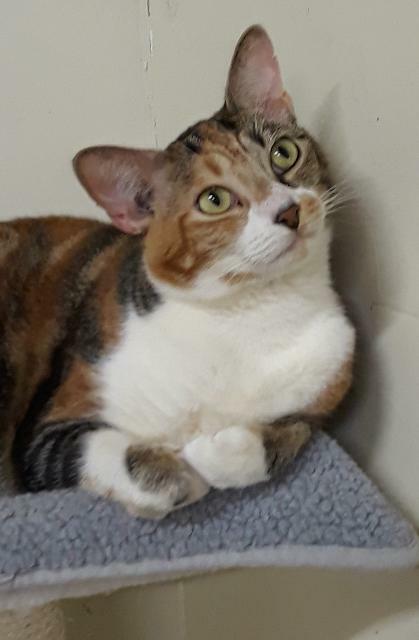 Shes very sweet but still very nervous being at the shelter. Come meet Connie Weds-Mon 12-5pm. Cranberry was found on the side of the road with a really bad eye infection when she was a tiny kitten. 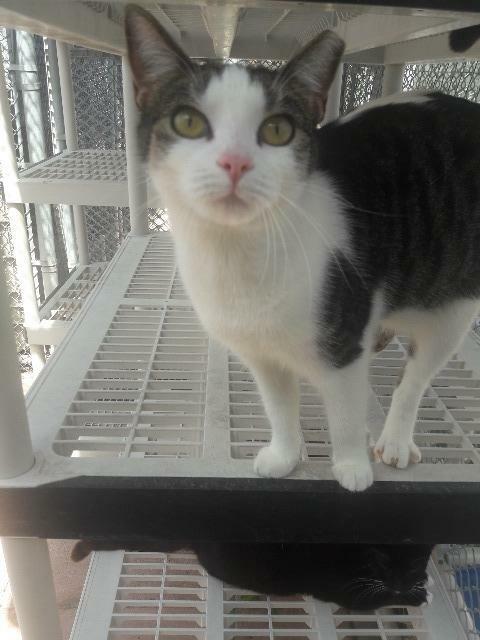 She is still here looking for her forever home, she is an extremely sweet girl with beautiful green eyes. Come by and meet her Weds-Mon 12-5pm. CreamPuff is one of five kittens found as strays with their mother. Mom is a bobtail or manx and some of her kittens inherited the bobtail. 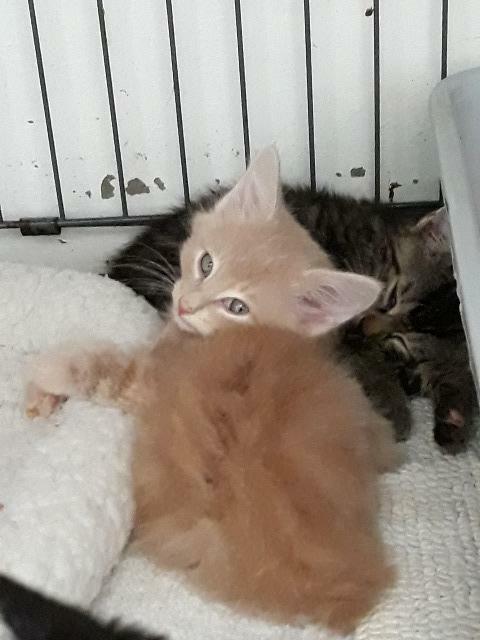 They are all extremely cute and are ready to find their forever home. Come visit them Weds-Mon 12-5pm. 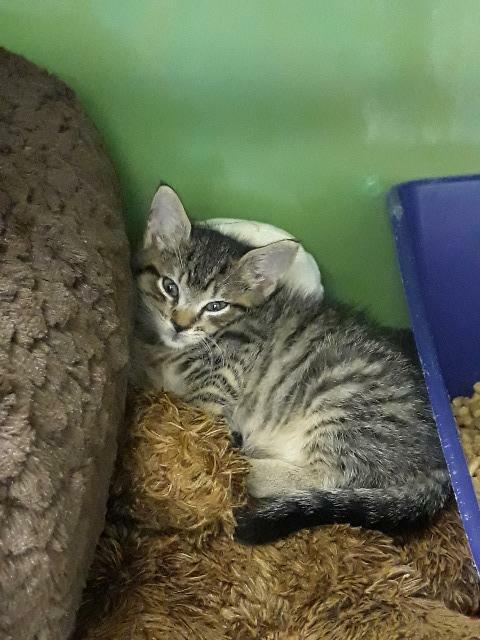 Croissant is one of five kittens found as strays with their mother. Mom is a bobtail or manx and some of her kittens inherited the bobtail. They are all extremely cute and are ready to find their forever home. Come visit them Weds-Mon 12-5pm. Animal Age: 4 years 11 months. 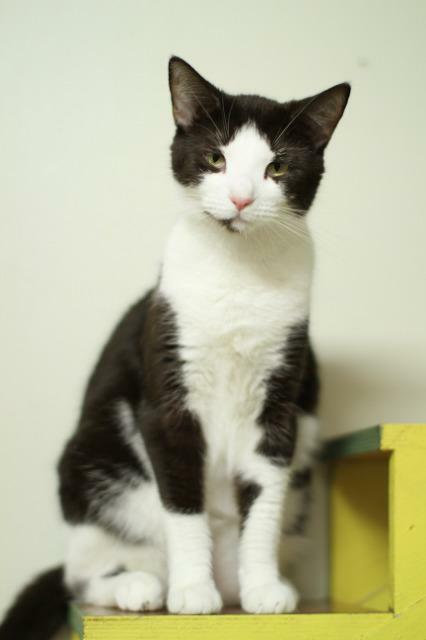 Doublestuff has been with us since he was a kitten, hes a very laid back guy and would just love a home to lounge around. He has been here since he was a baby so it may take a lot of time for him to get use to his new home. Come by and meet Doublestuff Weds-Mon 12-5pm. . Animal Age: 2 years 3 months. 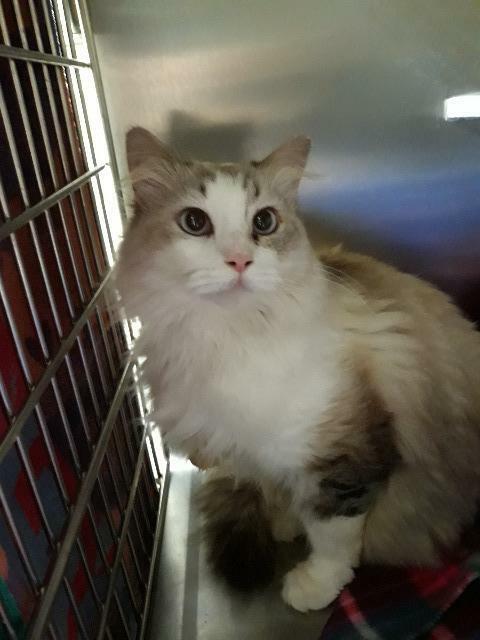 Beautiful Dove is FIV (Feline Aids) positive, she can live an nice long healthy life and it is nice transmittable to humans. It can be passed to cats but only if she bites another cat. 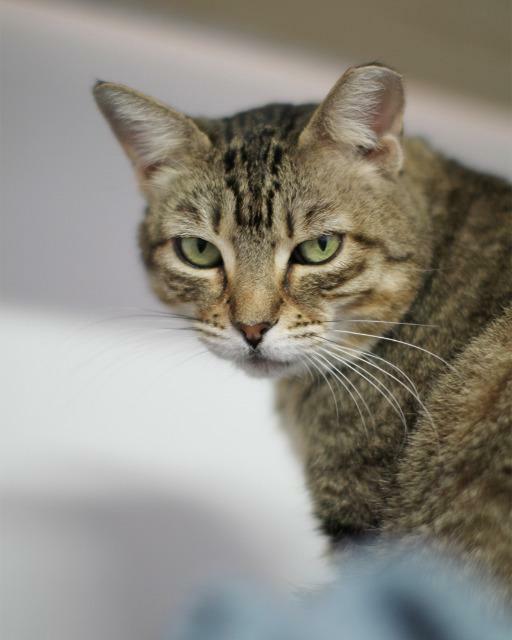 She is an extremely sweet affectionate cat and has never had any issue with other cats. 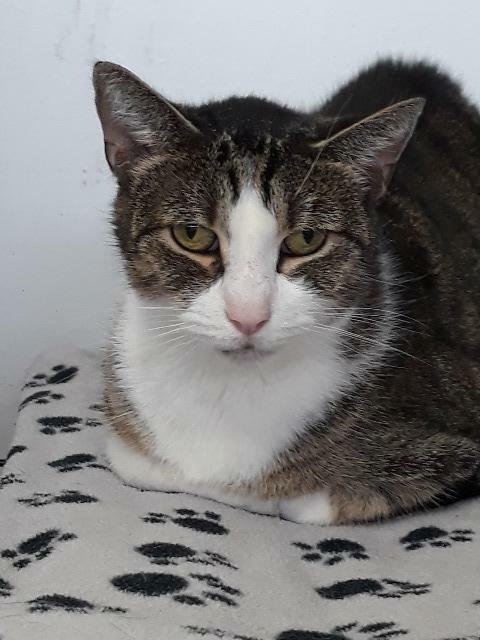 She had four babies when she first came to us and all of them tested negative for FIV, two of them are still here looking for their forever home, Birdie and Sparrow. 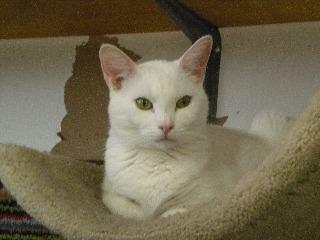 Come by and visit Dove and her family and also her roommates Manny & Sneaky Pie Weds-Mon 12-5pm. Animal Age: 13 years 2 months. We used to think Duke/Princess was female. It has been discovered that she is a he - but we still call him Princess! 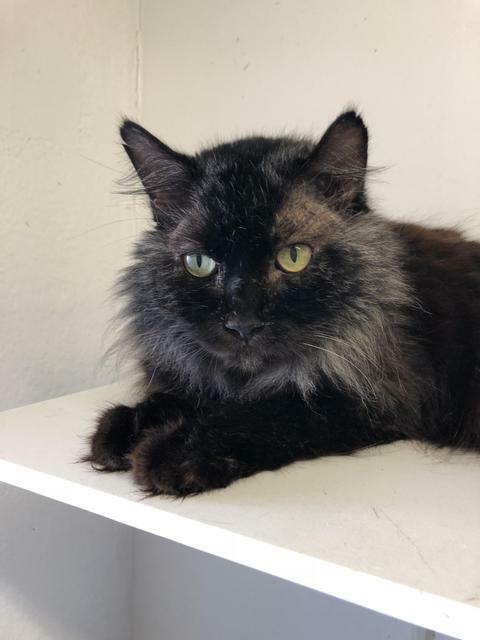 Duke/Princess is a bit shy around people, but once he gets to know you he becomes your best friend He is a stunning long-haired tabby who loves to play and will cuddle with just the right person. Maybe it could be you? 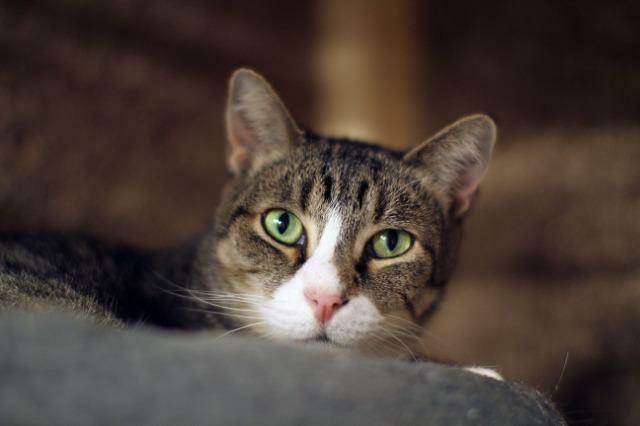 This stunning senior cat is still active and agile. Stop by and see Duke/Princess Weds-Mon 12-5pm. Eclair is one of five kittens found as strays with their mother. Mom is a bobtail or manx and some of her kittens inherited the bobtail. They are all extremely cute and are ready to find their forever home. Come visit them Weds-Mon 12-5pm. 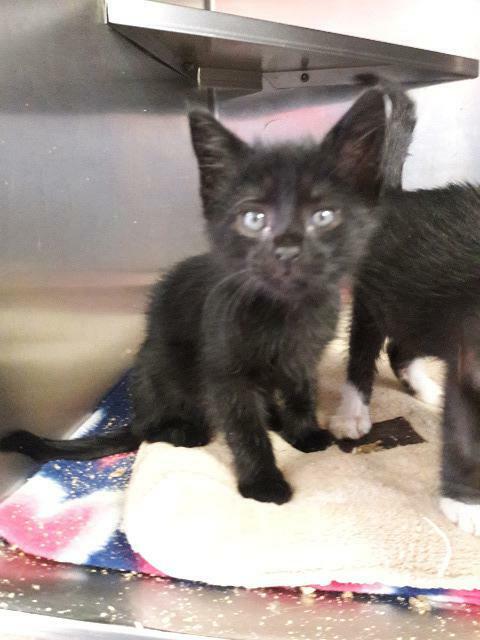 Eva and her siblings were found running in a back alley way. She is a little more shy than her brother and seems to be an independent type of cat. But she still loves to play like any other kitten. Come visit Eva Weds-Mon 12-5pm. Animal Age: 9 years 11 months. 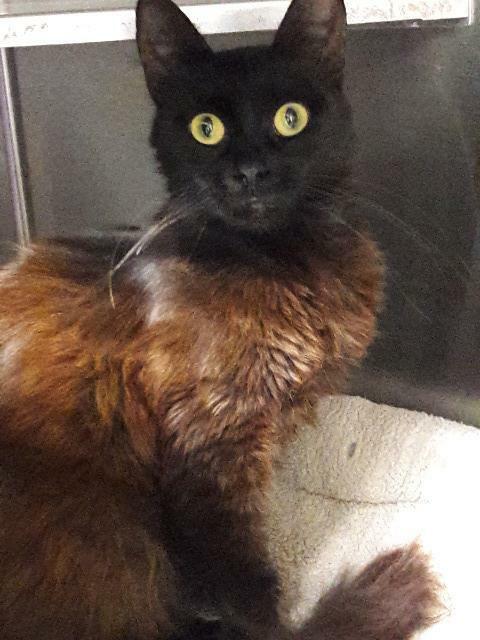 Evie is a very sweet girl that was found in the local neighborhood. She is always seeking attention from people and does not let the other cats invade on her "me" time with someone. 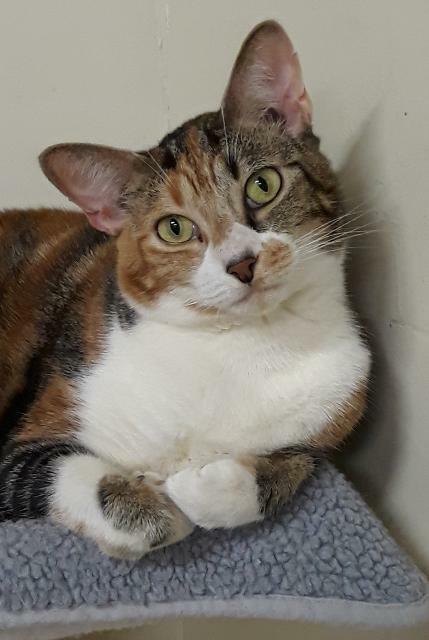 She would probably do best in a home with not so many cats or maybe just by herself so she doesn't have to share you with anyone. Could that be you? 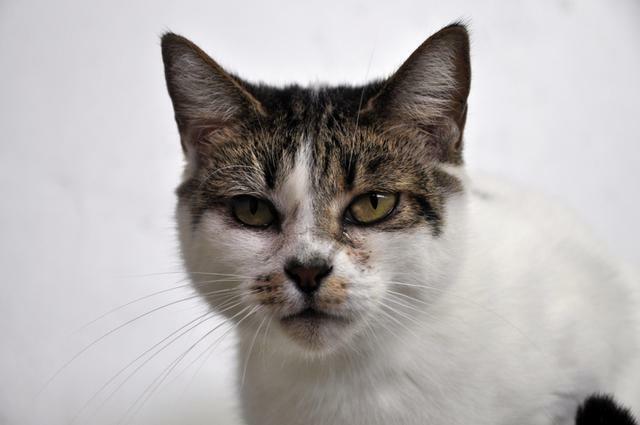 Come in and visit Evie Weds-Mon 12-5pm! 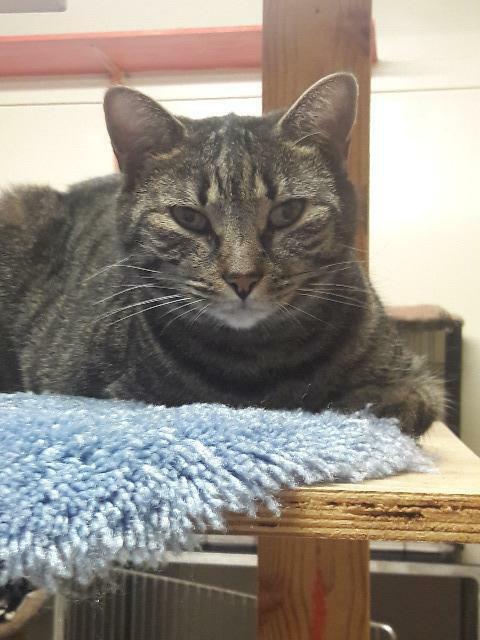 Evilynn has been at our shelter for many years, she likes to keep to herself and likes to be petted for just a short while. We think she may of been called EVILynn because her face looks like shes always mad, but she doesn't seem to have a mean bone in her body. Come meet Evilynn Weds-Mon 12-5pm. 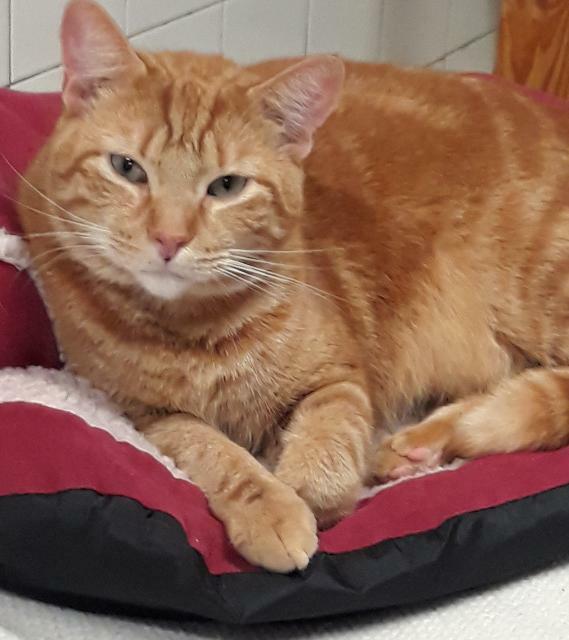 Farley has been here since he was just a kitten, he use to be really shy and scared of loud noises but since hes grown up at the shelter he has come out of his shell. 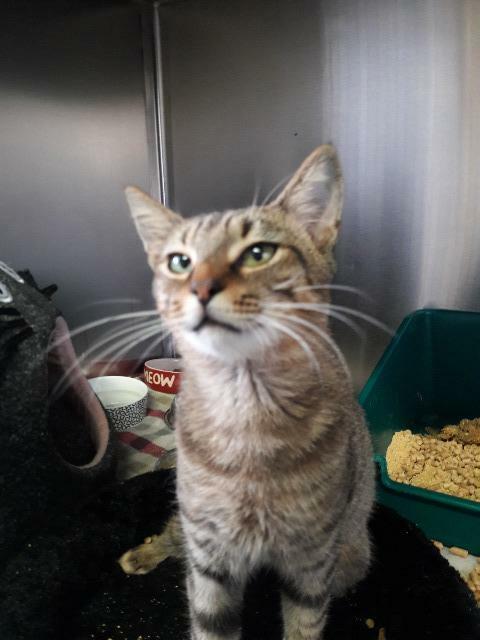 Hes a very sweet boy, when you go to pet him he still acts shy by putting his head down but he knows he loves it. 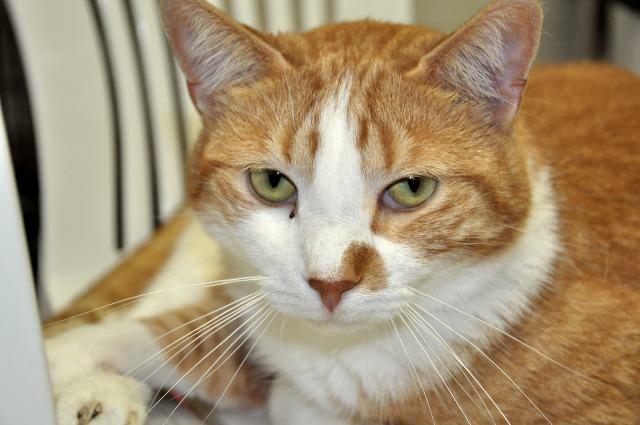 If you are looking for a sweet shy boy come in and visit Farley Weds-Mon 12-5pm. Animal Age: 1 year 9 months. 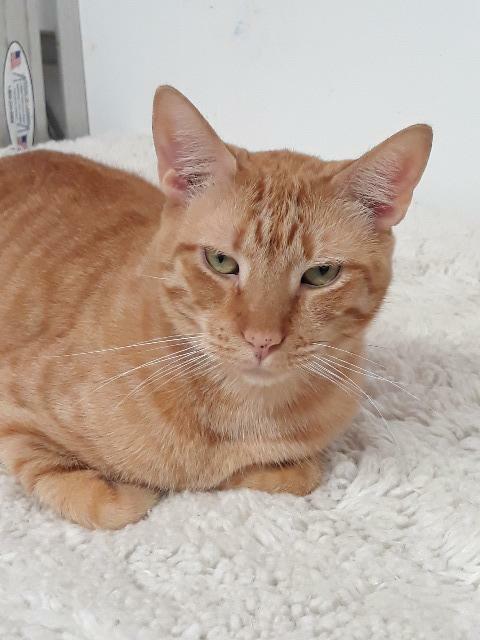 Fergal is a gorgeous red classic tabby, he was brought in as a stray and he was so terrified but when you go to pet him he just melts into your touch. 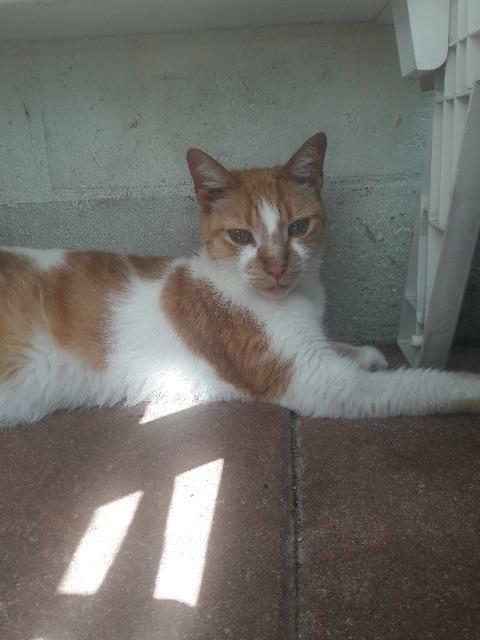 We don't know his story but he seems to of had some contact with humans in his life because he is not fully feral. 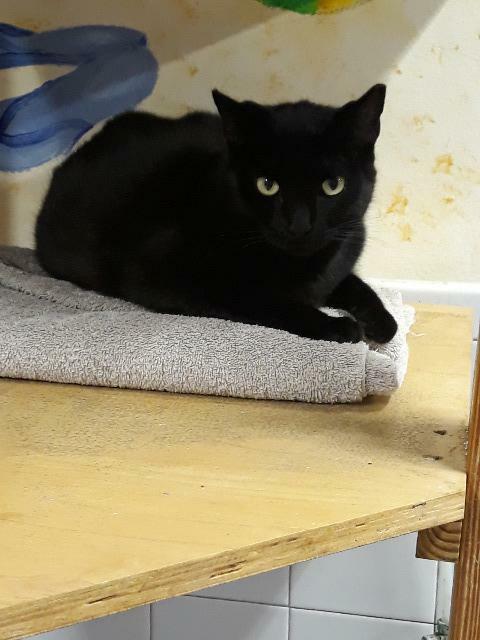 He does get nervous very easy and is shy so we recommend that he doesn't go to a home with no young children, he would need a nice quiet stress-free place to call his own. 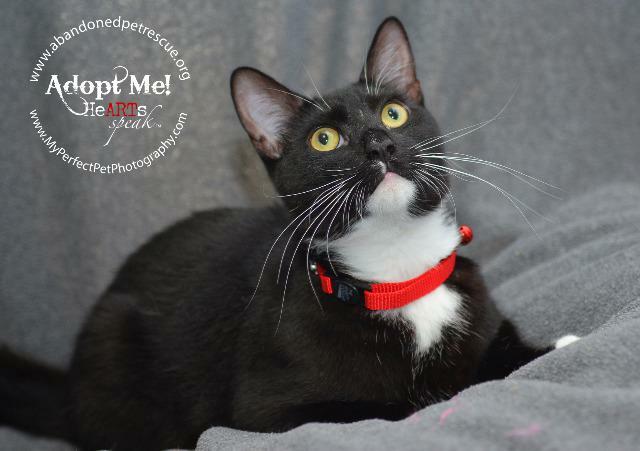 Come in and meet this little lovebug! Weds-Mon 12pm-5pm. 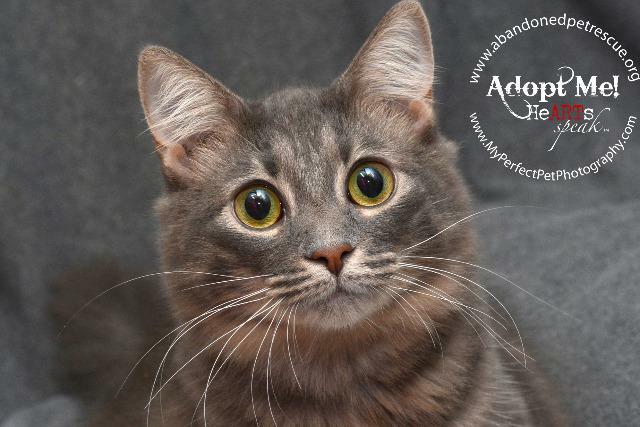 Forrest and his brother Bubba are two sweet playful kittens looking for their forever home. 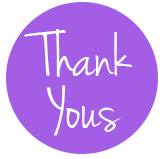 Please come in and visit Weds-Mon 12-5pm. 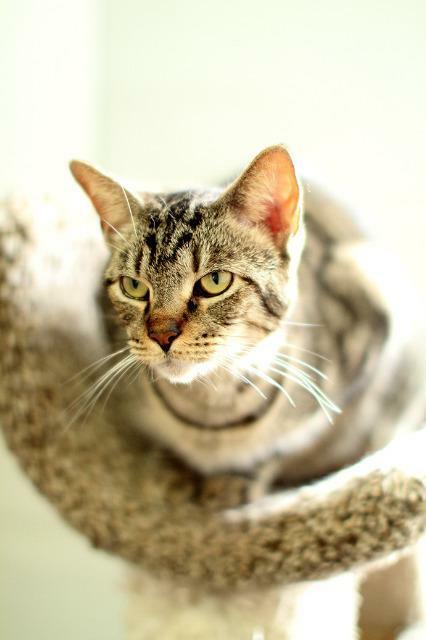 Grace was surrendered by her owner when she was really young with her sibling Will. 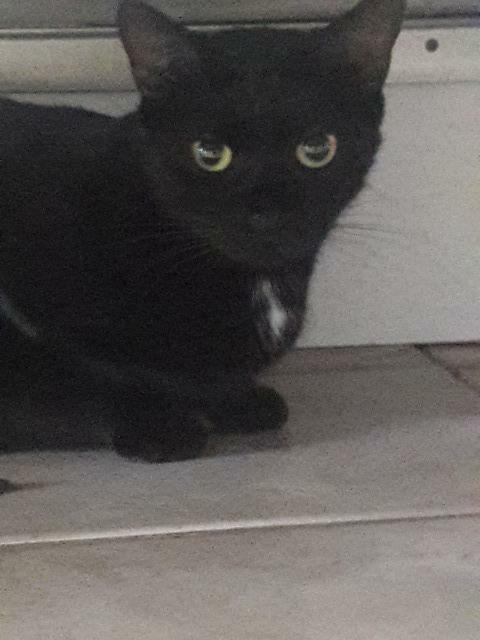 Will has long been adopted but Grace is still here, she is really shy which is why shes been over looked. 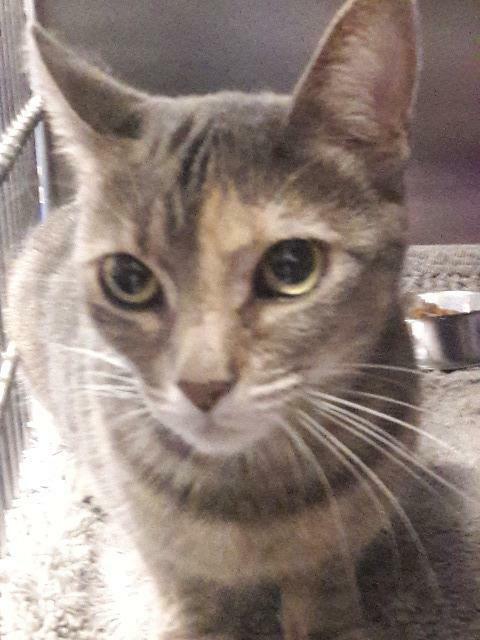 Unfortunately after such a long time being here shes gotten comfortable with shelter life and has some feline friends she likes to hang out with. 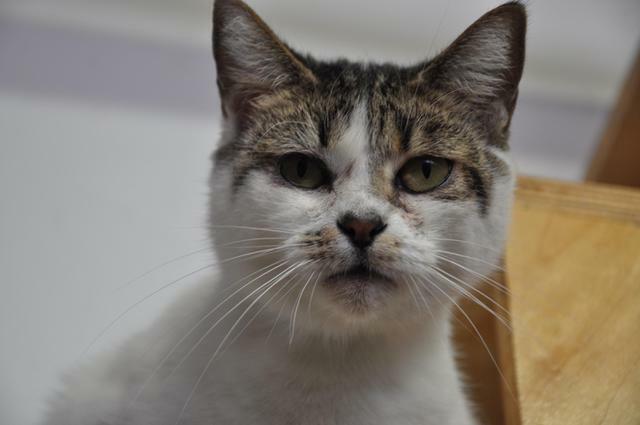 She will need a lot of love and patience if she ever finds the right loving home. Come in and visit Grace Weds-Mon 12-5pm. Animal Age: 10 years 5 months. 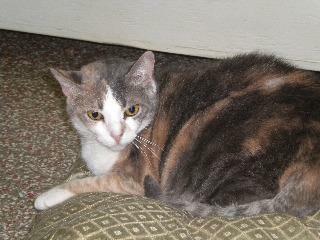 Gracie has been a resident at the shelter for several years but never really was very comfortable. She would get to a high place in whatever room she was in and not come down to play and eat with the other cats. She was adopted a few years ago but then soon returned because the person was moving out of state and did not want to take her to a new location. 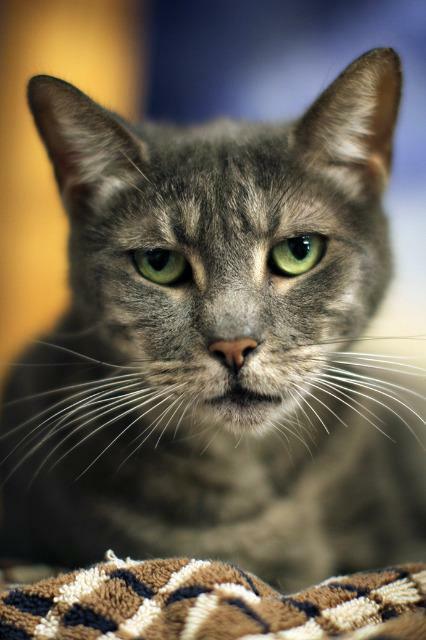 Gracie is very sweet ,but timid and does not like confrontation and would prefer to be the only cat in a home. 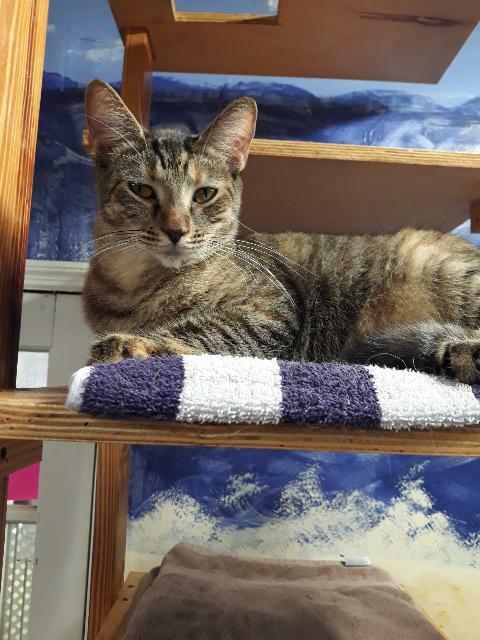 Please come by and visit her especially if you are only looking to have a one cat household. 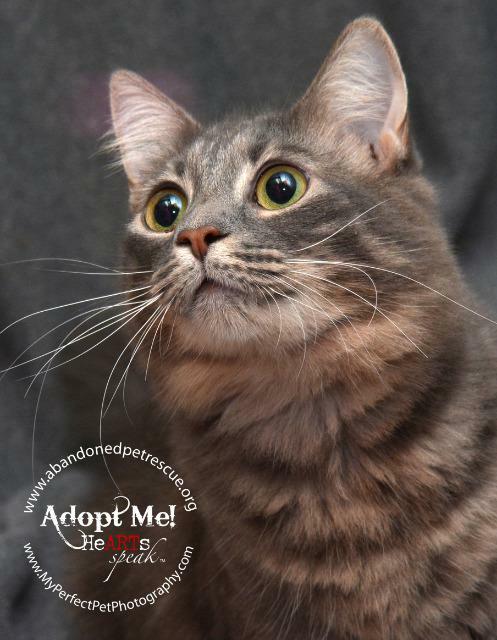 Come by and meet Gracie Weds-Mon 12-5pm. 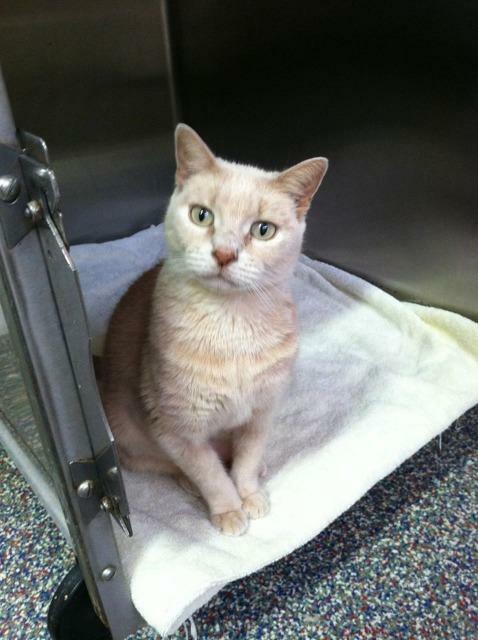 ***Gracie does have medical issues, she is currently on medication for thyroid issues. Gumdrop is one of five kittens found as strays with their mother. Mom is a bobtail or manx and some of her kittens inherited the bobtail. They are all extremely cute and are ready to find their forever home. Come visit them Weds-Mon 12-5pm. Hades and his siblings were brought to our lobby by a homeless woman. 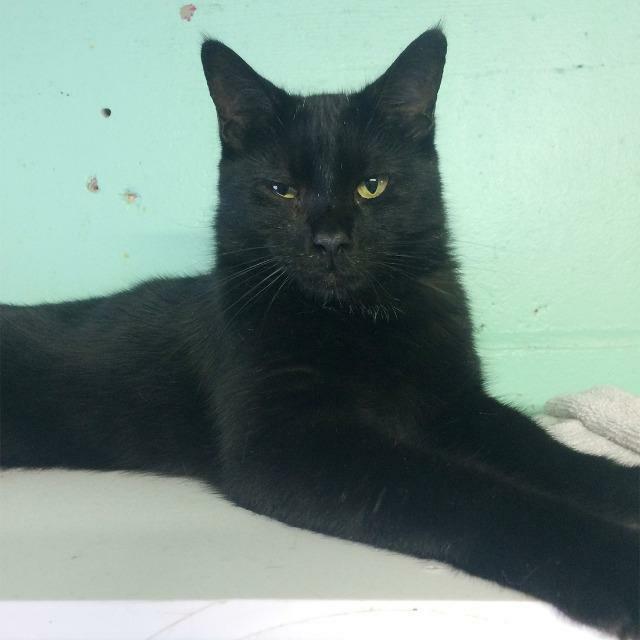 His siblings have all been adopted and Hades is still waiting. 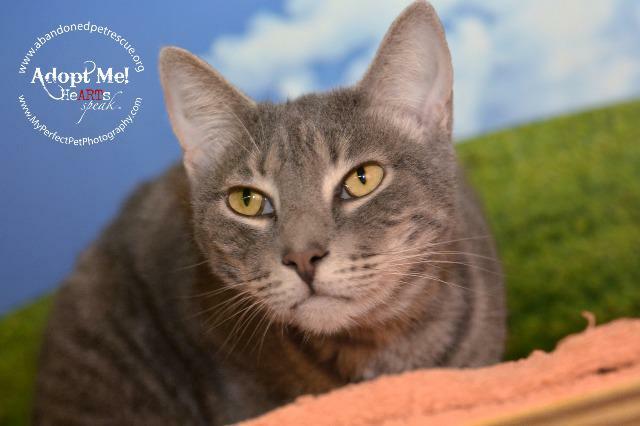 Hes kind of quiet and doesn't usually seek out attention but he is a very sweet boy and loves being petted. Come in and visit Hades Weds-Mon 12-5pm. Harper Kitty was fostered as a young kitten and was supposed to be adopted, but the people never came back for her. 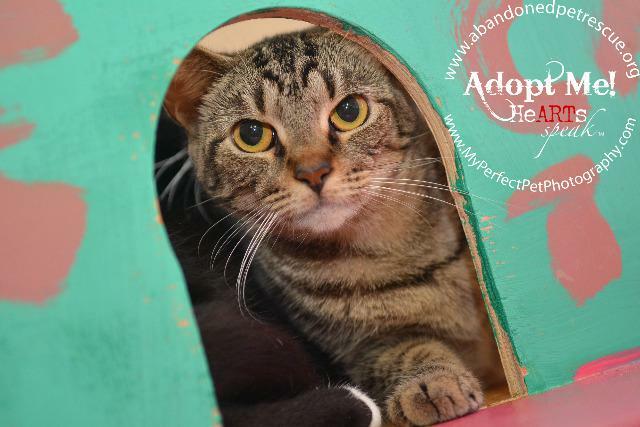 Harper has had to grow up in Oliver's Outstanding Oasis and is wondering if she will ever get a home of her own. She likes to hang out up high so you may need to look up to find her! Come visit her Weds-Mon 12-5pm. Harvey is one of eight kittens found in a feral colony. He is very shy and likes to hang out on the top shelves. 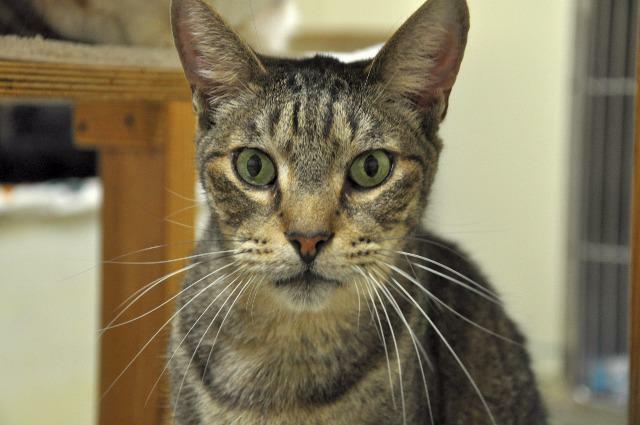 Since hes been here since he was a kitten he would need a lot of time and patience if he ever found the right home. 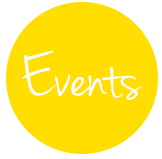 Come by and visit Harvey Weds-Mon 12-5pm. 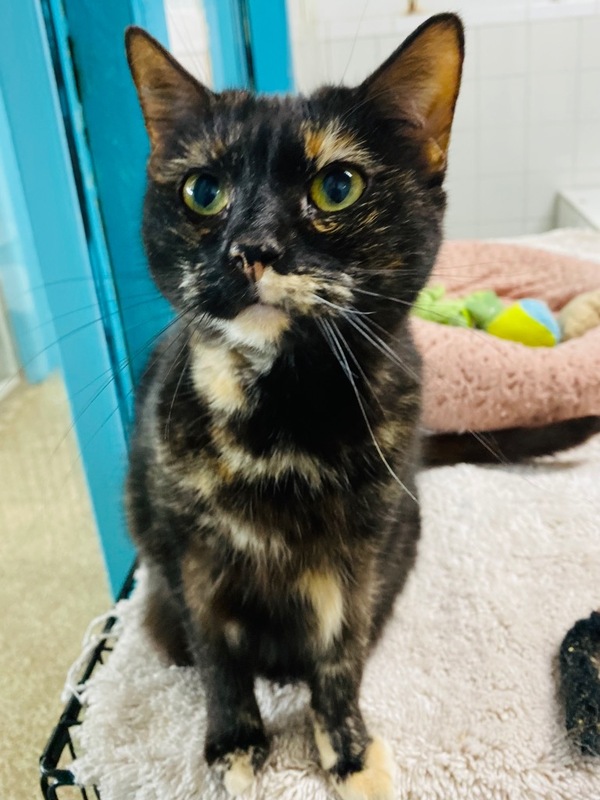 Hella Bella was surrendered to us when her owner lost her home along with her three housemates (Jack, Jill, Kitty Kitty), we are not sure why her name is Hella Bella because she is extremely sweet and affectionate. 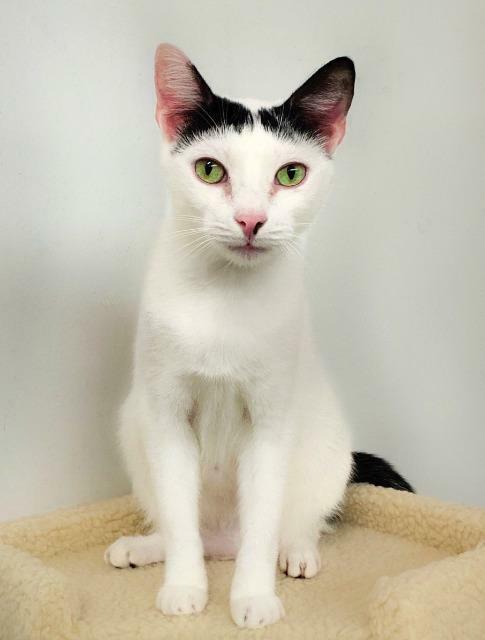 Come meet her and maybe adopt her and one of her housemates. Weds-Mon 12-5pm. Animal Age: 1 year 8 months. 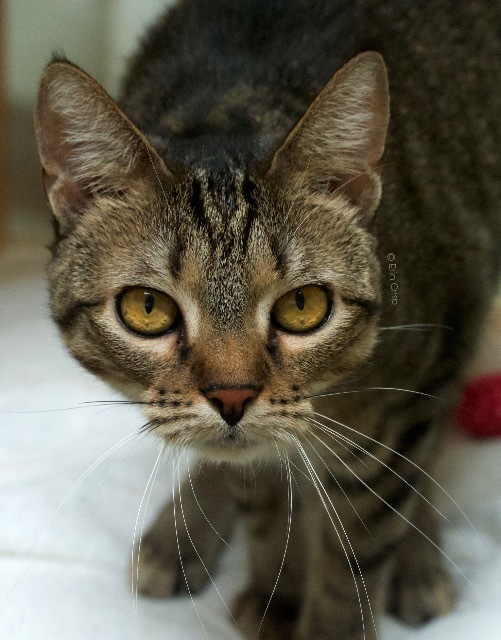 Holly is the last of three siblings waiting to find her forever home. 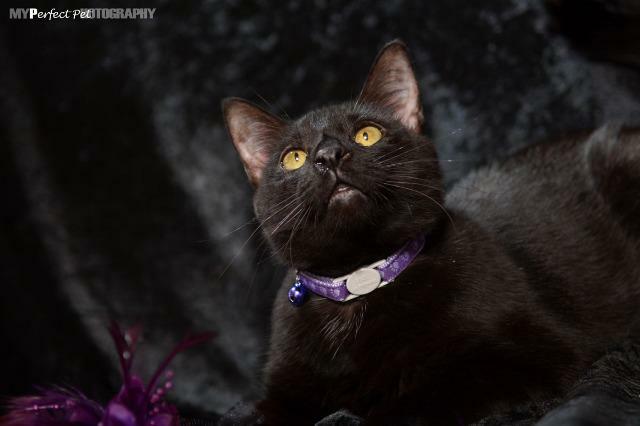 Shes a very quite girl and kind of gets lost amongst all the other black kittens in the room. 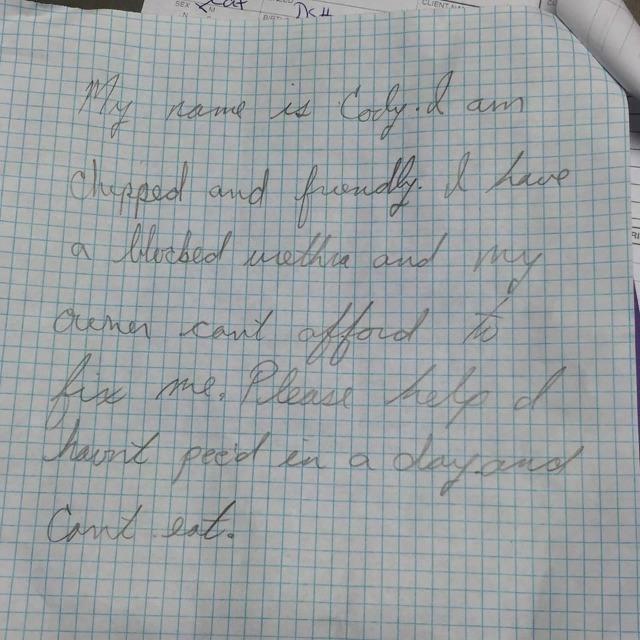 Come visit Holly, maybe she'll pick you. Weds-Mon 12-5pm. Animal Age: 6 years 1 month. Hope and her sister Faith were left at our front door, running lose in the parking lot after staff members told the lady who had her we had no more space. 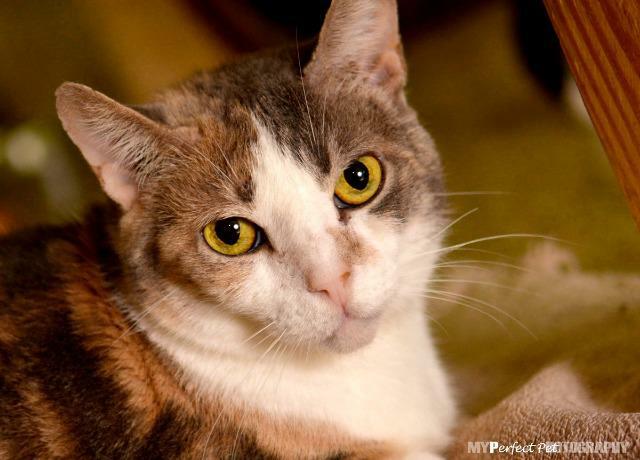 Faith was adopted years ago and Hope is still waiting for her forever home. 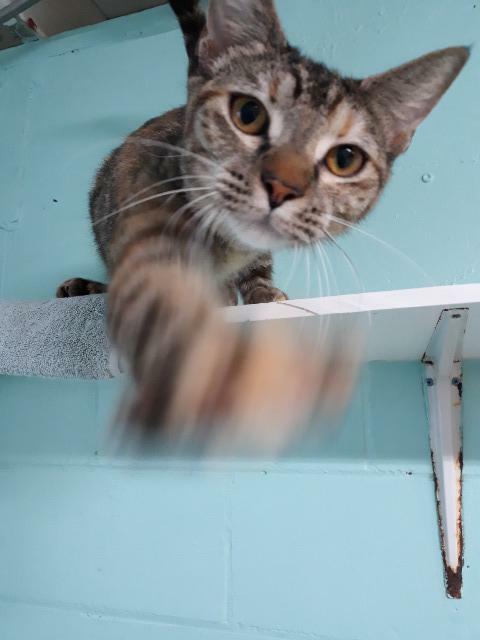 Hope is very sweet and playful. 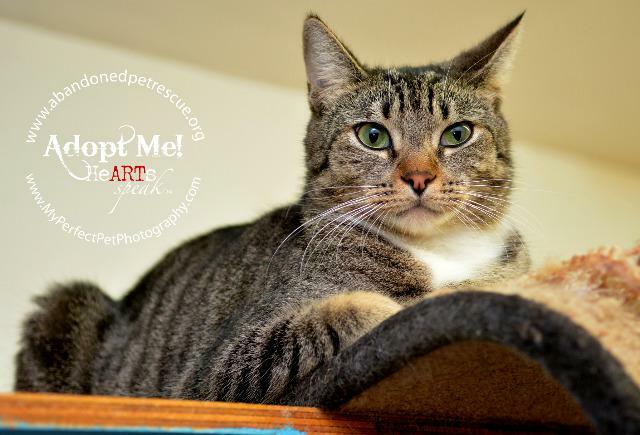 Please come in and visit and take her home! Weds-Mon 12-5pm. Animal Age: 2 years 10 months. 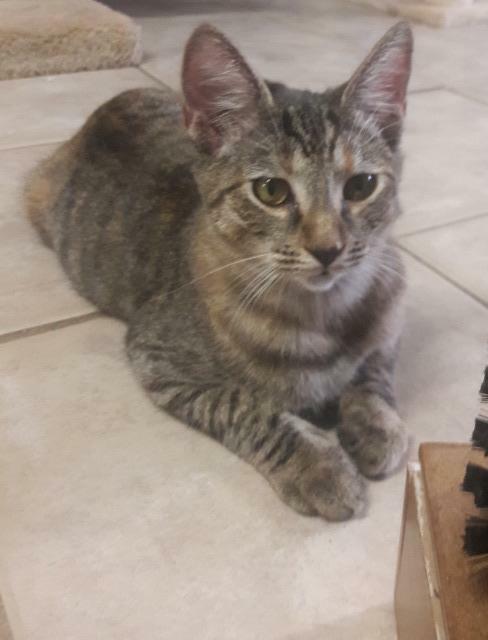 This sweet little lady was dumped at our front door by people who said they no longer wanted to feed her. She was an outdoor kitty but has been very sweet since the day she arrived. She has gained quite a bit of weight since being here but she doesn't seem to care. 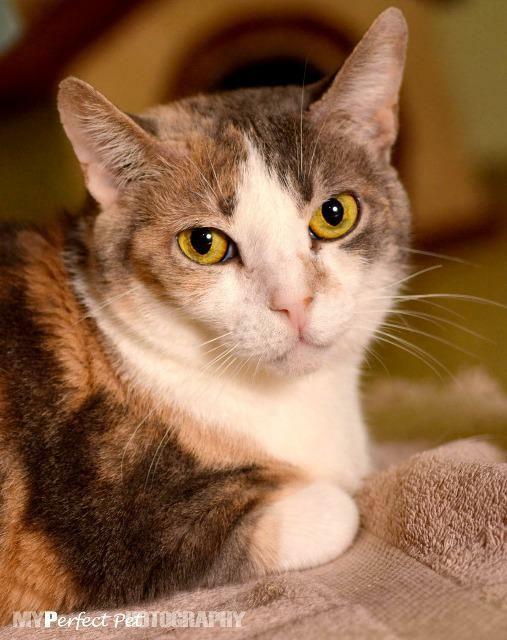 Come in and visit sweet Isabella Weds-Mon 12-5pm. Animal Age: 10 years 10 months. 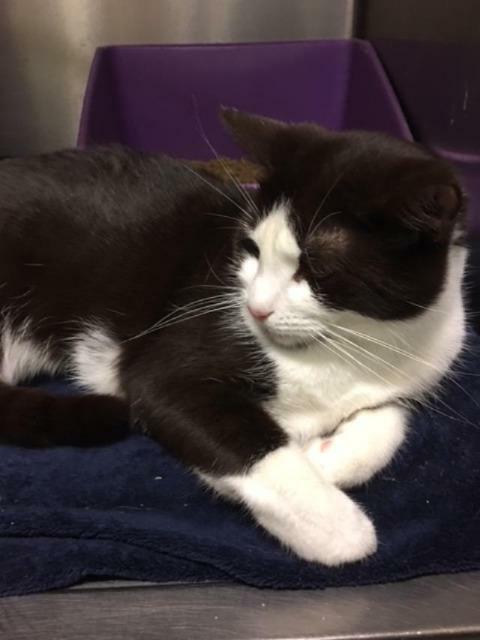 Poor Jack was surrendered to us when his owner lost his home with his other three housemates (others are Kitty-Kitty, Hella Bella, Jill). 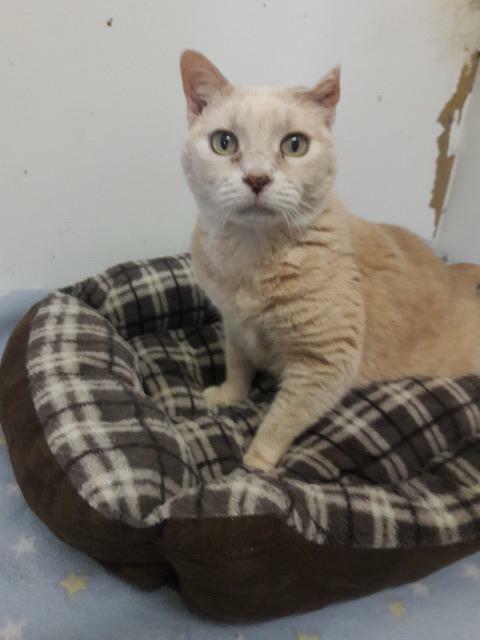 Jack is a senior but still has a lot of love to give, he is very vocal probably confused as to why he is here but he is a very sweet guy. Jack is also declawed. Come visit Jack Weds-Mon 12-5pm. Animal Age: 8 years 11 months. 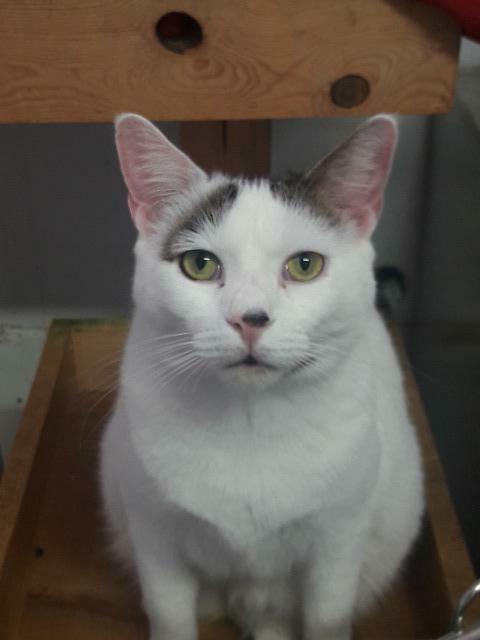 Jazz has been at our shelter most of her life, shes a sweet girl but likes to keep to herself. Since she has been here all her life it may take her some time getting use to a new home. 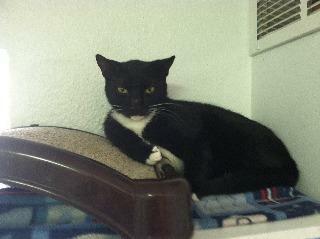 If you would like to visit Jazz come by Weds-Mon 12-5pm. Animal Age: 5 years 0 months. 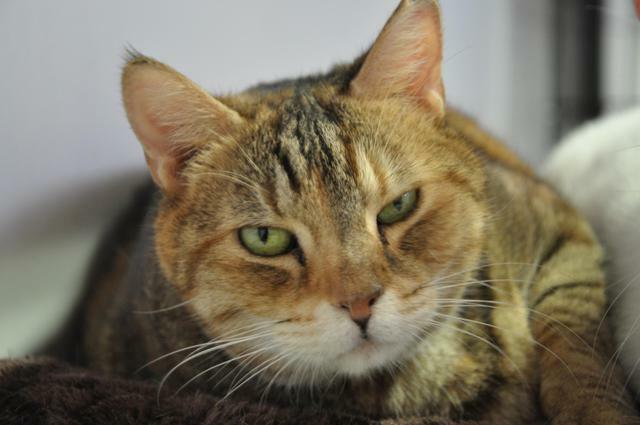 Jelly Belly is the last of a group of siblings that were fostered by one of our volunteers. She is a very sweet girl and is still looking for her forever home. 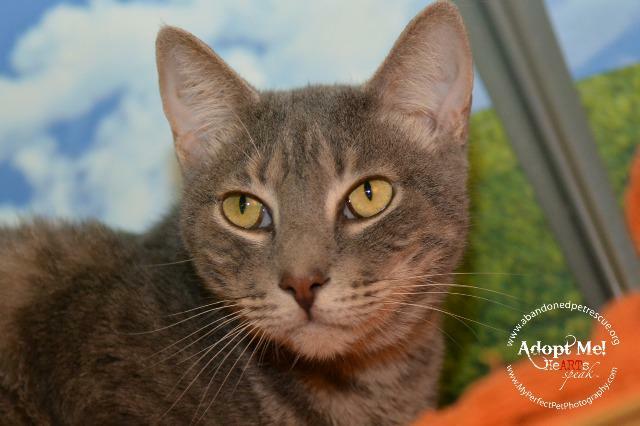 Come by and visit Jelly Belly Weds-Mon 12-5pm. 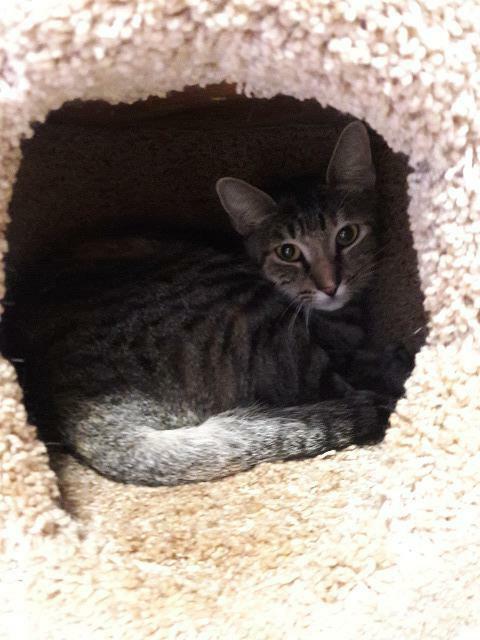 Jill was surrendered to us when her owner lost her home along with her three housemates (Jack, Jill, Kitty Kitty), she is very sweet and affectionate. 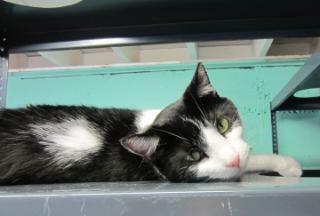 Come in and visit this sweet girl and maybe consider adopting one of her housemates. Weds-Mon 12-5pm. Romeo and Juliet were dumped outside our door in the middle of a hot summer day, thankfully someone noticed them out there and they seemed to be ok. We are guessing they came from the same home, they are nervous but are very sweet. Come visit them Weds-Mon 12-5pm. Kahlua was brought in with her sister Bailey when they were only two weeks. Bailey has found her forever home and Kahlua is still looking. Shes a very sweet girl and just craves attention. Come by and meet her Weds-Mon 12-5pm. Animal Age: 11 years 10 months. 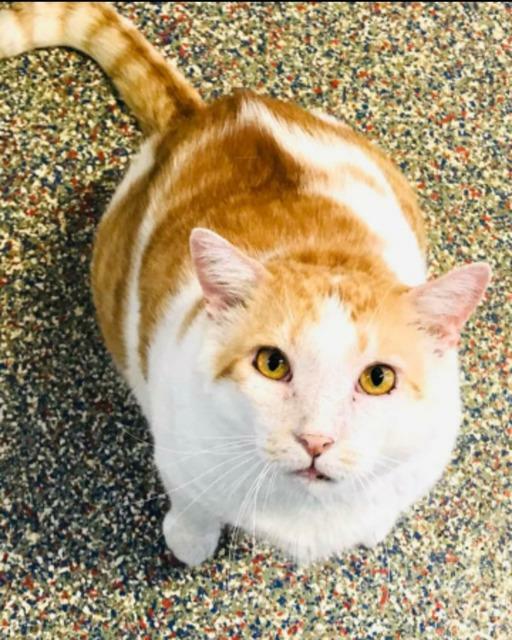 Keller was adopted as a kitten but returned shortly after when the family did not want to spend the time to acclimate him to their household. Hes a lot older now and has some medical issues, mainly with his mouth. He loves hanging out with his group of kitty friends, Stan and Lil Pastel. 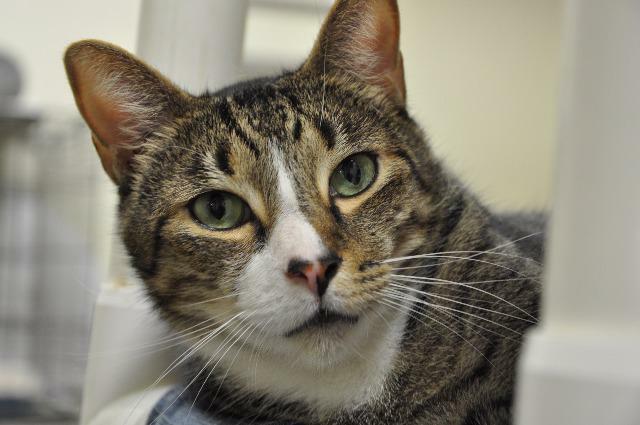 Come by and visit him and his friends Weds-Mon 12-5pm. 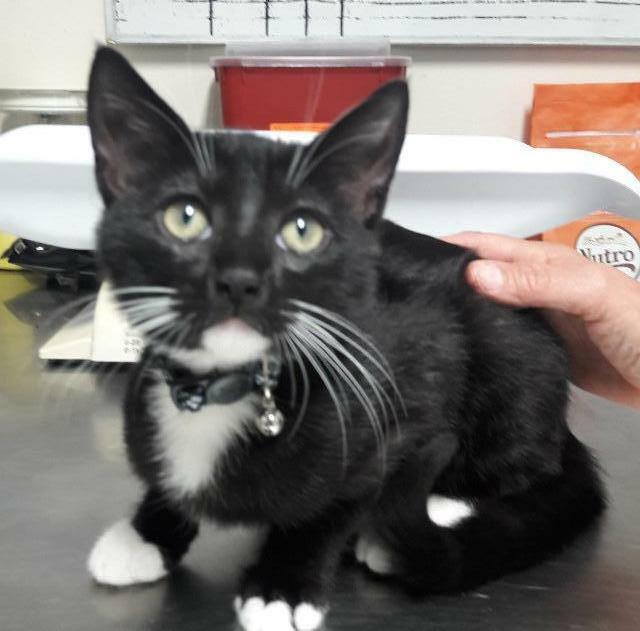 Klondike was found as a stray in a local WalMart parking lot with a black and white bow tie collar and freshly clipped nails. He is extremely affectionate and cries for someone to hold him. 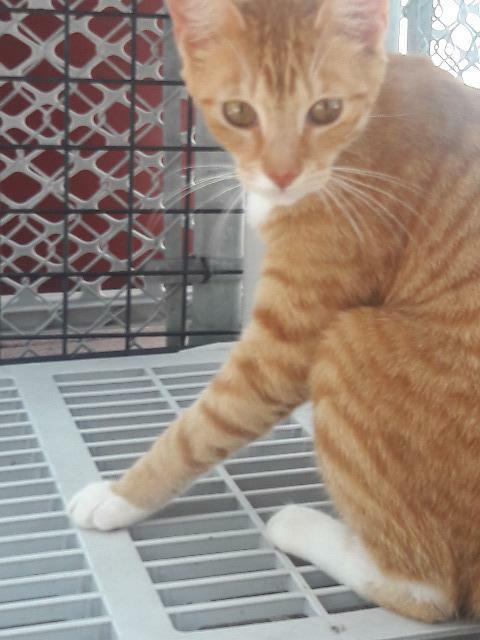 He use to play very rough with people but since hes been roaming free in one of our rooms he has calmed down a lot. Come in and visit Klondike Weds-Mon 12-5pm. Animal Age: 6 years 7 months. 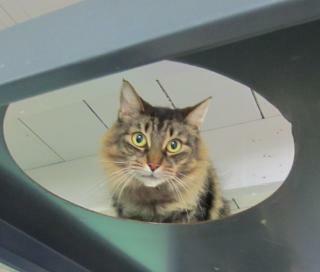 Lexington was dropped off at the door a few years ago and was pure feral, we didn't know what to do with him so we put him in Mitten's Marvellous Manor because its a small quiet room and we felt he'd be more comfortable in there. He is still a little shy and semi feral, but hes much better than he was when he first got here. He might not do well being adopted because this is the only home hes always known and he is very comfortable here. 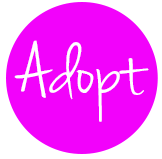 But with the right person and home we are willing to give him a chance at a nice loving home instead of shelter life. Come visit him Weds-Mon 12-5pm. Lil Bit came in with her five babies who have all since been adopted. She was not sure about people at first, but she has gotten a lot better and loves being petted but still keeps to herself. 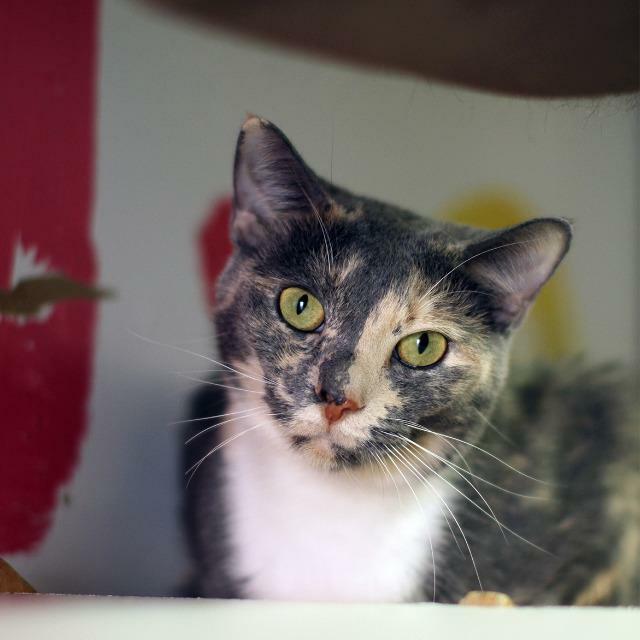 Come visit this sweet girl Weds-Mon 12-5pm. 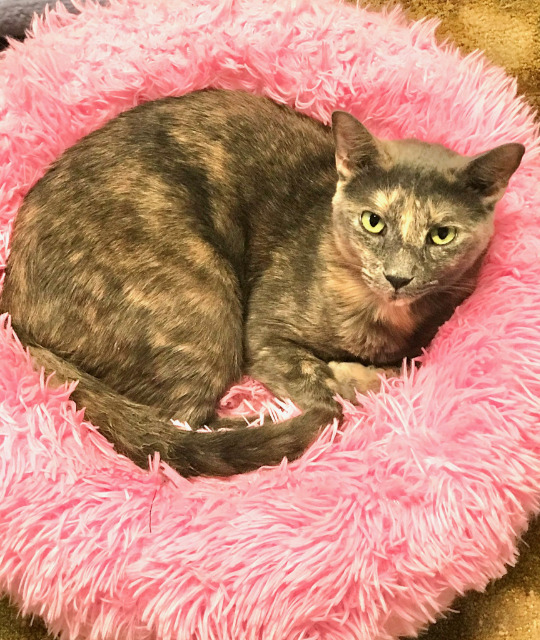 Lil Pastel has been at the shelter her entire life. 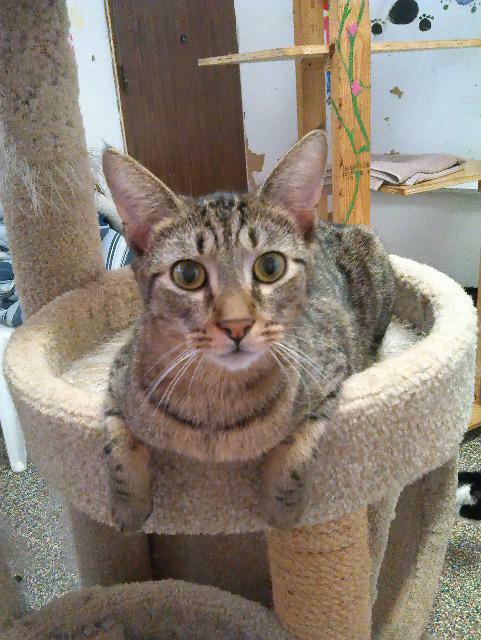 She is still a bit shy and fearful but likes her room and gets along with the other cats. Shes a bit uptight with strangers and some staff members. She enjoys getting brushed and getting treats from volunteers, but seems to be comfortable in her current surroundings. 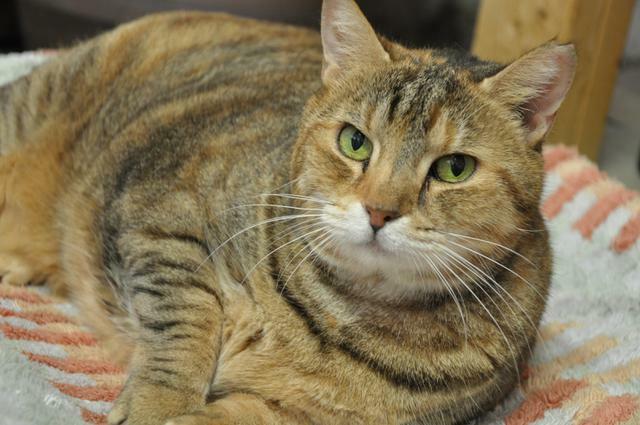 Lindalita is a sweet cat who had a litter of kittens when she first came to us years ago. 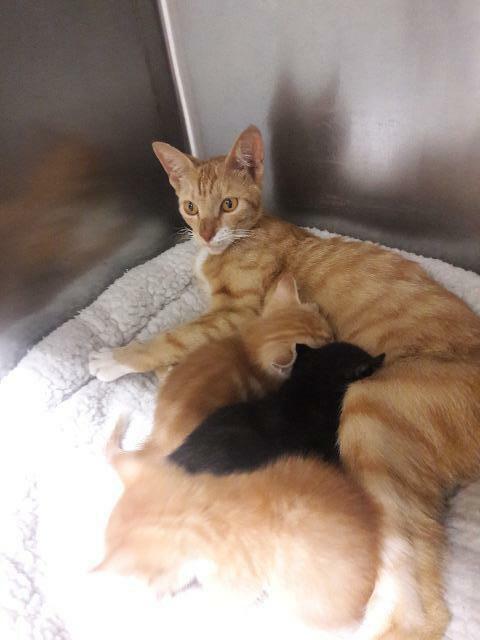 The kittens were adopted but mom still needs a home. 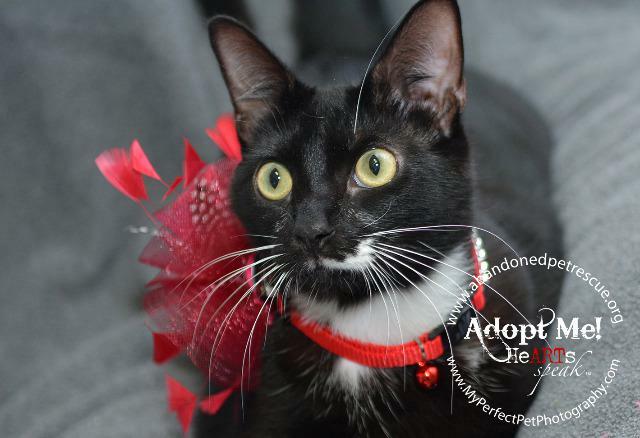 She is very easygoing, sweet, and adaptable and would be a great addition to any family who already owns other pets. 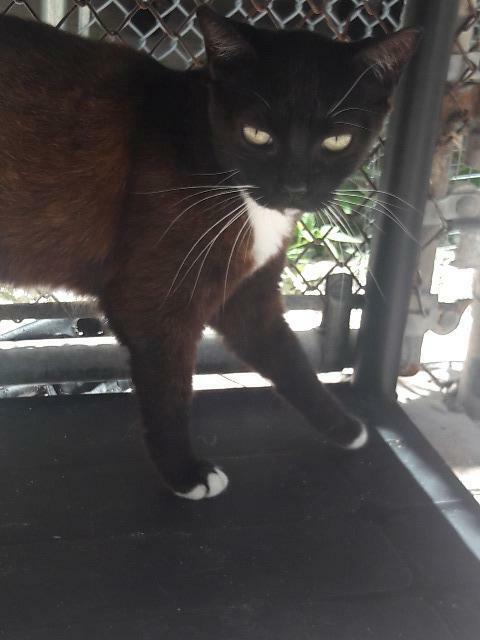 Lindalita loves to be outside on our catio. Come meet her Weds-Mon 12-5pm. Animal Age: 4 years 10 months. Lola has been here since she was just a kitten with her mother Mittens and four other siblings. She is still here waiting with sister Tweety, brother Pepe Le Pew, and mother Mittens. 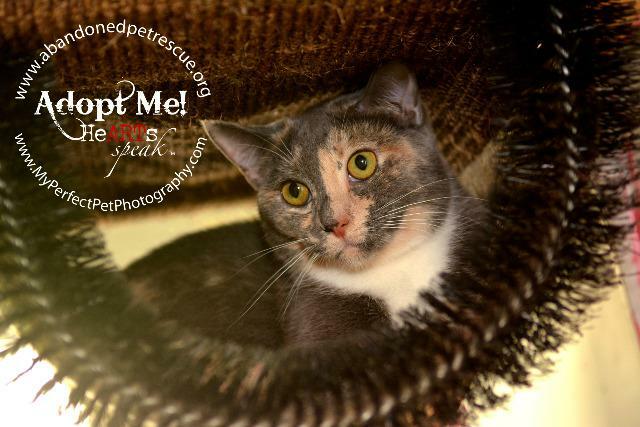 I'm a sweet quite girl and would love to find and forever home! Come meet me and my family Weds-Mon 12-5pm. Animal Age: 4 years 1 month. 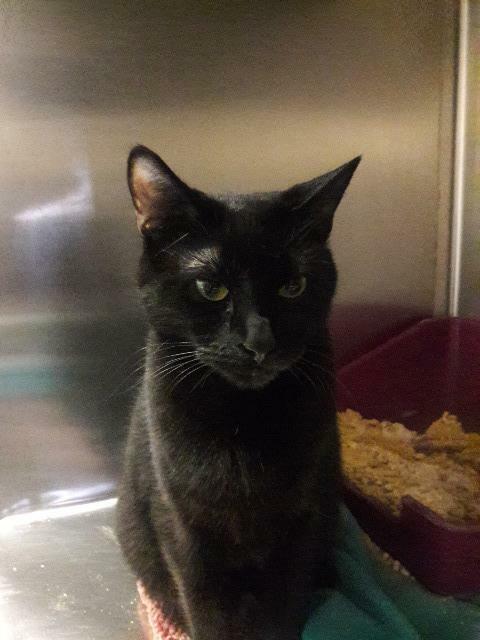 Returned after being gone a few years, owners moved and left her and her roommate Selene behind. 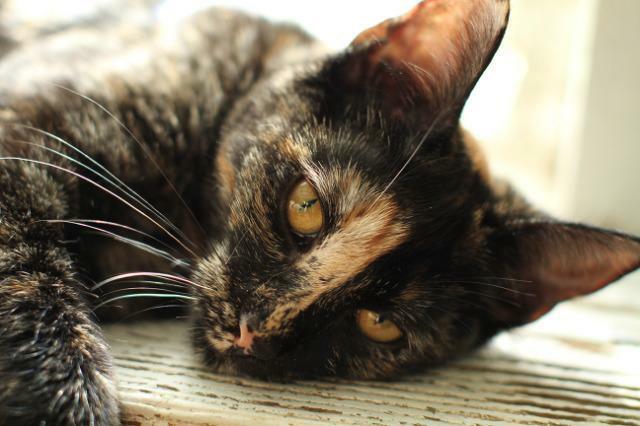 She is sweet and affectionate, and wants a new home! Come visit her Weds-Mon 12-5pm. 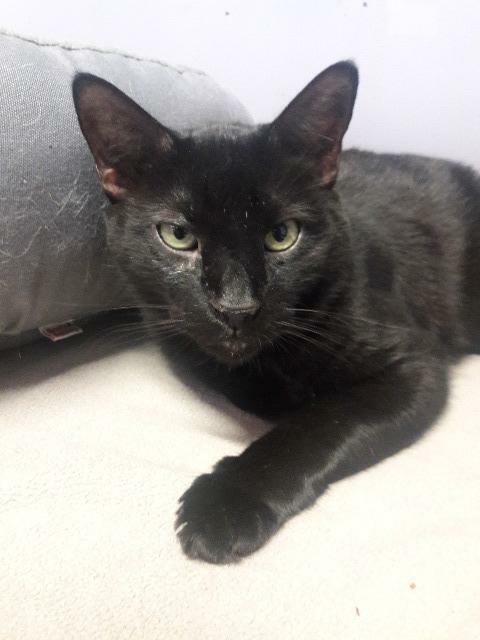 Mad Max was fostered as a young kitten and is still looking for his forever home, we are not quite sure why his foster mom named him Mad Max, maybe as a kitten he was a little wild, hes not like that now. Hes very calm and kind of shy, but he does love all the attention he gets. Come in and visit me! Weds-Mon 12-5pm. Animal Age: 2 years 2 months. 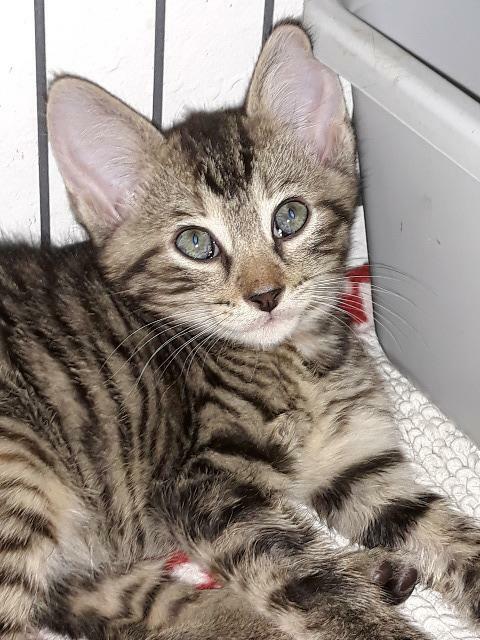 Maffie was found dumped in a crate hidden in a bush. 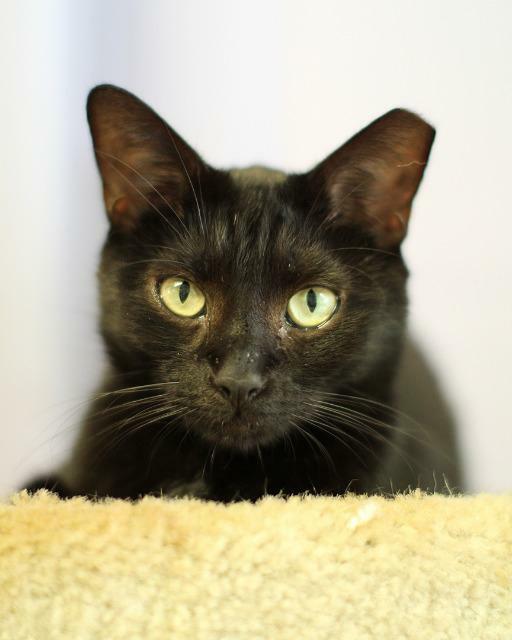 She is a sweet, affectionate, outgoing cat who really wants a home where she will be loved! Animal Age: 8 years 1 month. Found as a stray covered in mange, Manny is now recovered and looking for his forever home. 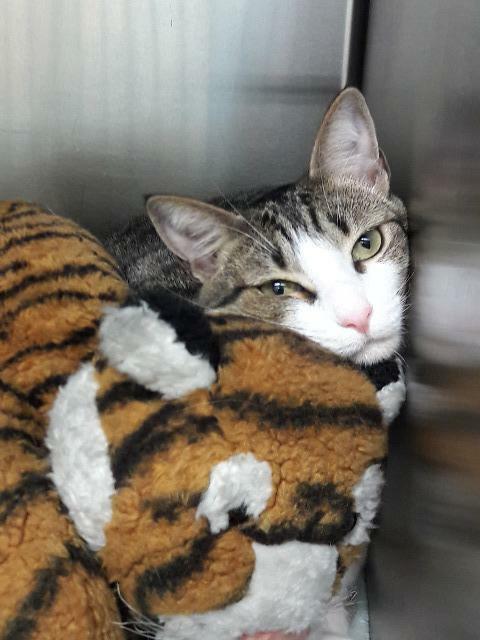 Manny is FIV positive, which is not transmittable to humans and other cats can only get it if they bite another cat. 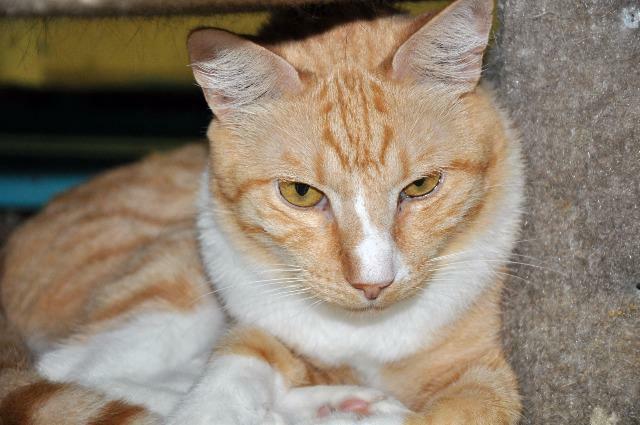 Manny is such a mellow, sweet cat and we haven't seen any biting behavior from him. Come by and visit Manny, Dove, and Sneaky Pie Weds-Mon 12-5pm. 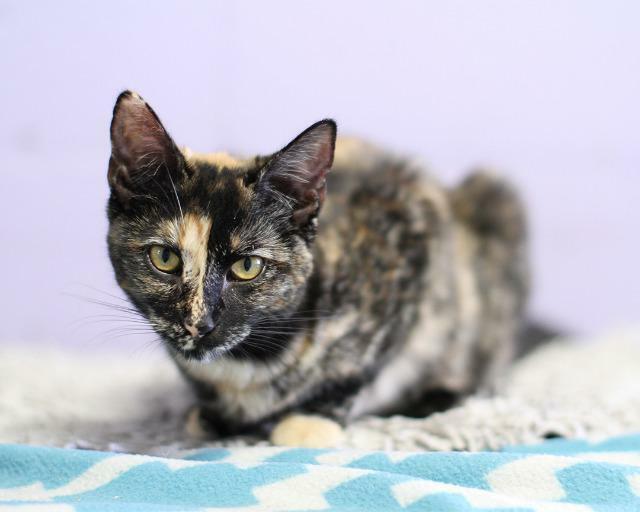 Marigold was found as a stray with a wound on her side which has fully healed. She is extremely sweet and also has a little fiesty side to her. Come visit her Weds-Mon 12-5pm. 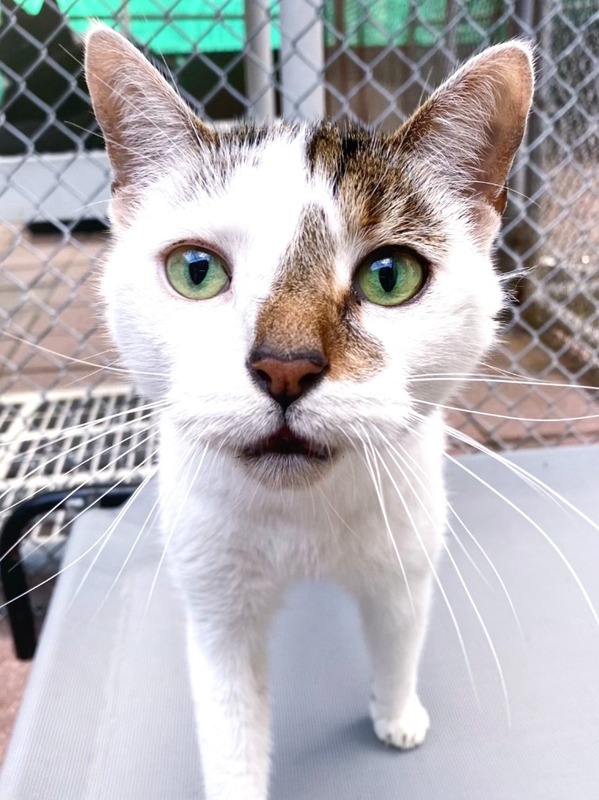 Mittens was living at an assisted living facility in Hollywood when the residents got very concerned for her, they thought she was sick. 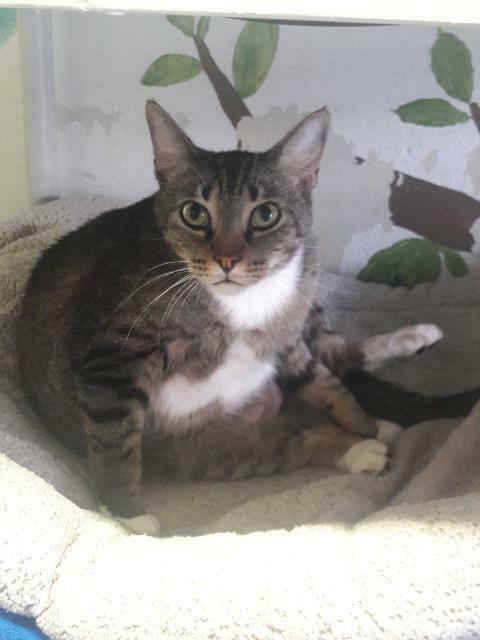 It turned out she was pregnant, most of her kittens have found homes but she is still here waiting with her son Pepe Le Pew and two daughters Lola and Tweety. 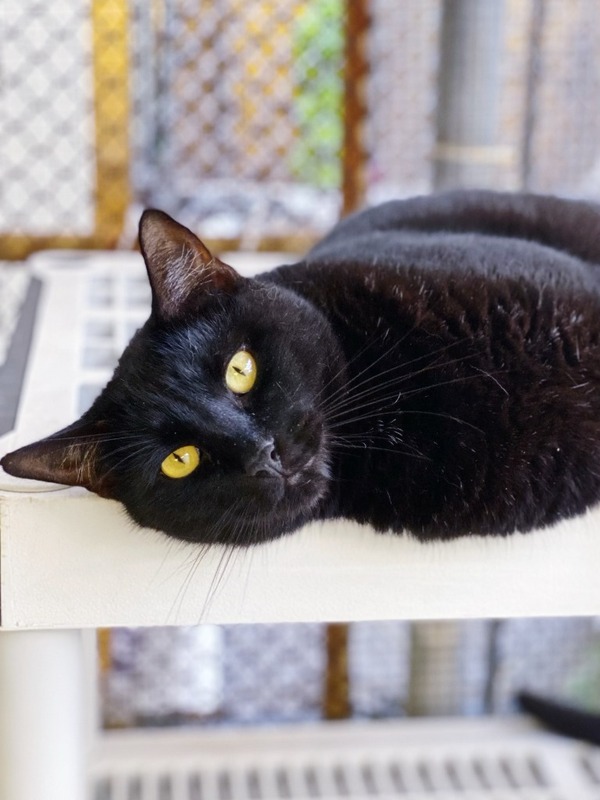 Mittens loves hanging out in our catio, come by and visit her there Weds-Mon 12-5pm. 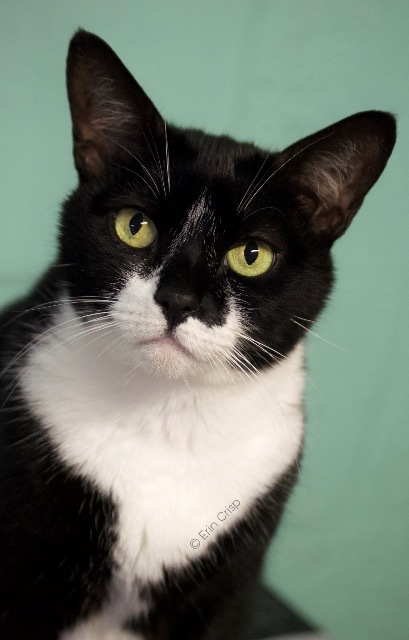 Moo Moo was abandoned in a dumpster and found by one of our volunteers a few years ago. 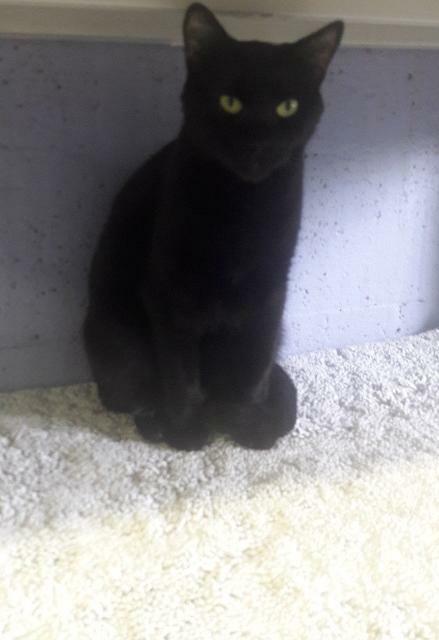 She use to be very shy and not as social as the rest of the cats but thanks to one of our employee's love and attention she has made progress with coming out of her shell. Shes still shy with people she doesn't know, but with people shes familiar with she will let them pet her instead of running and that is a big step for her! 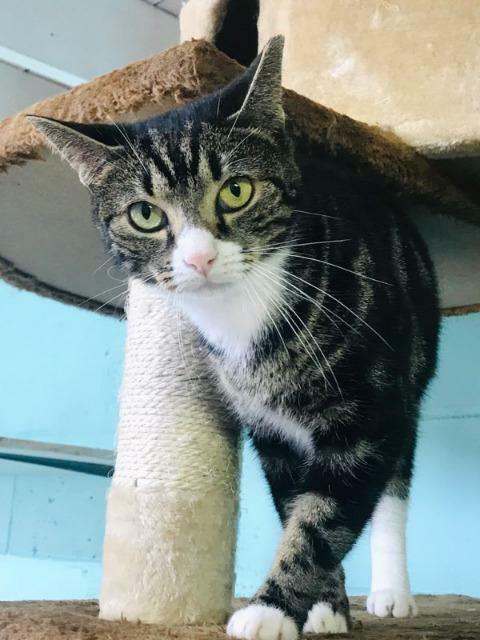 Come in and visit MooMoo Weds-Mon 12-5pm, if interested you may have to come in multiple times to earn her trust, but trust me she promises it will be worth it! Mouse has been here since he was a kitten, that was a few years ago. Hes still very shy and won't let anyone pick him up, but one of his favorite things to do is to rub up against your legs, and he'll let you pet him while doing it. He also loves to be sweet talked to. 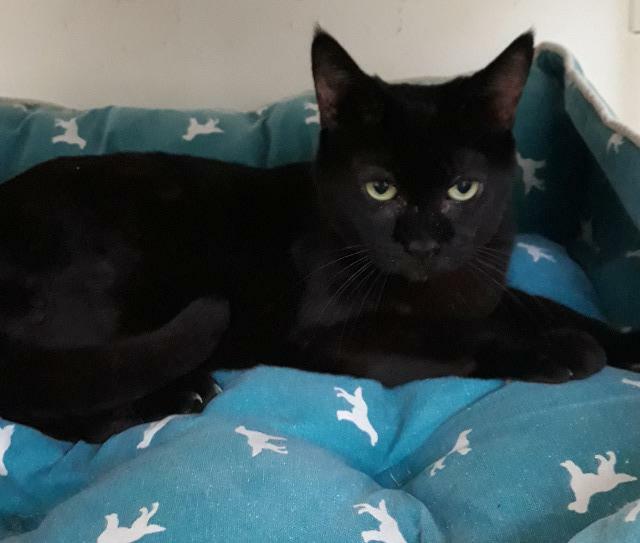 With a lot of love, patience, and someone who will spoil him rotten we feel Mouse would be the perfect cat for someone, it just may take him some time to trust you and to get use to new surroundings. Is anyone willing to give this sweet guy a chance at a loving home? 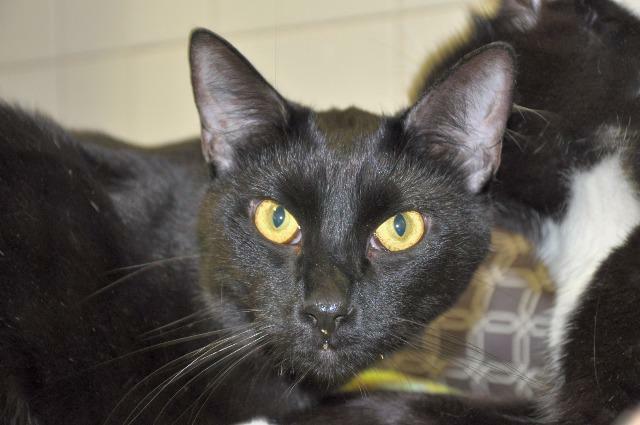 Come by and visit this silly boy Weds-Mon 12-5pm. Animal Age: 2 years 5 months. 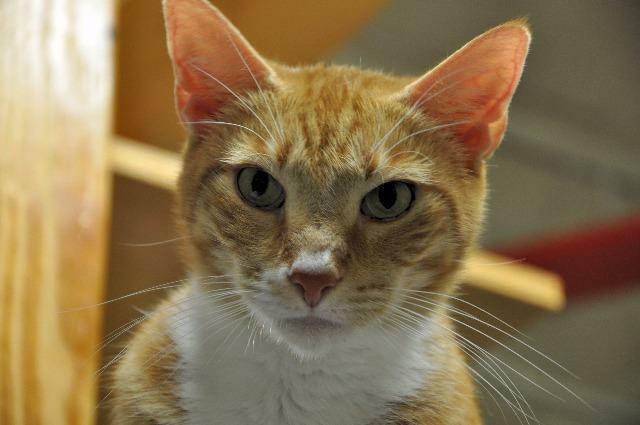 Mr. Tibbs was found as a stray by one of our previous adopters. 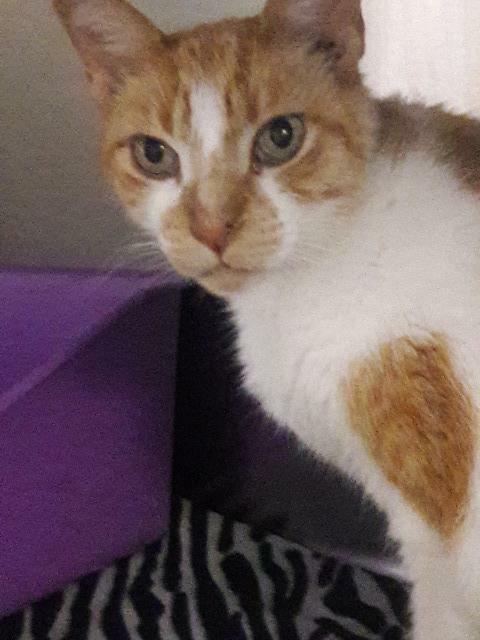 He is an extremely sweet guy, at first we thought he was a kitten because hes so small but his teeth show he has some age to him, maybe only a few years old. 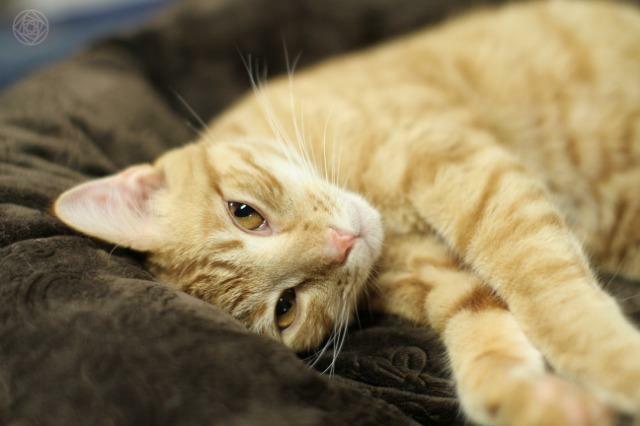 Come visit this sweet little guy Weds-Mon 12-5pm. Animal Age: 1 year 0 months. 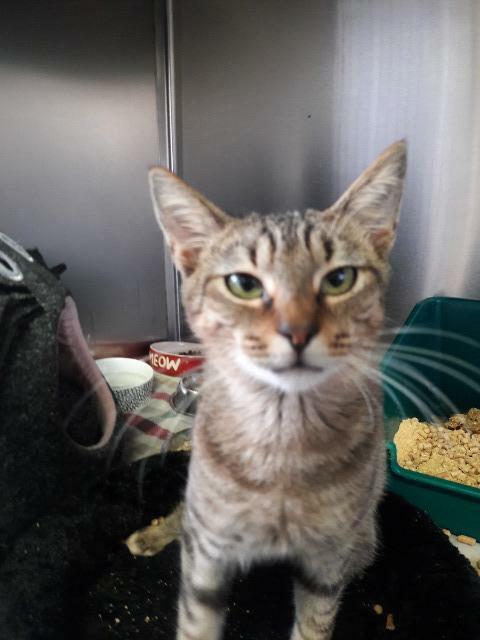 Little Nakia was found by herself crossing a busy street, she had an injury to her bottom jaw that is now healed. 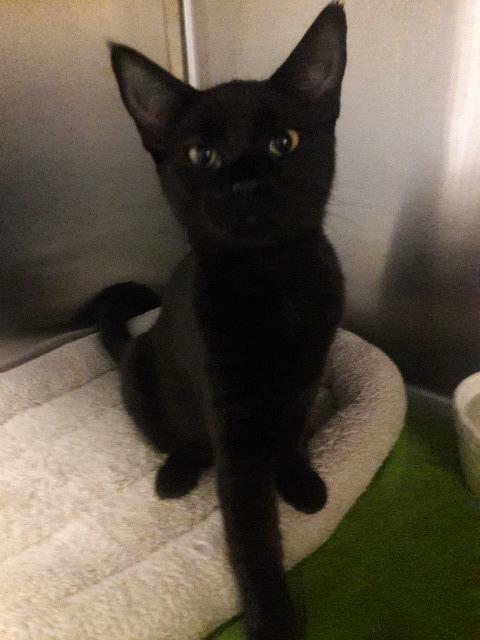 She is a very sweet little girl and very playful. Come visit Nakia Weds-Mon 12-5pm. Animal Age: 3 years 1 month. 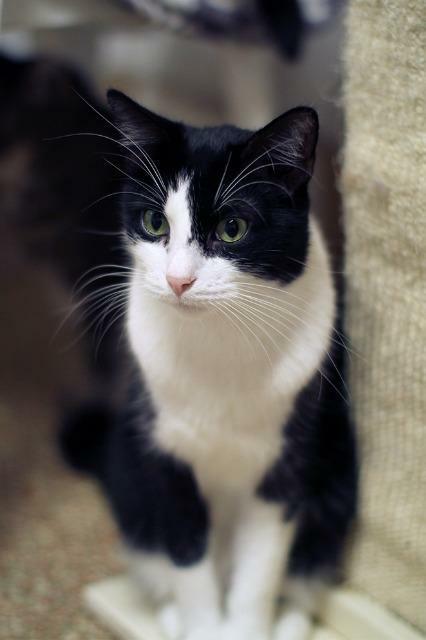 Nibbles was fostered with three other siblings, two have been adopted but shes still waiting with her sister Phoebe. 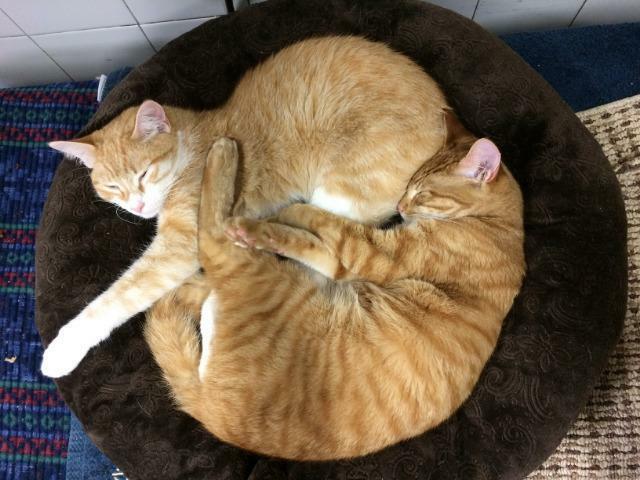 Both are very sweet cats, love attention and just want a home to be loved forever! Come by and visit them Weds-Mon 12-5pm. Animal Age: 7 years 5 months. 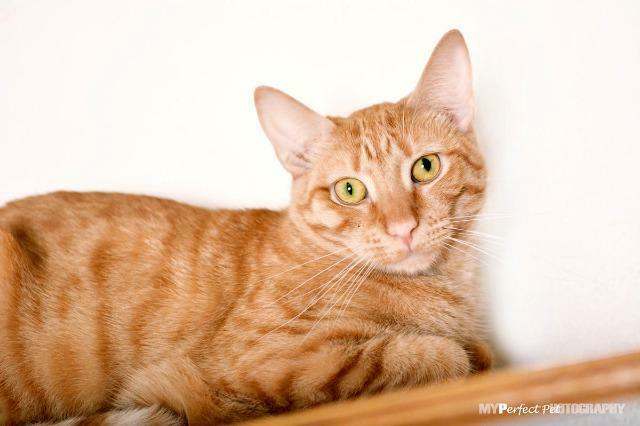 Nicky was brought to APR when he was just a few weeks old back in December 2011. He was fostered with another orphan, Sandy and she was adopted years ago. 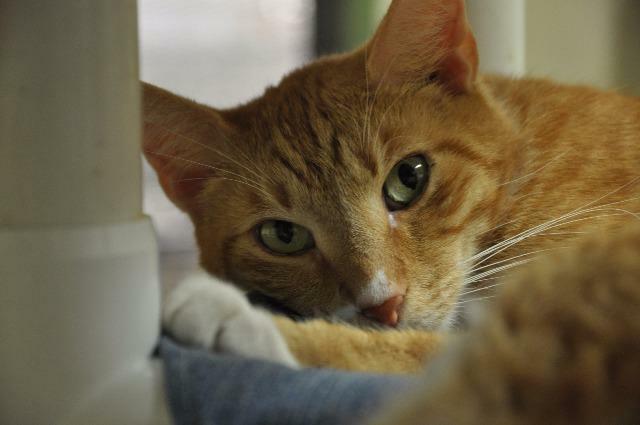 Nicky is a sweet boy but he tends to get jealous when other cats get attention. 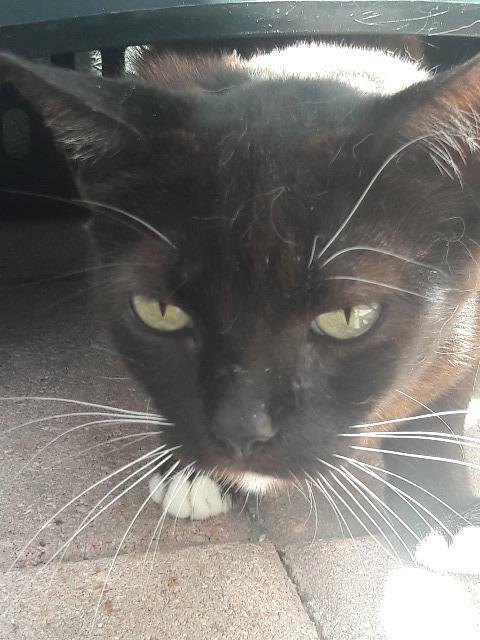 Hes a very loyal cat, if he loves you he'll watch you and wait for your eyes to land on him to give him some love and attention. He would probably prefer being in a home by himself or maybe with not so many cats. 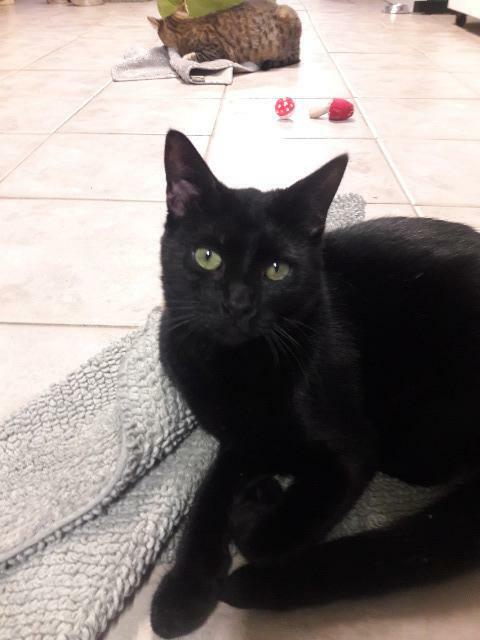 Come in and visit this sweet little lovebug! Weds-Mon 12-5pm. Animal Age: 3 years 10 months. 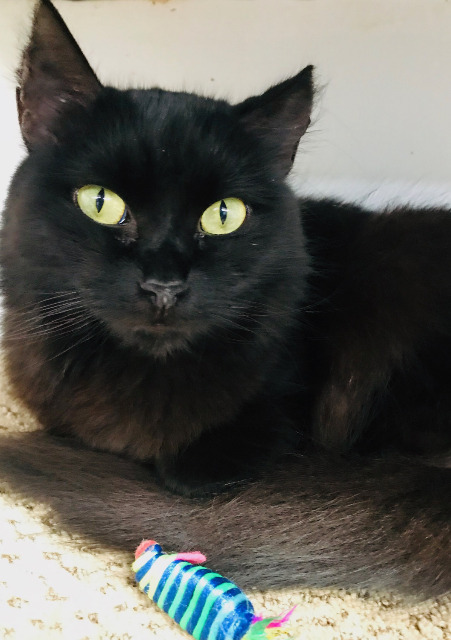 Night and her sister Star were both fostered as young kittens and are now looking for their forever homes, both are a little shy but very sweet. It may take a lot of visits before both are ready to go home, they usually hang out really high because that is where they feel the safest. Come visit them Weds-Mon 12-5pm. Animal Age: 5 years 4 months. Oliver was a foster kitten from a local vet that was adopted by her and returned two times. Basically because no one really had time to spend with him and help him adjust to a new environment. 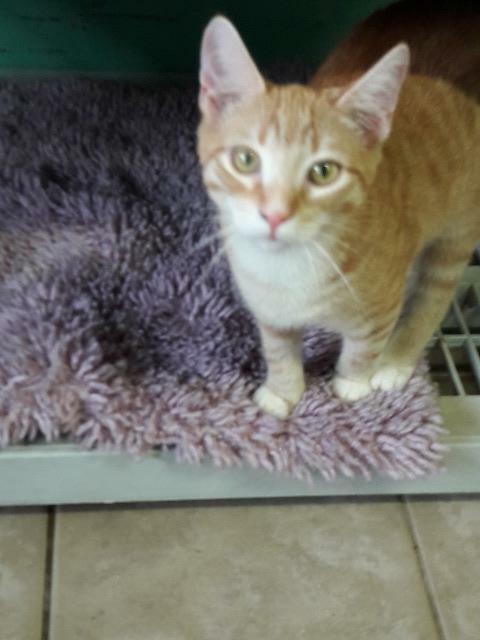 Hes can be a little shy, but hes a very sweet cat and we are hoping to see him find a forever home soon! Come visit him Weds-Mon 12-5pm. Animal Age: 9 years 0 months. 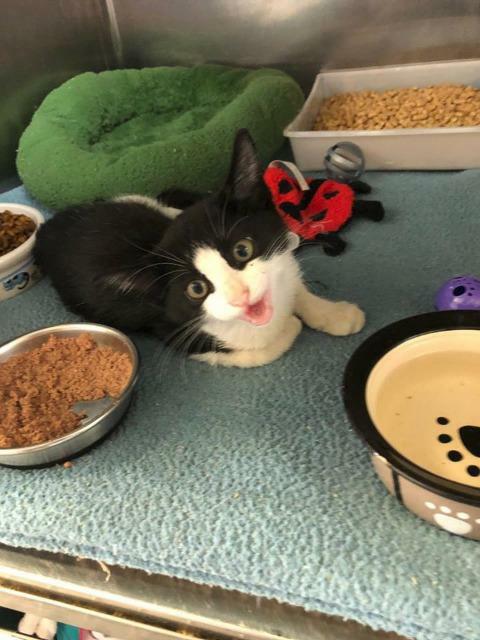 Orca is one of three kittens found abandoned in Port Everglades. All were extremely skinny, scared and in poor health. Now they are all fat, healthy and ready for a new start with a family and home of their own. 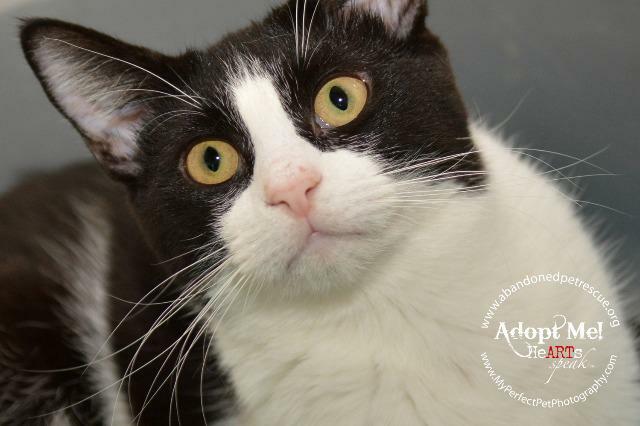 Hager and Sherlock have already found their forever homes and Orca is still waiting. She was adopted not long ago but returned when her owner passed away, this poor girl was so happy in her home and was just the best cat. 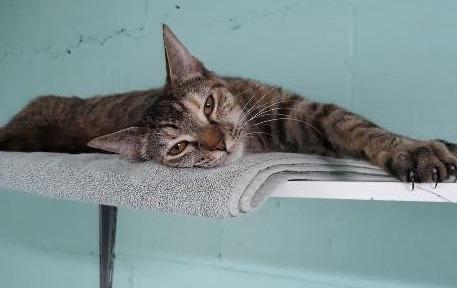 Come by and visit her and give her another chance at a forever home! Weds-Mon 12-5pm. Animal Age: 10 years 2 months. 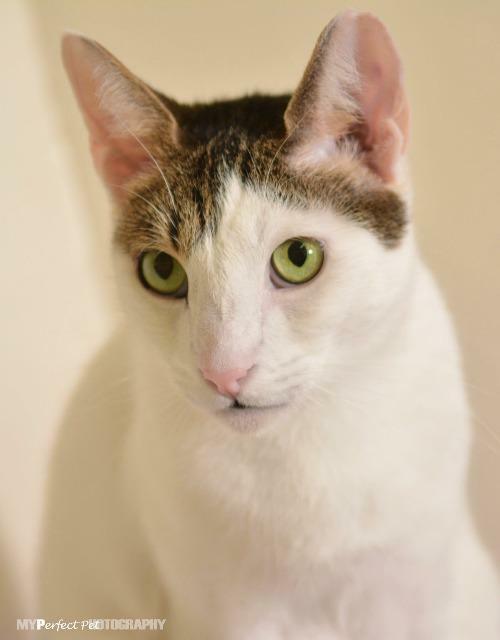 Otto is a terrific boy who was a stray and rescued with his brother Scampers. Hes become a little stressed being in a room with 30 other cats and would just like a nice place to call his own. Come by and visit him Weds-Mon 12-5pm. 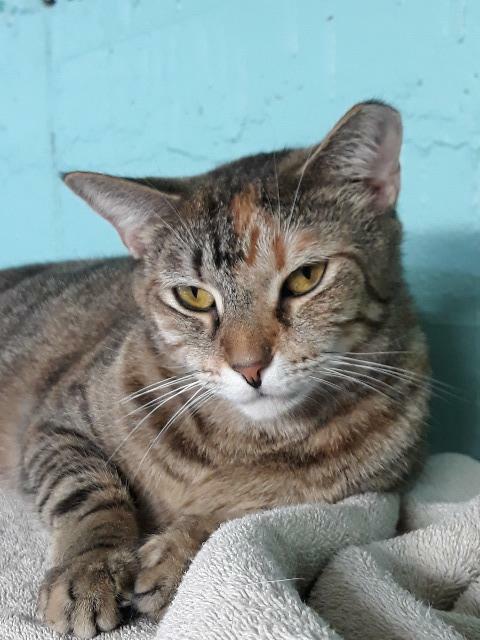 Patience was rescued from Broward County Animal Care with her six kittens. 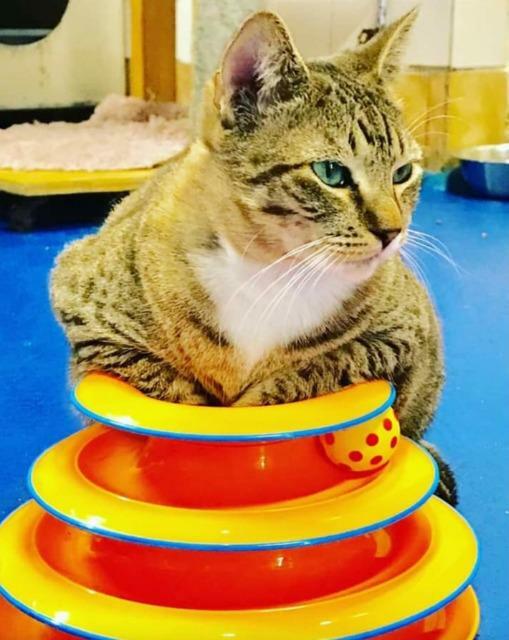 All her kittens were adopted, but Patience is still waiting at the shelter for her forever home. 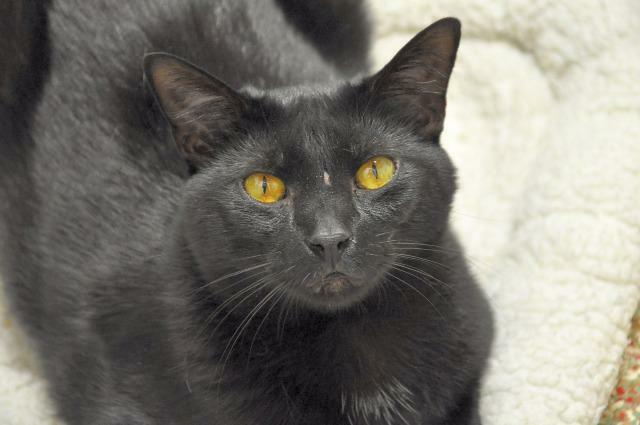 She is an easygoing, social cat with a bright gold coat. Come meet her today! Weds-Mon 12-5pm. 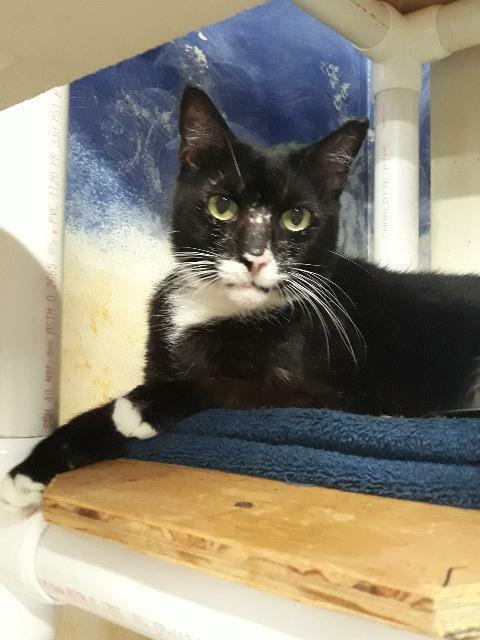 Pepe Le Pue has been with us since he was a kitten, his mom Mittens and two sisters Lola and Tweety are still here with him looking for their forever home. 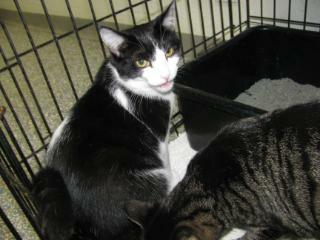 He is a little stressed being in a room with 30 other cats and would probably do best in a home with no other cats. 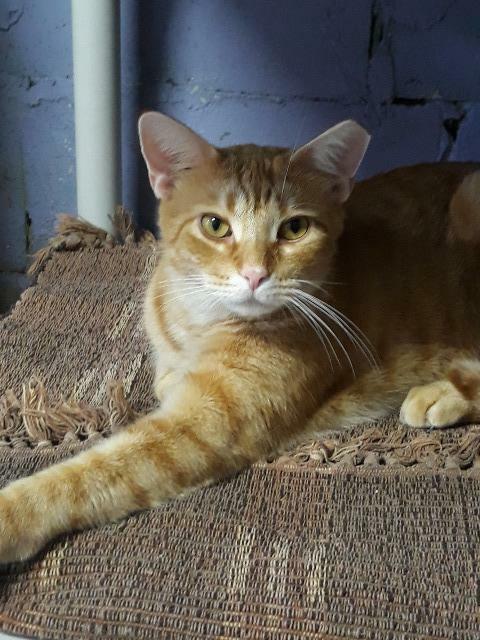 Hes a very sweet guy and would love to find the perfect home! Come visit him Weds-Mon 12-5pm. 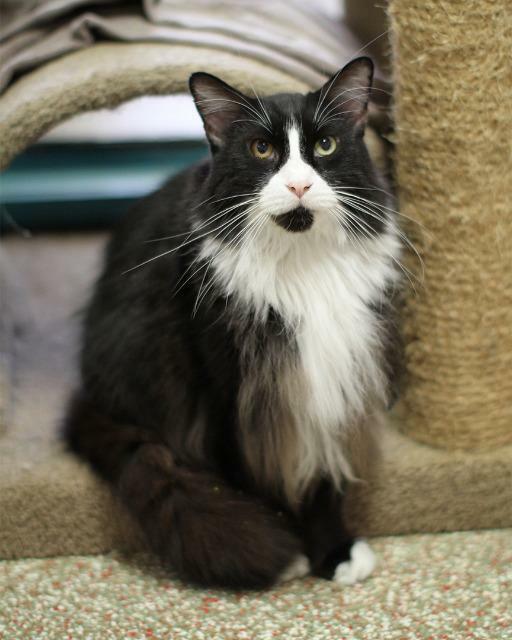 Pepper Jack has been here since he was a young baby, hes very beautiful and a very sweet boy. Come visit him Weds-Mon 12-5pm. 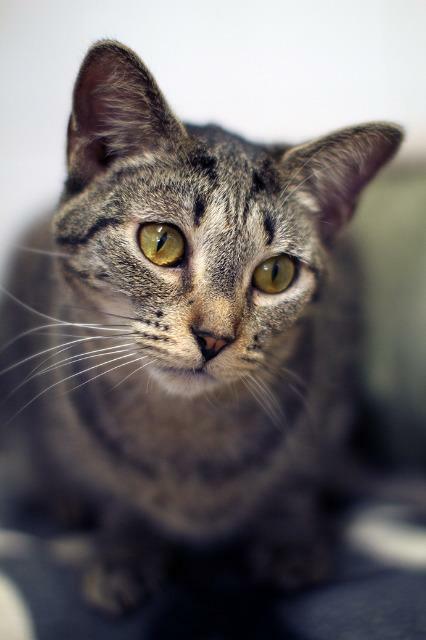 Phoebe was fostered with three other siblings, two have been adopted but shes still waiting with her sister Nibbles. 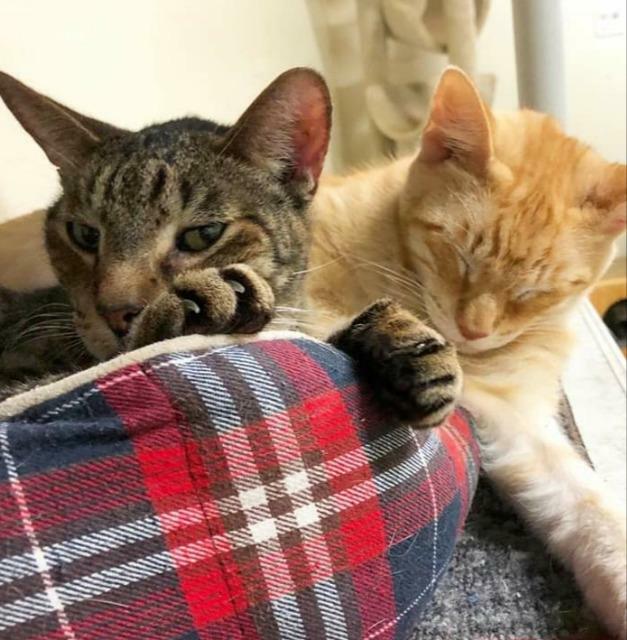 Both are very sweet cats, love attention and just want a home to be loved forever! Come visit them Weds-Mon 12-5pm. Animal Age: 3 years 5 months. 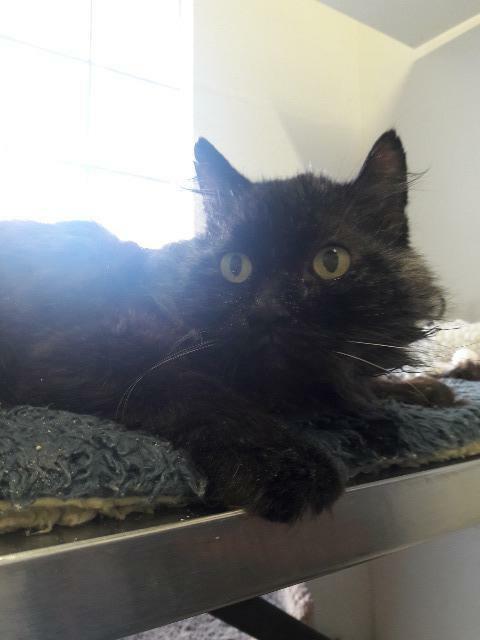 Prince came to us completely covered from head to toe with mange, he is now clear and is in one of our cat rooms. 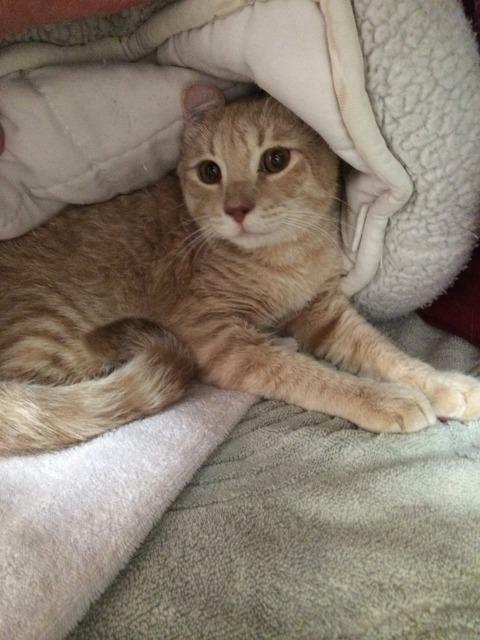 Hes kind of shy, when he came to us he was feral. When you call his name he'll look at you and squint his eyes, he knows you're talking to him and he gets very shy about it. Come visit Prince, maybe he'll like you! Weds-Mon 12-5pm. Animal Age: 14 years 2 months. 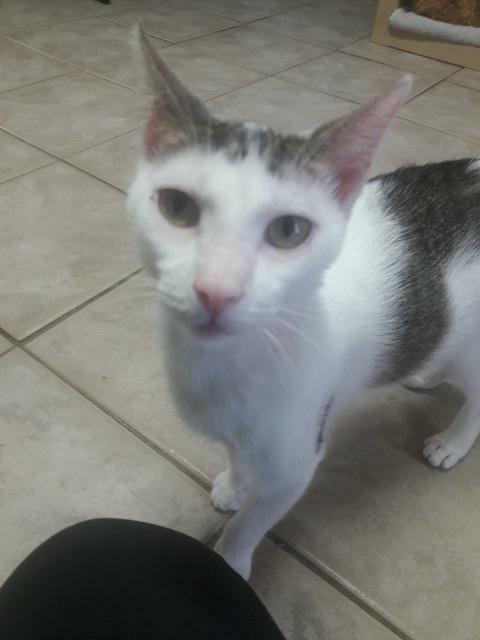 Reeses was left at one of our volunteer's vets office with a really bad flea allergy. She has since recovered and is doing well in one of our cat rooms. For a senior she is still very healthy, she would just like a nice place to lounge and relax for the rest of her senior years. 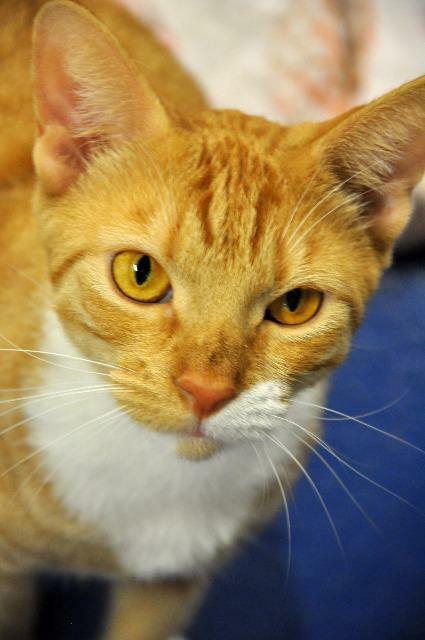 Come in and meet Reeses Weds-Mon 12-5pm. 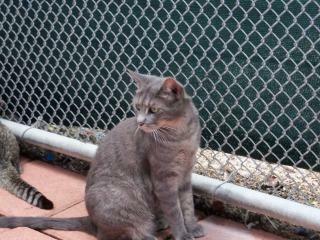 Renee and Paige were dumped on one of our volunteer's front porch, both seem to be very bonded and are also very sweet. They love jumping on people's backs and they both love to cuddle. Come visit them Weds-Mon 12-5pm. Animal Age: 6 years 8 months. 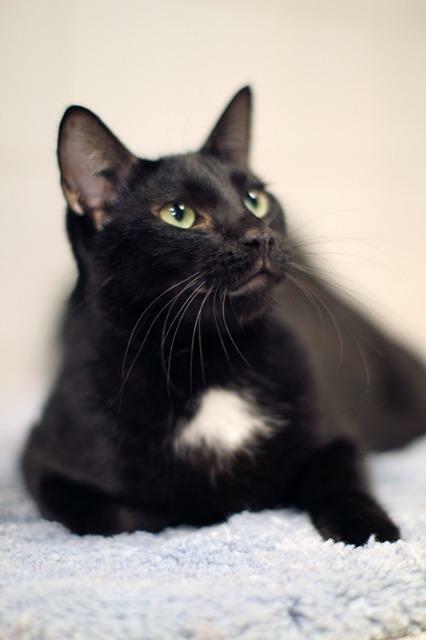 Ripley was found as a stray and is now happy to be an indoor cat. 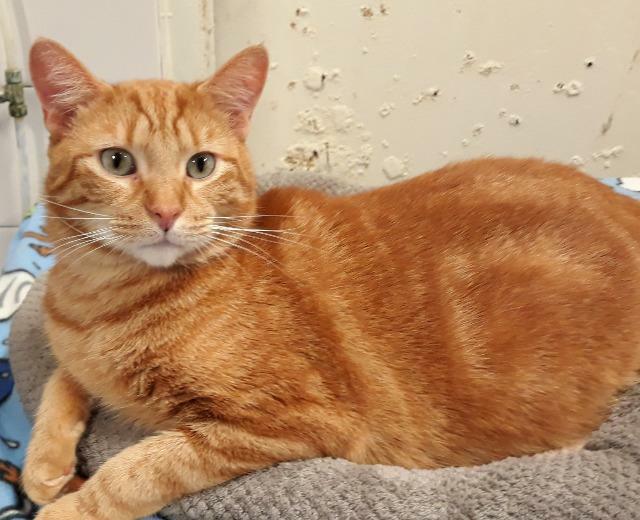 Ripley tends to get overlooked in the shelter because he sleeps a lot, but he craves affection and a home of his own just like the other cats. 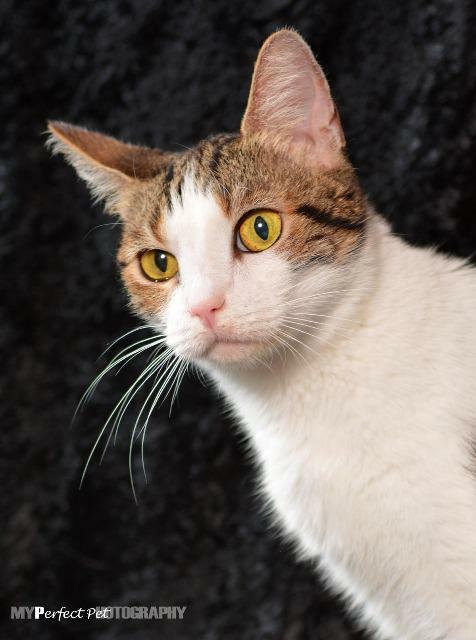 Ripley is waiting to be noticed by that special someone. Come by and visit him Weds-Mon 12-5pm. 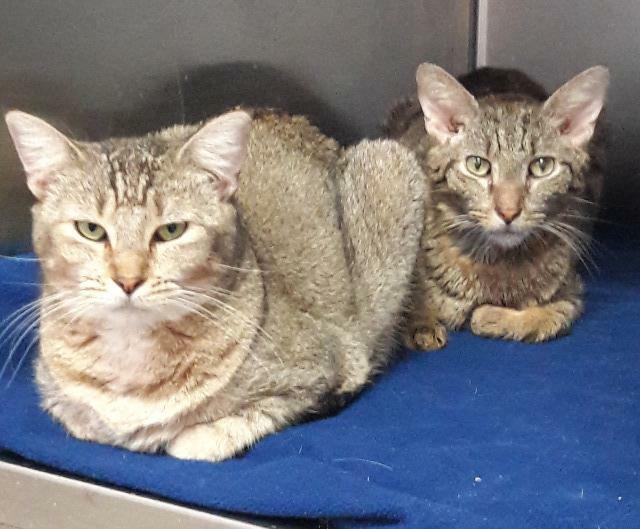 Romeo and Juliet were dumped outside our door in the middle of a hot summer day, thankfully someone noticed them out there and they seemed to be ok. We are guessing they came from the same home, Juliet is more shy and nervous, Romeo is also a little shy but loves attention. Come visit them Weds-Mon 12-5pm. 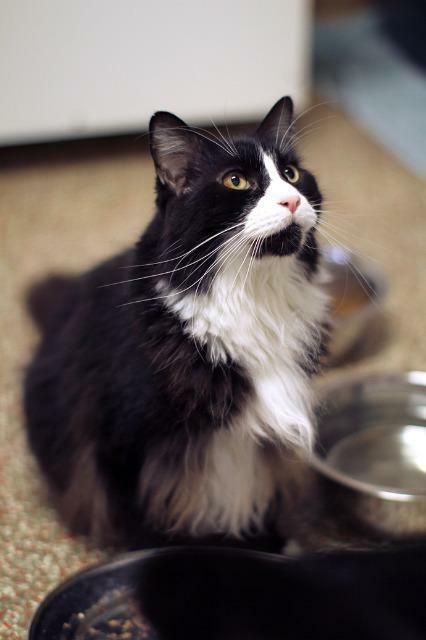 Rue came into our shelter when he was just a kitten, he was adopted a few months after he came in and then returned a few years later because the previous owner had medical issues. 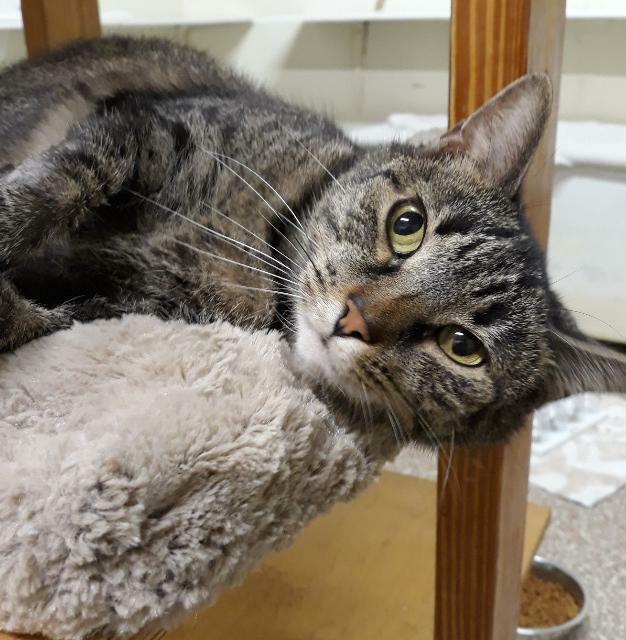 He is a very sweet boy and is hoping he can be in a home again soon. Come visit him Weds-Mon 12-5pm. I was dropped at the shelter's door one morning as a kitten with 2 siblings. I'am a little shy but with a lot of love and patience and the right person I will learn to trust you and become your best friend. Come in and visit me Weds-Mon 12-5pm. Animal Age: 7 years 7 months. 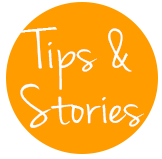 Scare Crow was brought to us when his owner could no longer keep him because he was moving. His other housemates found homes but Scare Crow is still waiting. He used to hide all the time, but he has come out of his shell and now he's a big love bug who just wants his head rubbed. 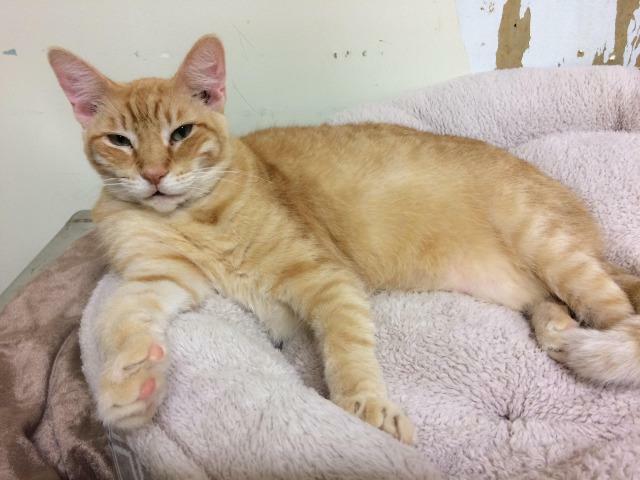 He will appreciate a quiet, low-key household where he can lounge and feel safe. 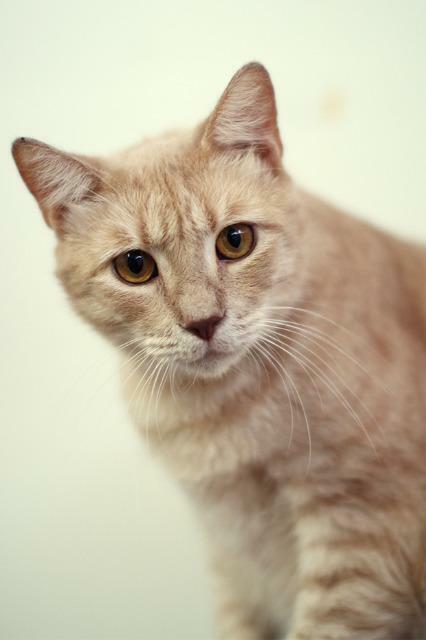 If you're looking for a mellow companion with a soulful face who will be loyal to you, you must meet Scarecrow! Weds-Mon 12-5pm. 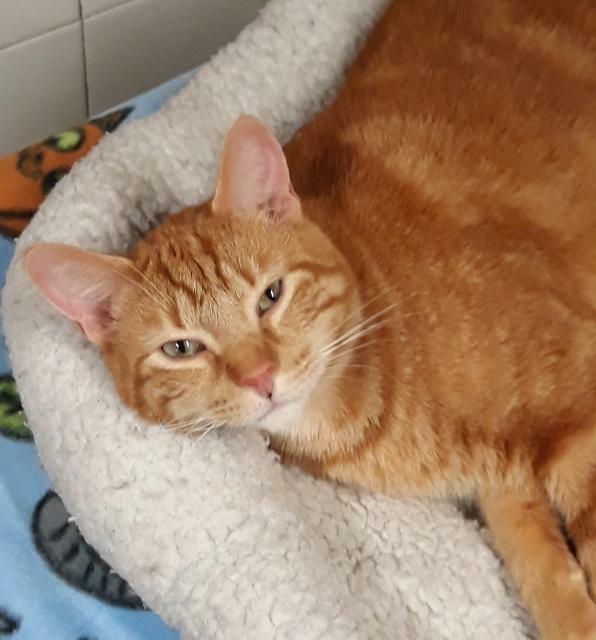 Scotty has been here since he was a kitten, hes getting order now and has some medical issues that are easily treatable but other than that hes a happy sweet boy. Come visit him Weds-Mon 12-5pm. Selene was left at our front door in a carrier. 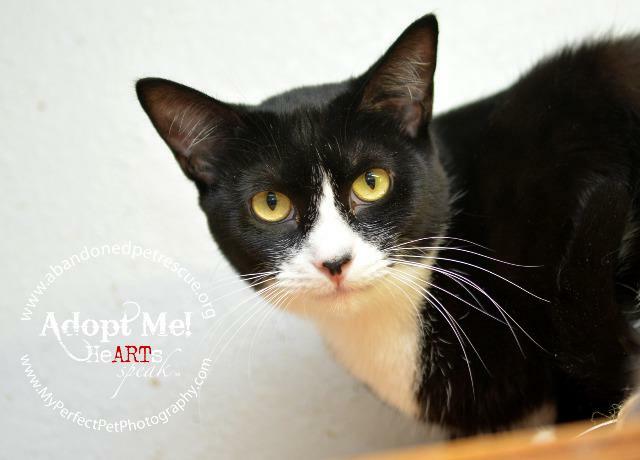 She is outgoing and social, loves affection! 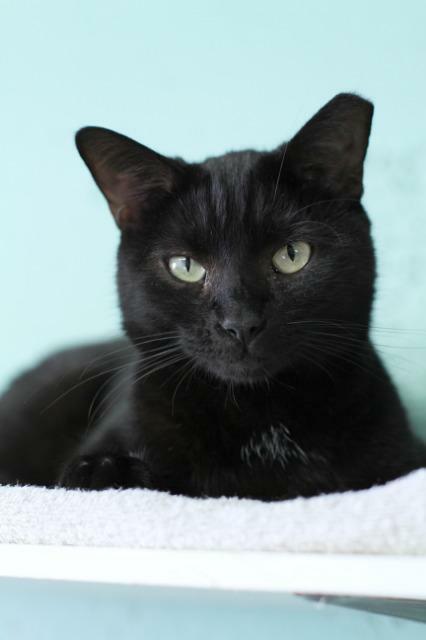 Selene will give you endless kisses, and she has a big, relaxing purr! Come visit her Weds-Mon 12-5pm. Animal Age: 13 years 11 months. 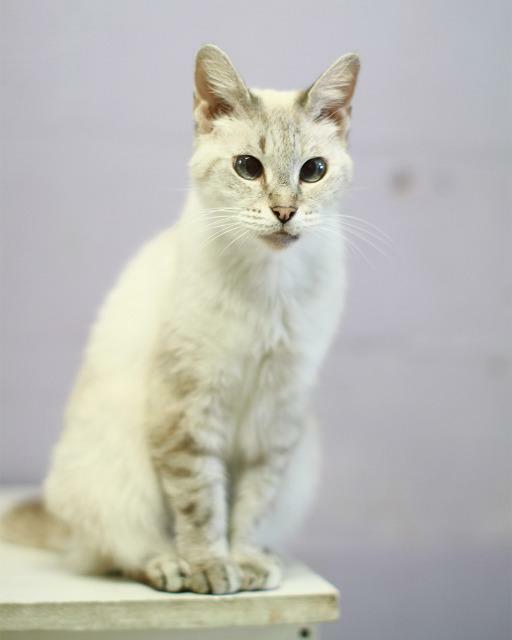 Sissy is a beautiful Siamese mix who has been at the shelter for several years. 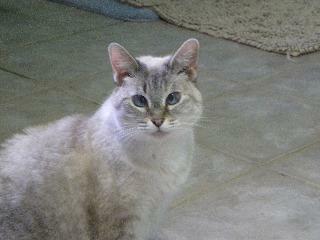 She is something else -- even though she is not totally Siamese she definitely has the attributes of a purebred! Fiesty, funny, smart and interesting. Once she knows you she is your friend for life. 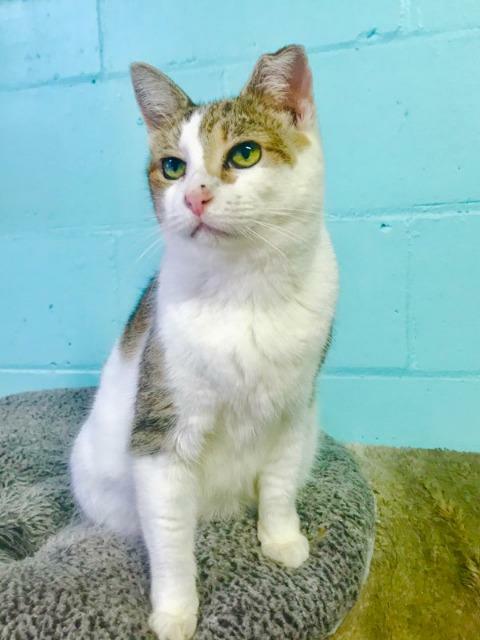 Sissy has been here for a long time so she would have to go to a very special home who is willing to be patient and able to care for her since she is now entering her senior years. She is a very special girl and deserves the best. Come visit her Weds-Mon 12-5pm. 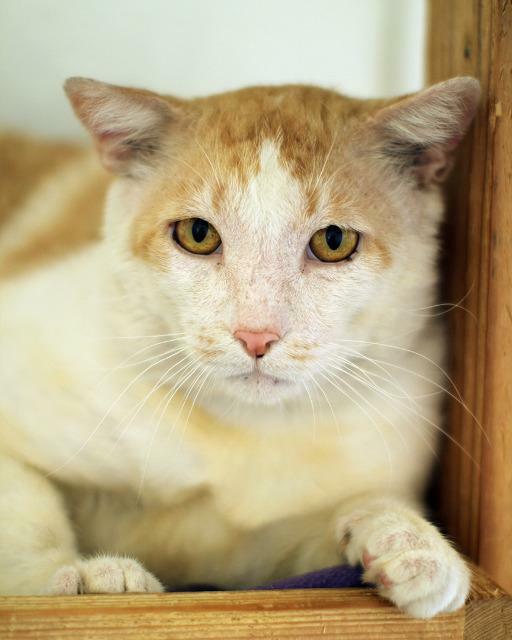 Scampers is an active, friendly boy ready for a new adventure. He and his brother Otto came in together as strays and are just happy to be alive. 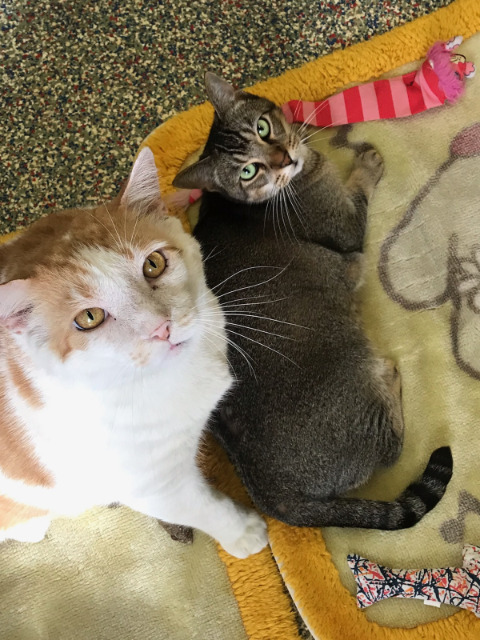 If you are looking to add a little life into your quiet home come by to meet Scampers and Otto Weds-Mon 12-5pm. Animal Age: 10 years 6 months. 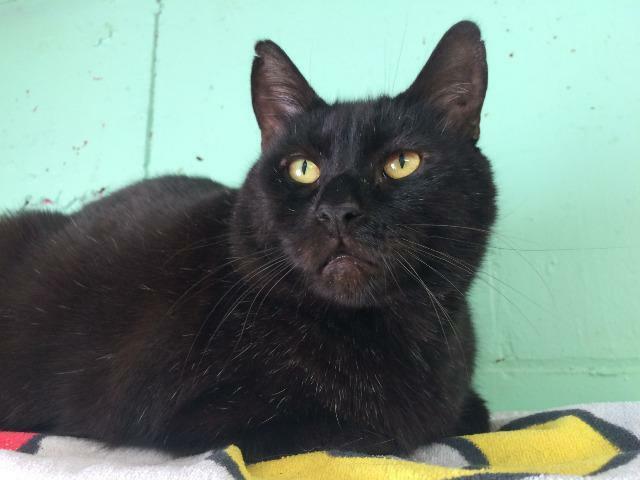 Sneaky Pie is a sweet beautiful black cat, his only problem is that hes FIV positive which is not contagious to other cats unless he bites one. 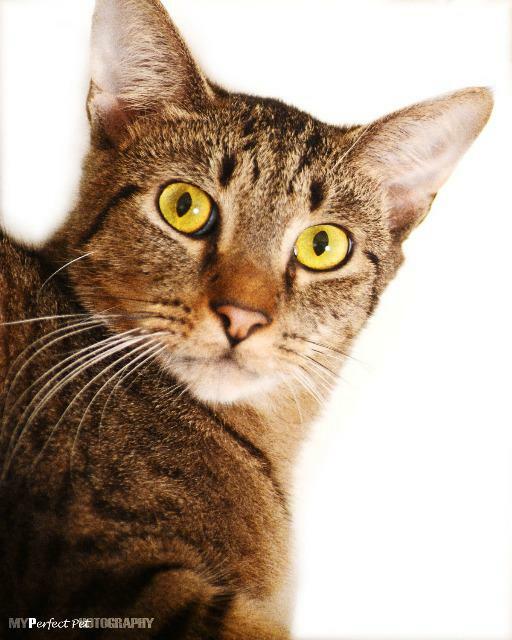 FIV is not transmittable to humans. Sneaky Pie was being cared for as an outdoor cat for about eight years, he was recently showing up at another person's home and unfortunately the lady's other cat did not like him so much. He loves to be brushed and he gives love bites, sometimes can be a little rough but he means no harm. Come visit Sneaky Pie and his roommates Manny and Dove Weds-Mon 12-5pm. 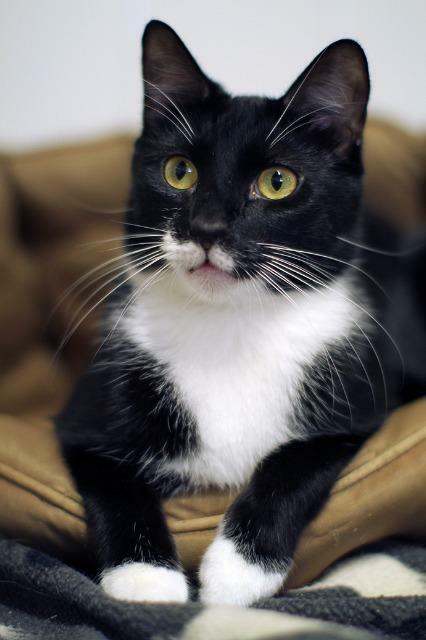 Sparrow has been at our shelter since he was a kitten, with his mother Dove and other siblings. 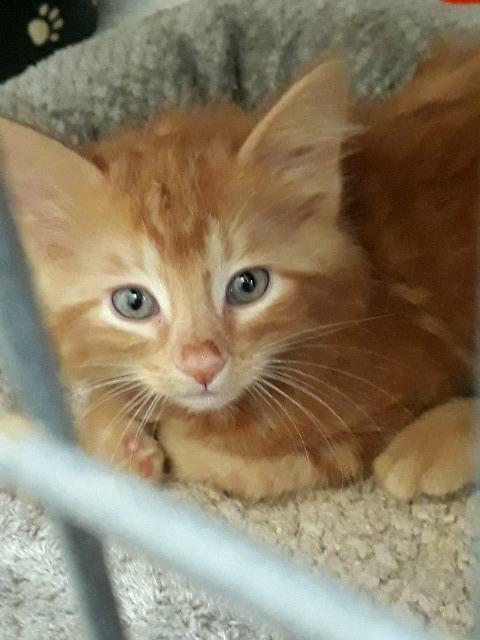 He is still waiting to find his forever home with his sister Birdie and also mother Dove who is located in our FIV room (kittens are negative for FIV). 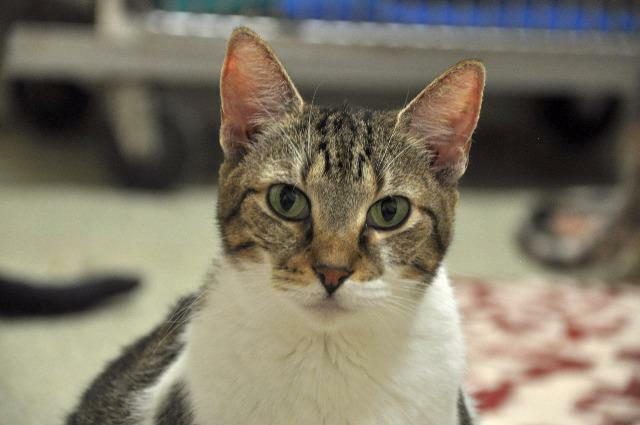 Sparrow is a sweet playful boy and just loves to cuddle. Come visit him and his family Weds-Mon 12-5pm. Animal Age: 9 years 6 months. 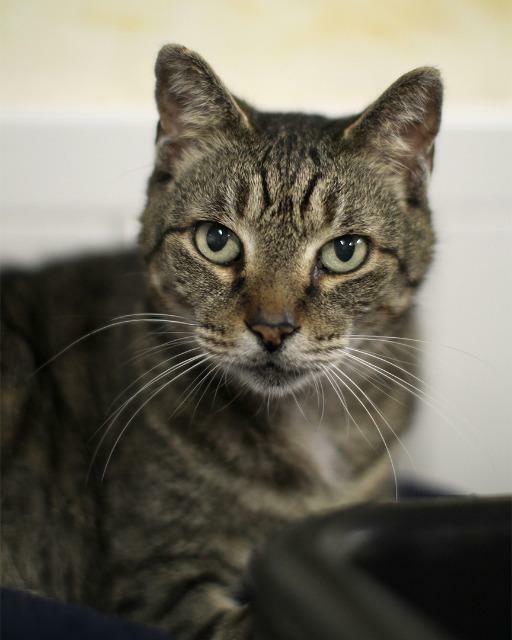 Stan has been with is for many years, he is a bit shy and does not like people to invade his space. He does love hanging out with his kitty friends Keller and Lil Pastel. 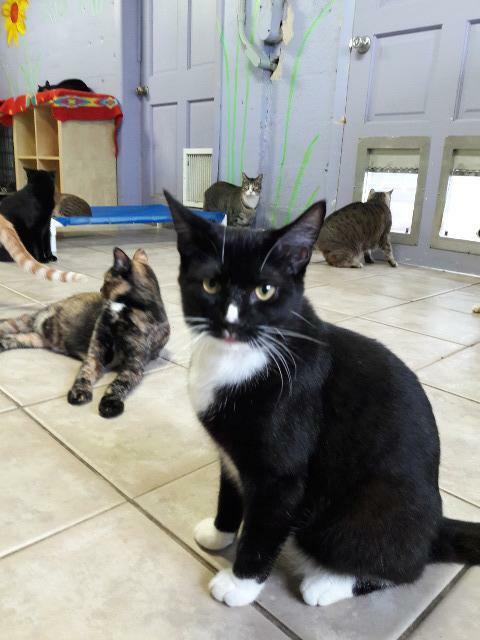 Come by and visit Stan and his friends Weds-Mon 12-5pm. 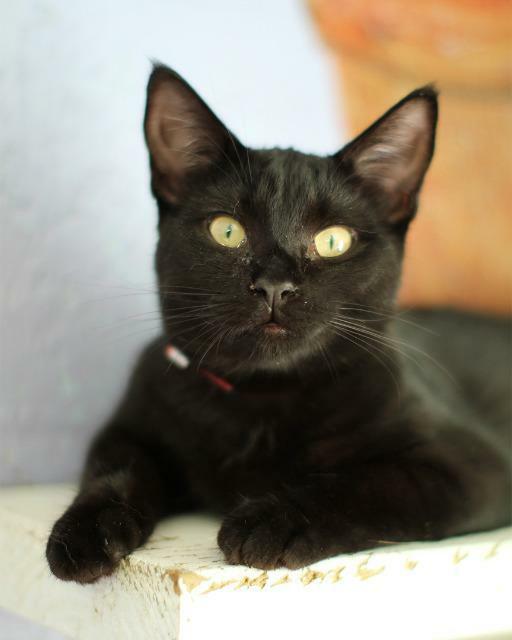 Star and her sister Night were both fostered as kittens and currently looking for their forever homes. Both are a little shy but very sweet. It may take a lot of visits before both are ready to go home, they usually hang out really high because that is where they feel the safest. Come by and visit them Weds-Mon 12-5pm. Animal Age: 2 years 8 months. Striker was left in a cage at our front door after closing one night and he was crying so loud a neighbor who heard him came and took him in for the night and brought him back to us when we were open. 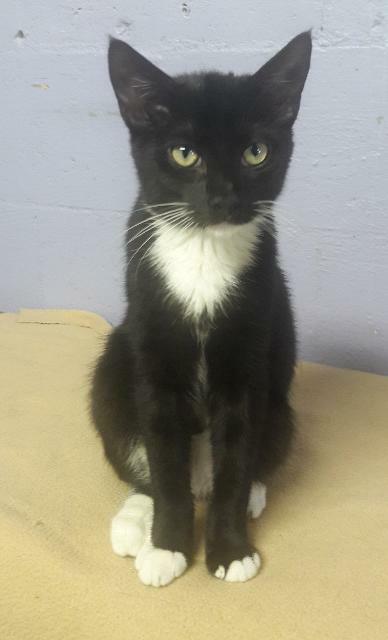 Employees instantly feel in love with this cute little guy, he wasn't terrified at all by being at the shelter and was giving headbutts and rubs the first day he arrived. 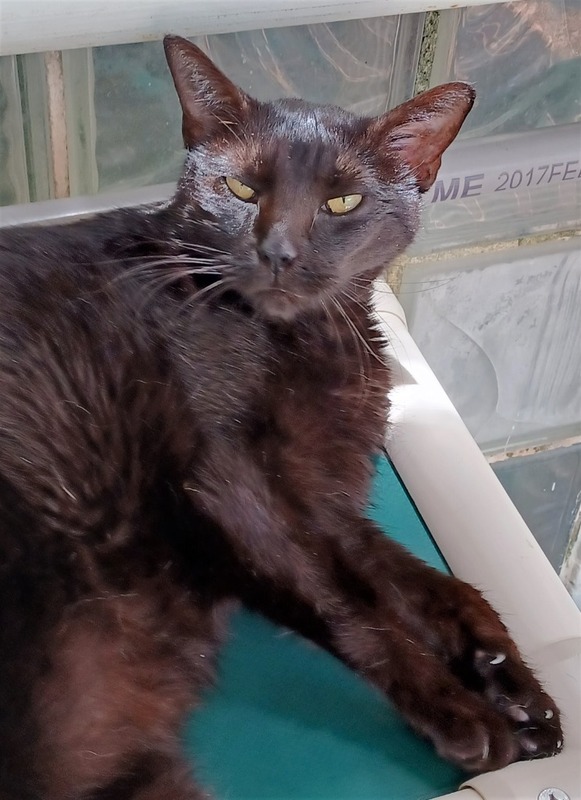 We think he may have been bottle fed as a baby, when he first came in he was very rough with his play behavior but after being in our free roaming room for awhile hes gained quite a bit of weight and has mellowed out. 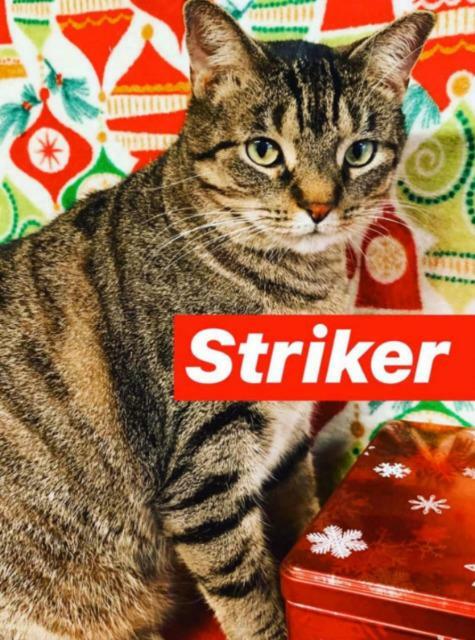 Come by and visit Striker Weds-Mon 12-5pm. 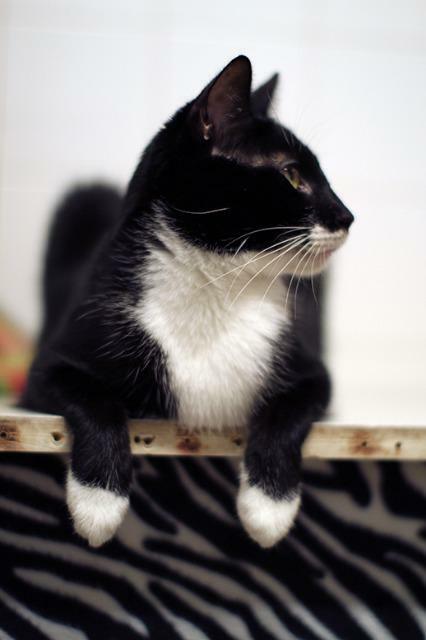 One of the most beautiful cats in the shelter, Sylvester is still here because of his shyness. He came to us with his siblings when he was about 2 months old. However, he has been quiet and reserved since he was small. He has progressed quite a bit and now will let a lot of people brush and pet him; but he does prefer to observe and play by himself. 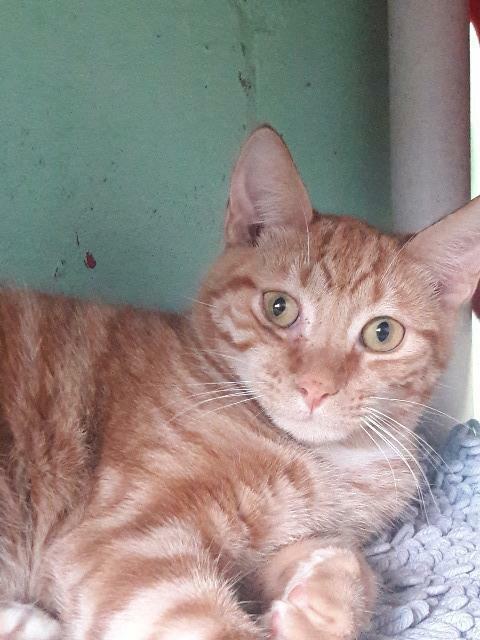 If you are interested in the beautiful boy he will require multiple visits and a lot of patience from you before going home, hes had applications in the past but he has chosen to stay here every time they come to pick him up and take him home. Oh well, I guess this boy just wants to choose who and when he goes home with, will you be that special person he chooses? Come in and find out Weds-Mon 12-5pm. Tart is one of five kittens found as strays with their mother. Mom is a bobtail or manx and some of her kittens inherited the bobtail. 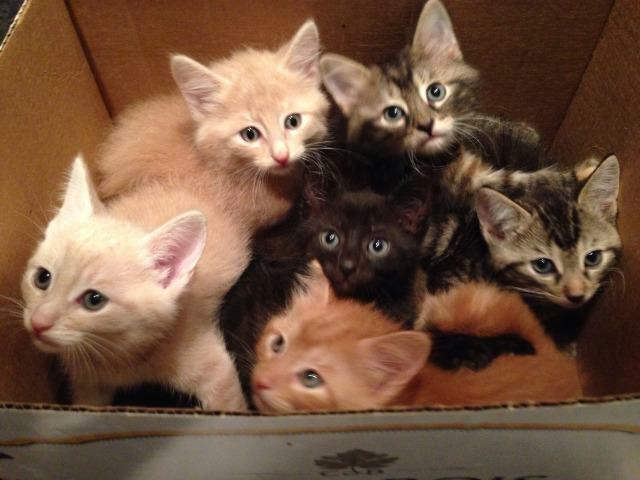 They are all extremely cute and are ready to find their forever home. Come visit them Weds-Mon 12-5pm. Animal Age: 15 years 11 months. 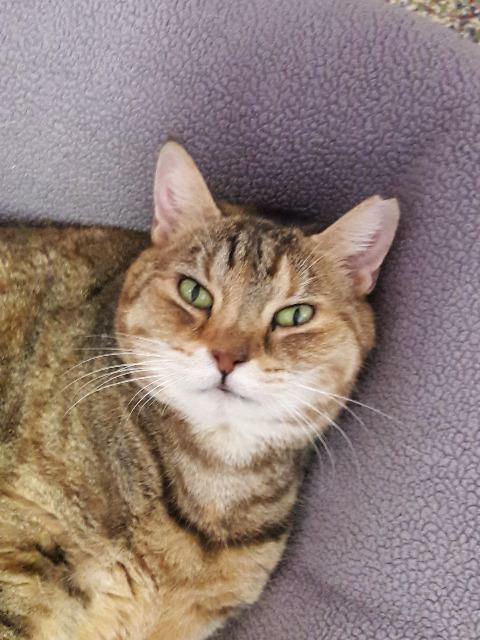 Tia is a beautiful golden tabby, she was owned previously but there were too many animals in the household and she was surrendered along with two other siblings to APR. She is a very sweet girl, loves to eat and just sleep all day. She does have a few medical issues, she has diabetes and is on daily insulin injections. 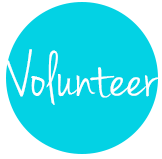 She would do best going with someone who has experience with treating a cat with diabetes. If you are interested in Tia come meet her Weds-Mon 12-5pm. Animal Age: 4 years 7 months. Stalker was brought to us with his sister Belle, at first we thought they were feral but we decided to keep them when we realized how friendly they were. He got the name Stalker from one of our employees because he follows you around the room seeking attention constantly. 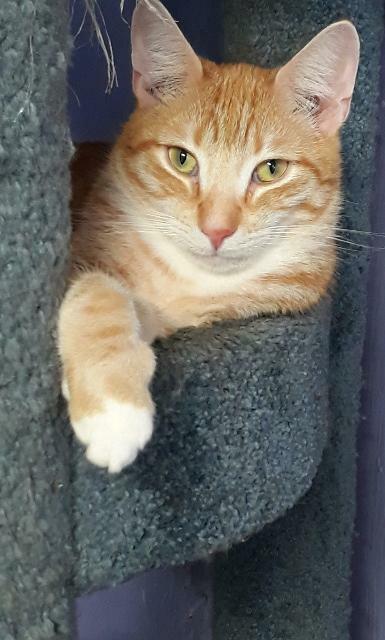 Come in and visit him Weds-Mon 12-5pm. Animal Age: 3 years 8 months. 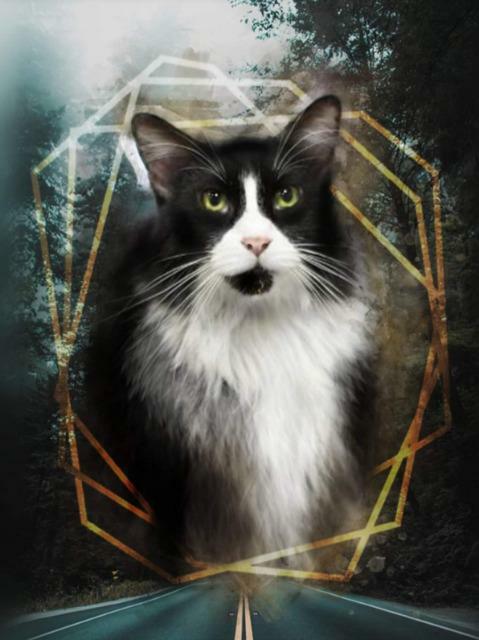 I was born into a feral colony and was hand raised by volunteers at Abandoned Pet Rescue. Someone had poisoned my mother and some of my siblings also. They had to be humanely euthanized, but I had not nursed yet on the poison, so I survived. 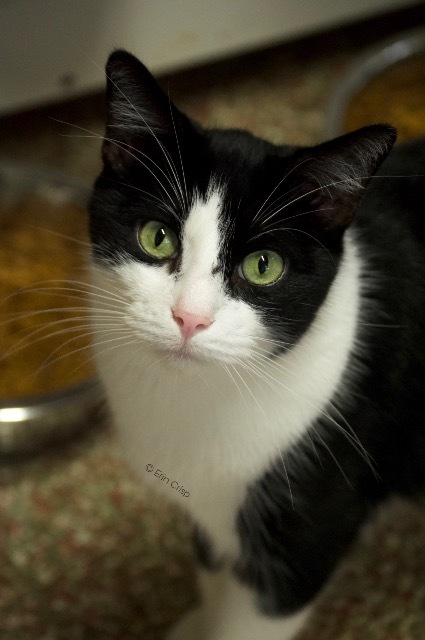 My sister Caicos was adopted awhile ago and I'm still here waiting for a loving home. 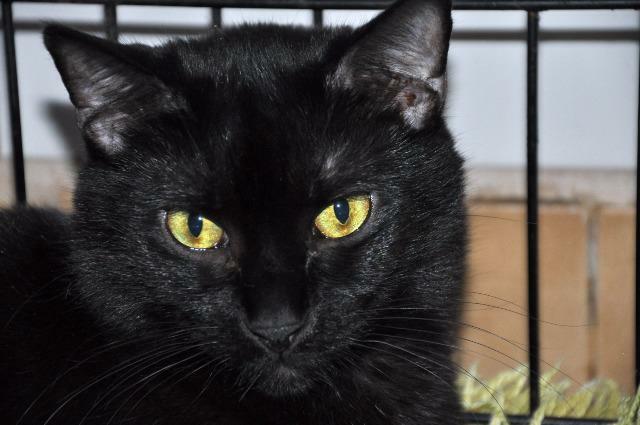 I am a friendly, social cat with a calm personality, waiting to begin life as your awesome house cat! Come by and meet me Weds-Mon 12-5pm. 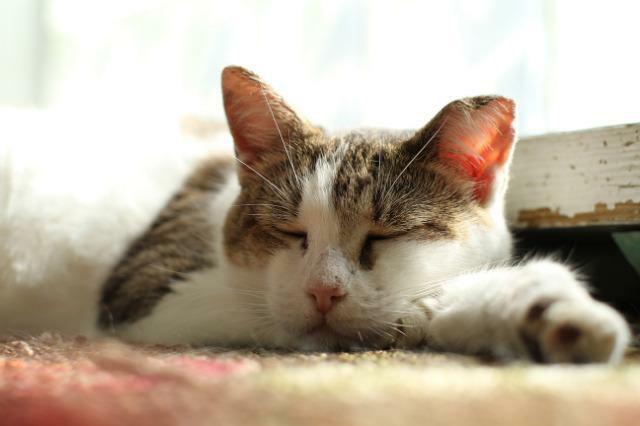 Tweety has been here since she was just a kitten with her mother Mittens and four other siblings. 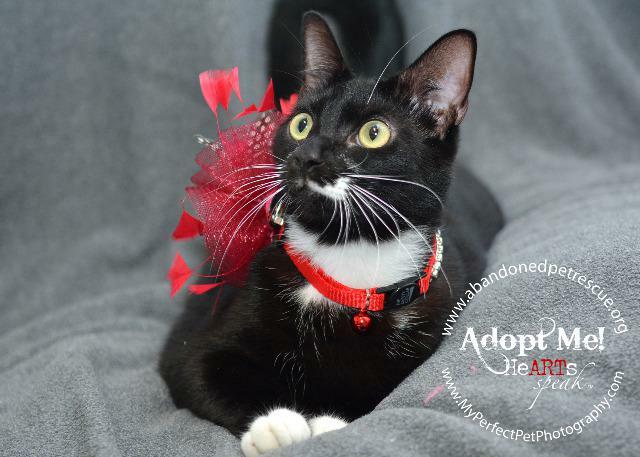 She is still looking for her forever home with sister Lola, brother Pepe Le Pew, and mother Mittens. 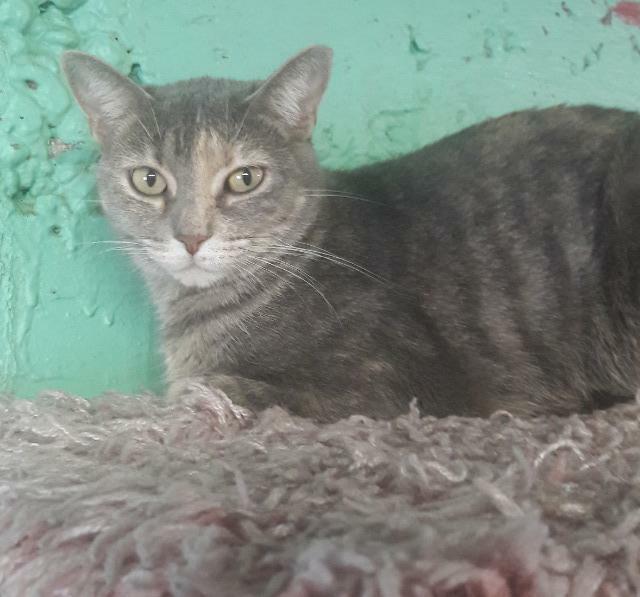 Shes a sweet girl and would love to find her forever home. Come by and meet her Weds-Mon 12-5pm. Venus Kelly & Victor Emmett were rescued as young kittens with their mom and one other brother who did not survive. Mom was already pregnant again and had no milk for these babies. We have no idea how long they were unable to nurse and how they were able to stay alive. 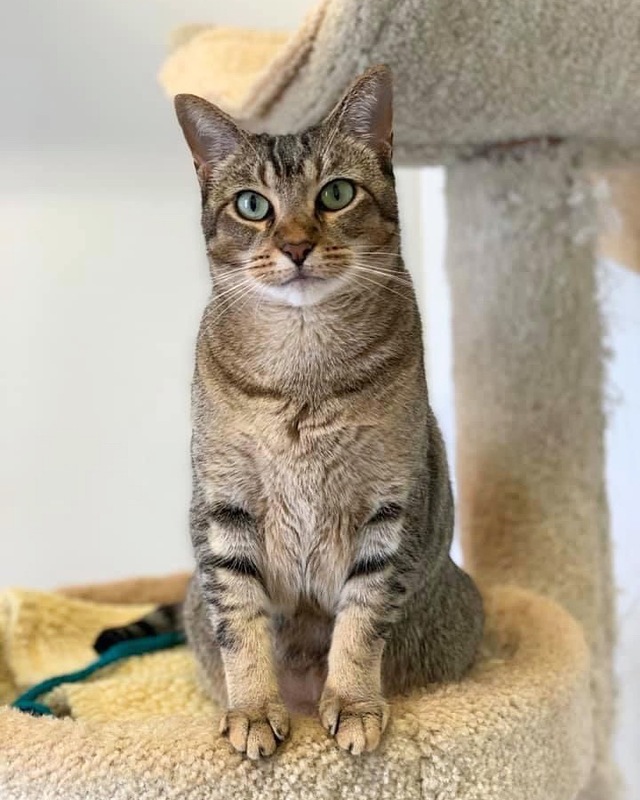 Never having been touched by a human made them very hesitant at first, but now they are extremely affectionate and ready to be adopted if only someone would fall in love with one or both. 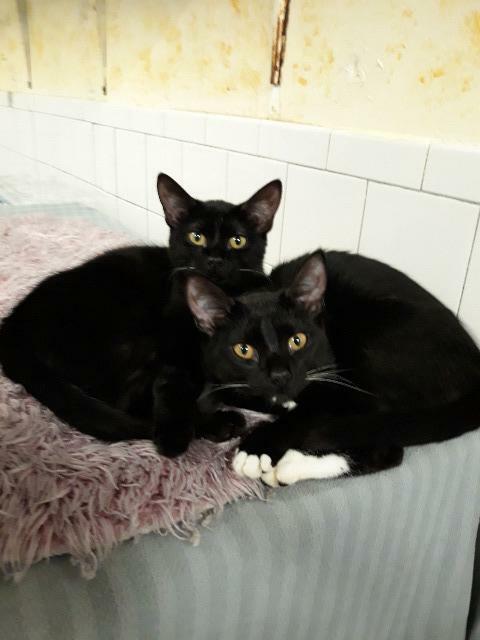 Venus and Victor are now adults, they have been here many years waiting for their forever home, come in and visit them Weds- Mon 12-5pm. Venus Kelly & Victor Emmett are young kittens who were rescued with their mom and one other brother who did not survive. Mom was already pregnant again and had no milk for these babies. We have no idea how long they were unable to nurse and how they were able to stay alive. Never having been touched, played with or loved by a human these 2 siblings were at first not happy with all the fuss that was made over them, but they love it now. 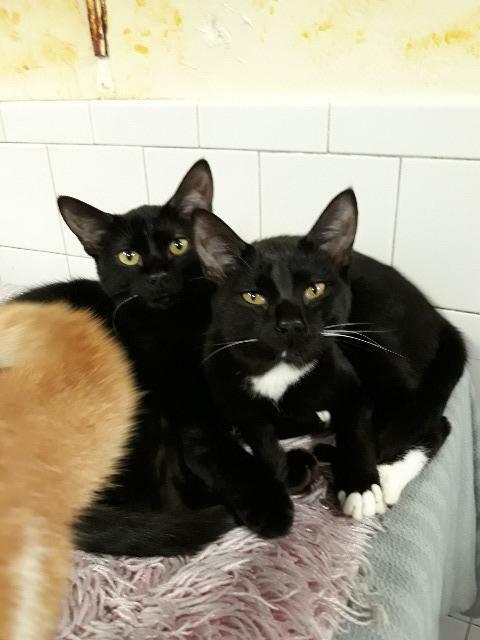 Venus and Victor are now adults, they have been here many years waiting for their forever home, come in and visit them Weds-Mon 12-5pm *Victor has medical issues, he has had urinary tract infections and is on a special urinary food and has been doing well! Animal Age: 10 years 3 months. 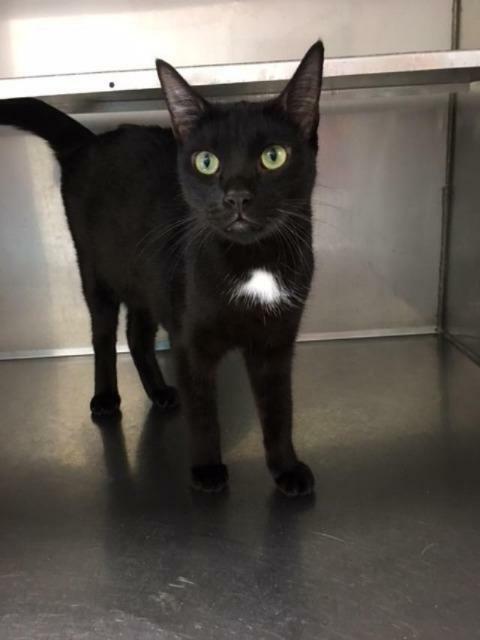 Victoria was found by someone who said they say her get thrown out of a moving car. 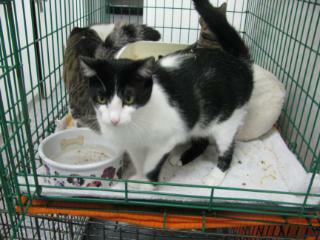 She was uninjured and seems to be happy and content here at the shelter. Come visit Victoria Weds-Mon 12-5pm. Wilhem was found by one of our volunteers in the middle of the road in the medium. He had a broken leg, possibly thrown out of someones car. 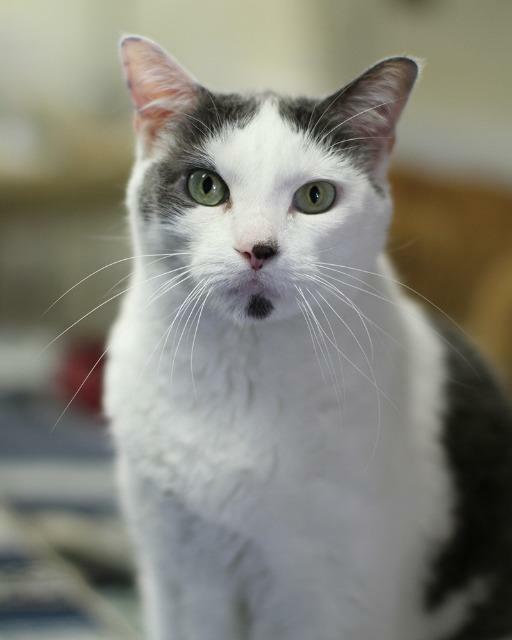 He has successfully recovered from surgery and is ready to find his forever home! 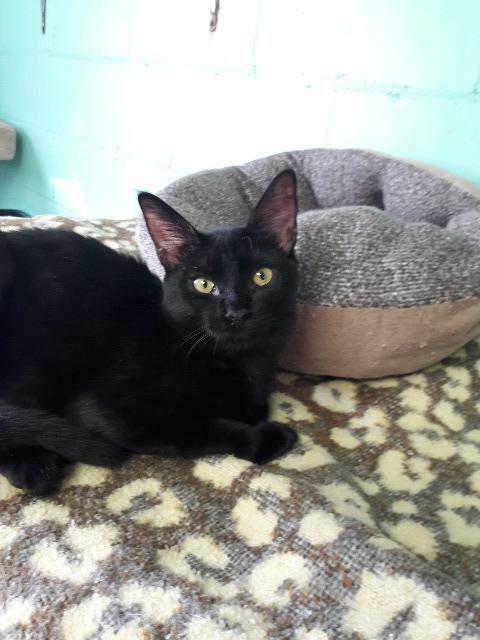 He is a very very sweet little kitten, just loves to be petted and cuddled. Come see him Weds-Mon 12-5pm. 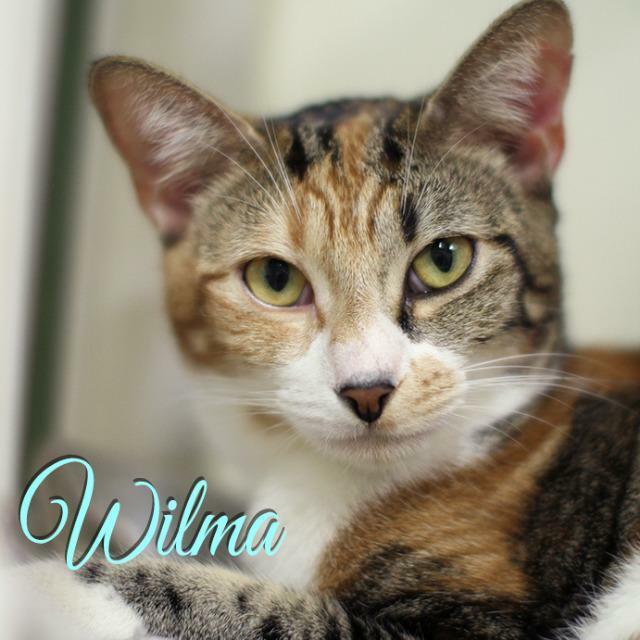 Wilma was unfortunately not properly socialized as kittens and is very shy, she won't let anyone touch her. 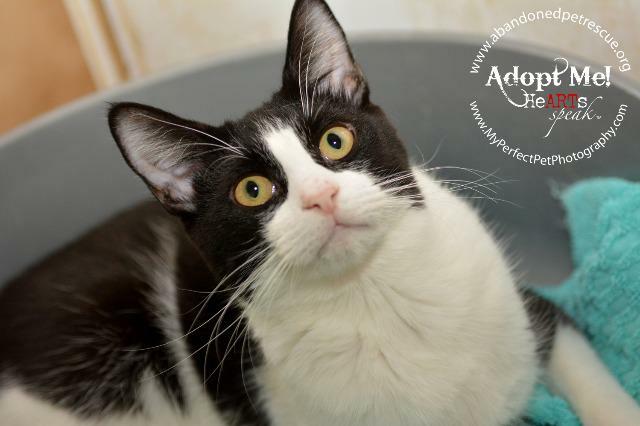 She is a beautiful girl and still deserves a loving home. If you are interested in her she will require multiple visits to gain your trust. Come see her Weds-Mon 12-5pm. 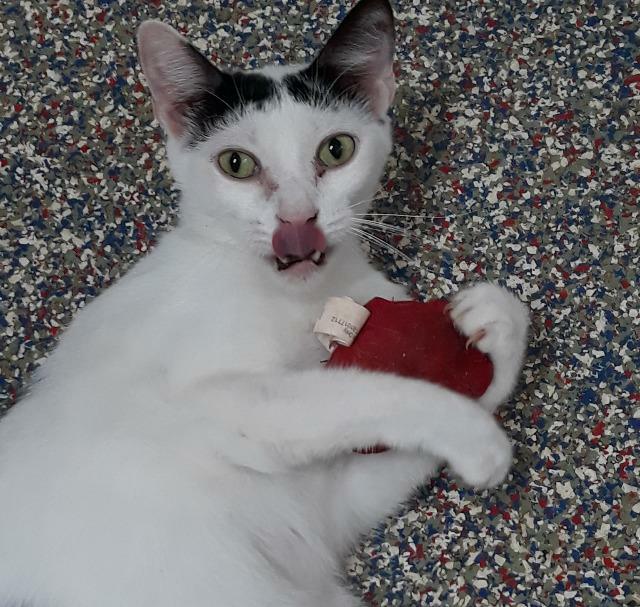 Yeti was found as stray in one of our volunteer's neighborhood, he had been there for a few months and no one claimed him. He is nervous being in a cage and at our shelter but is starting to adjust well. 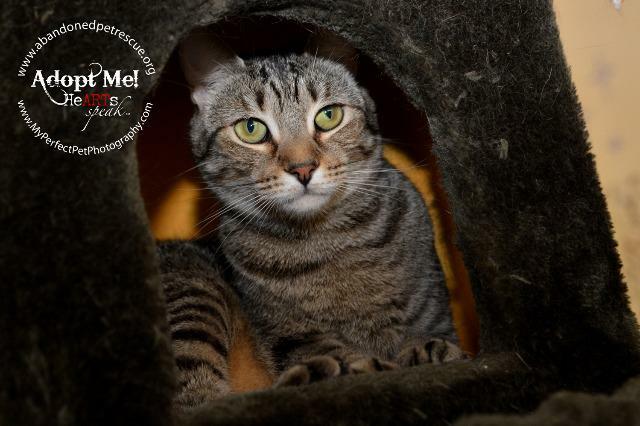 He is an extremely sweet affectionate guy and loves to be petted. 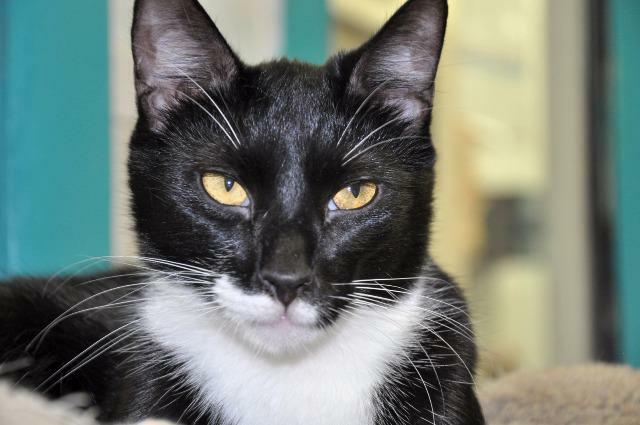 Come meet this sweet boy Weds-Mon 12-5pm. 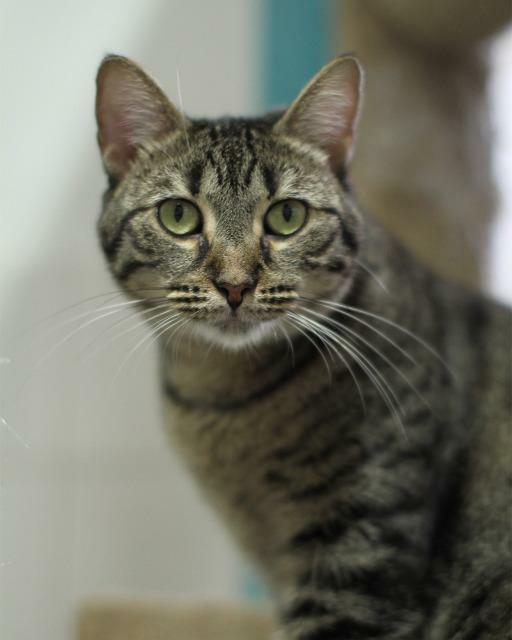 Zia has been here since she was just a kitten, shes a very sweet playful girl and loves to eat! 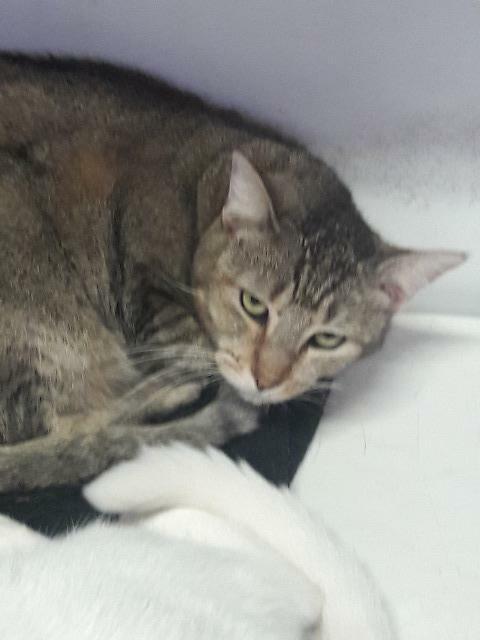 She acts like shes starved all the time but she is a healthy weight and has no medical issues. 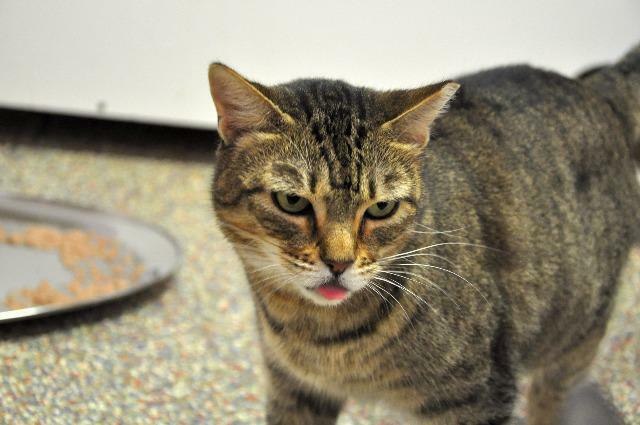 Come in and visit this silly girl and fall in love! Weds-Mon 12-5pm. Animal Age: 8 years 0 months. 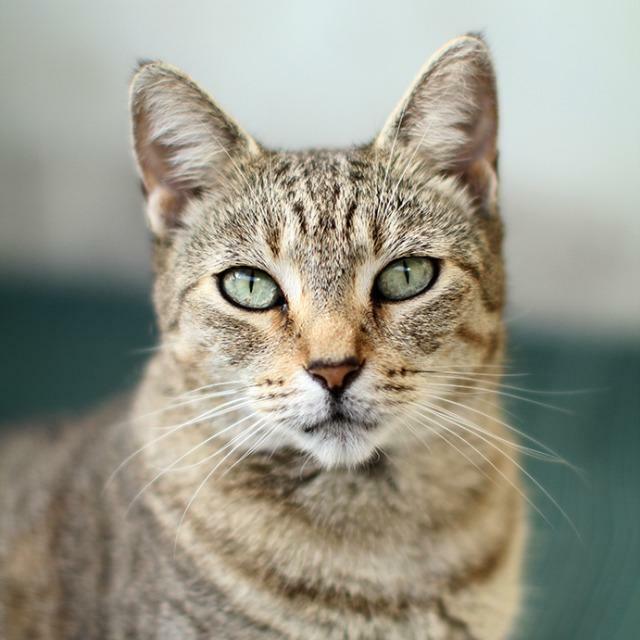 Zula came into the shelter as a small timid tabby but has come a long way. She likes being able to run, play and climb and the room she is in is large enough for her to do all of that. 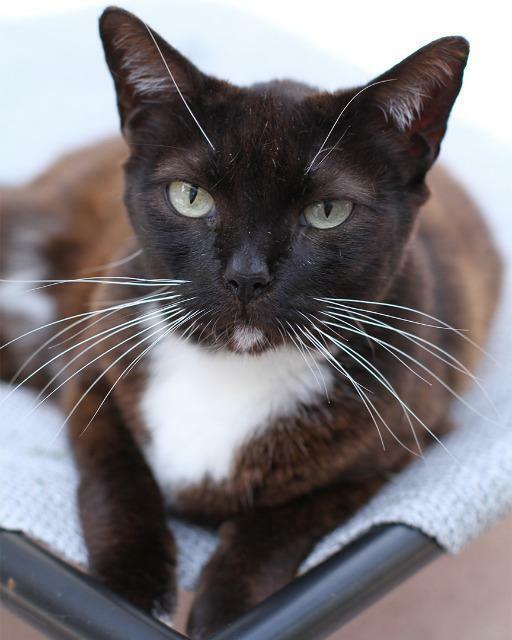 She is also able to go outdoors and take sunbaths which she also enjoys. 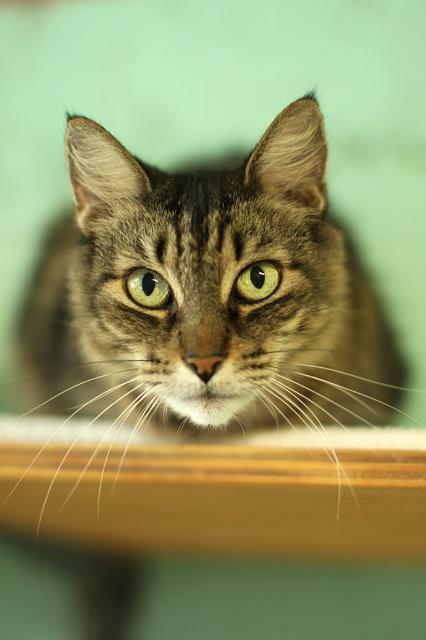 She would love to hang out at your house, come visit Zula Weds-Mon 12-5pm.